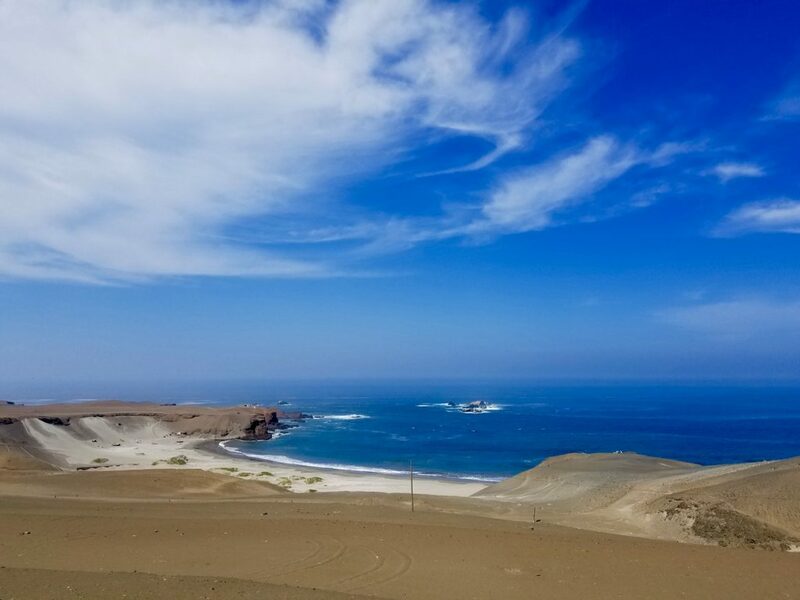 Crossing from Ecuador to Peru once again a simple and friendly process. 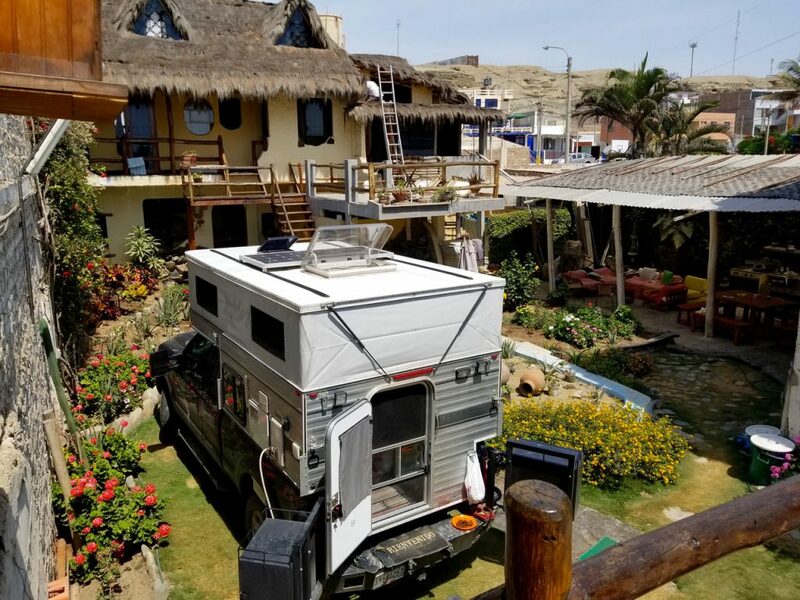 First stop was at the popular Swiss Wassi, a friendly oasis for overlanders owned by a Peruvian/Swiss couple on a nice stretch of beach in the otherwise very rough and gritty Northwestern Peru. 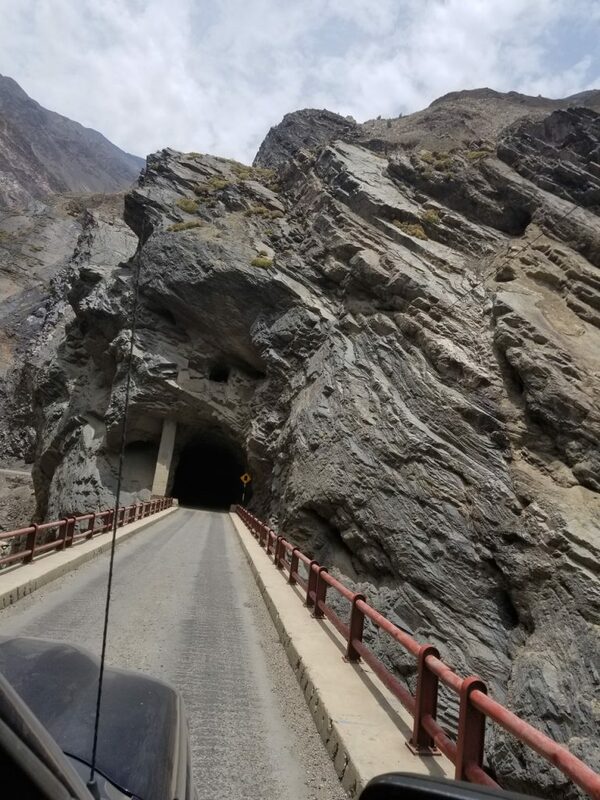 Swiss Wassi provided a nice respite from the road before tackling a long and mostly unpleasant few days of driving south. 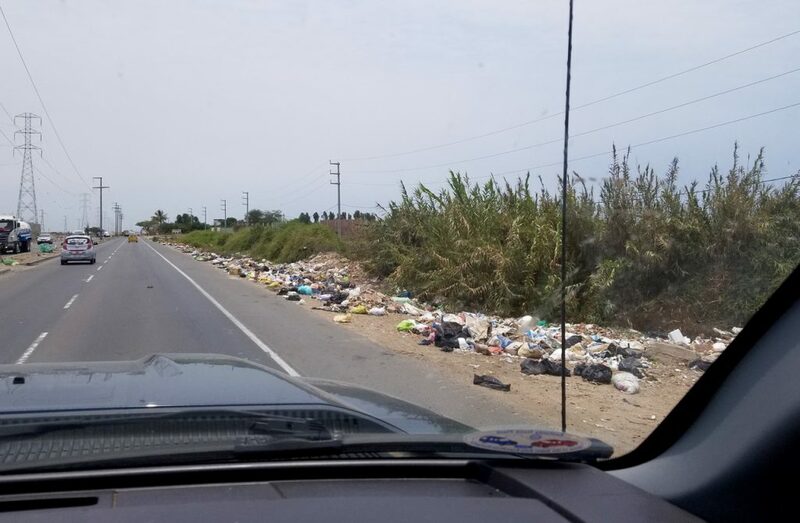 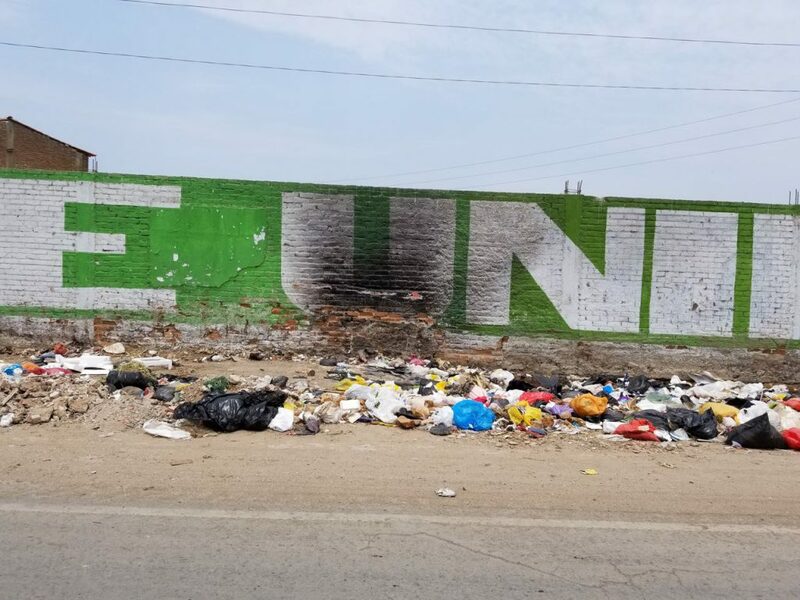 The garbage lining the streets in Northwestern Peru was shocking. 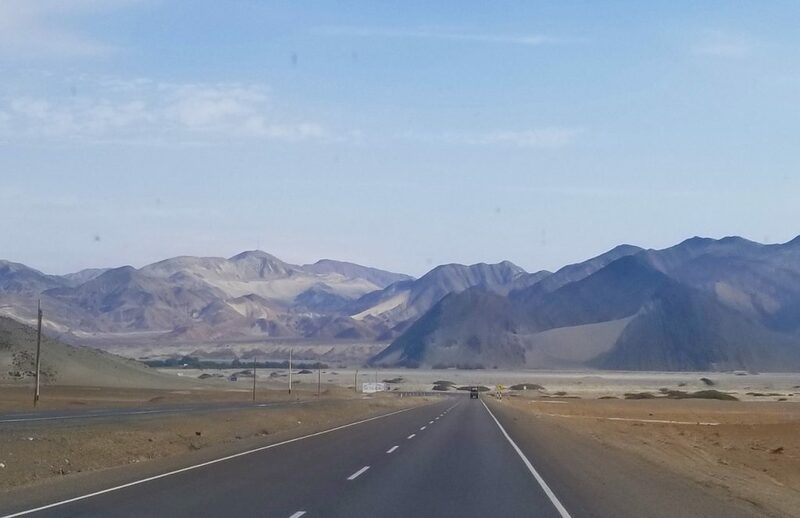 We worked our way pretty quickly through the northern portion of the country. 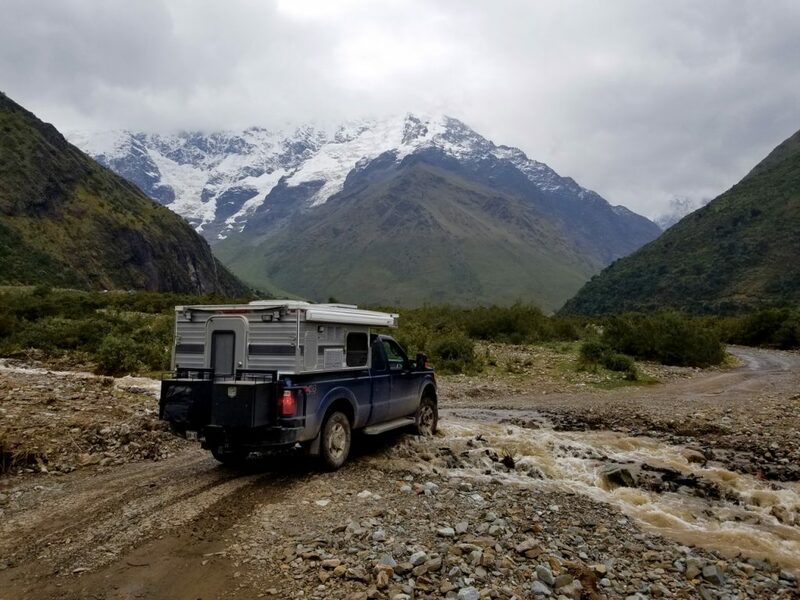 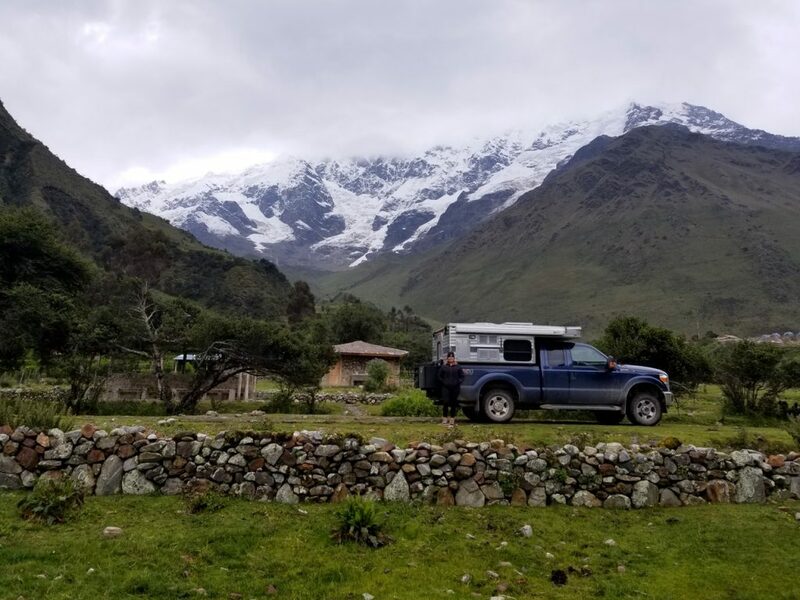 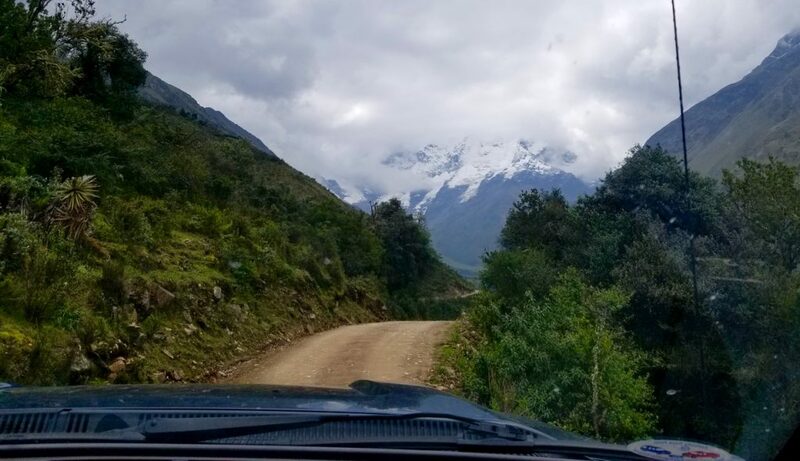 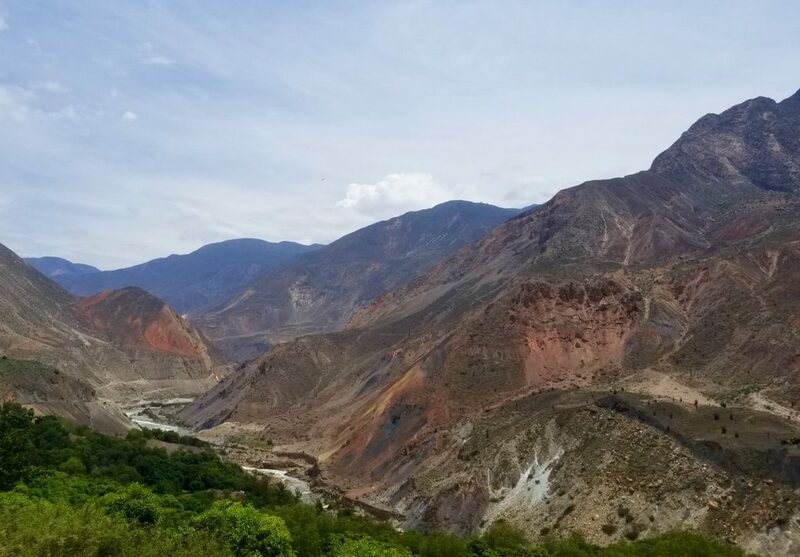 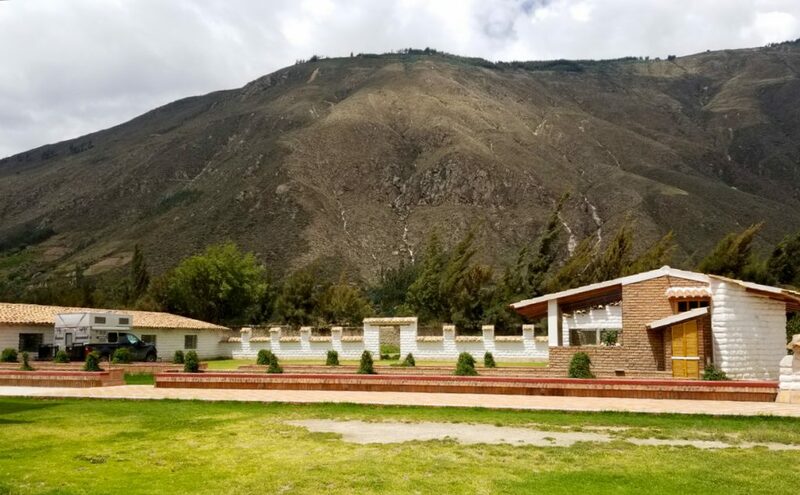 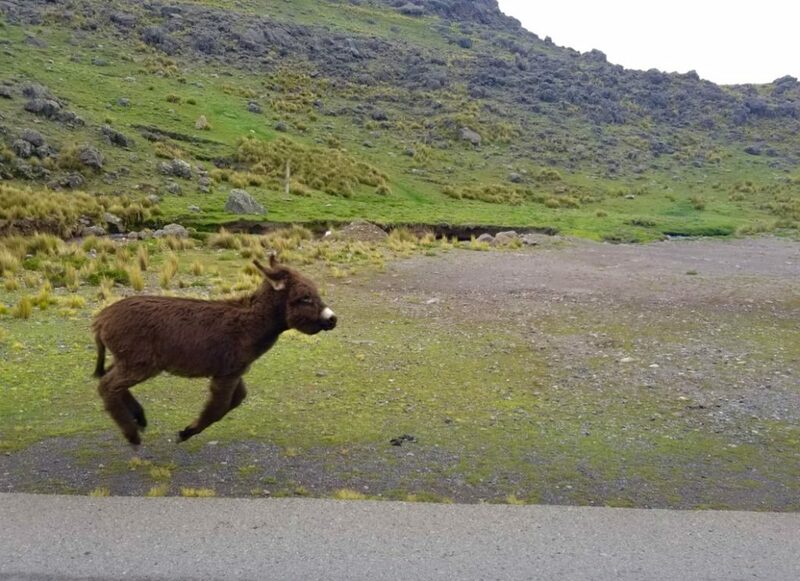 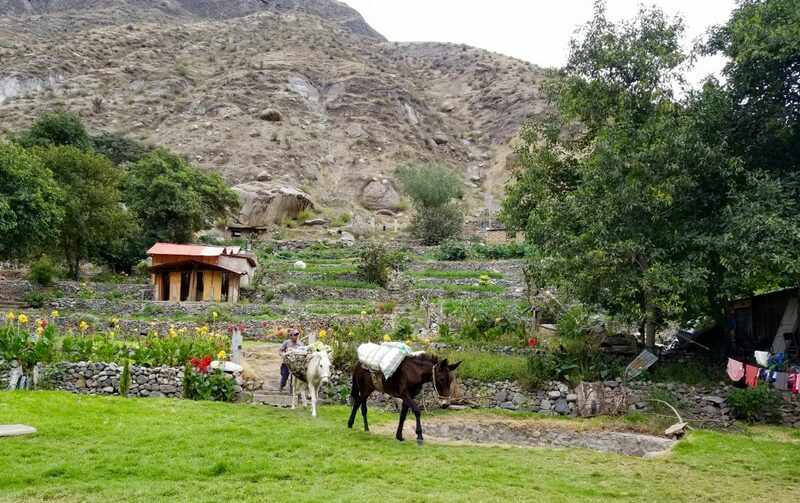 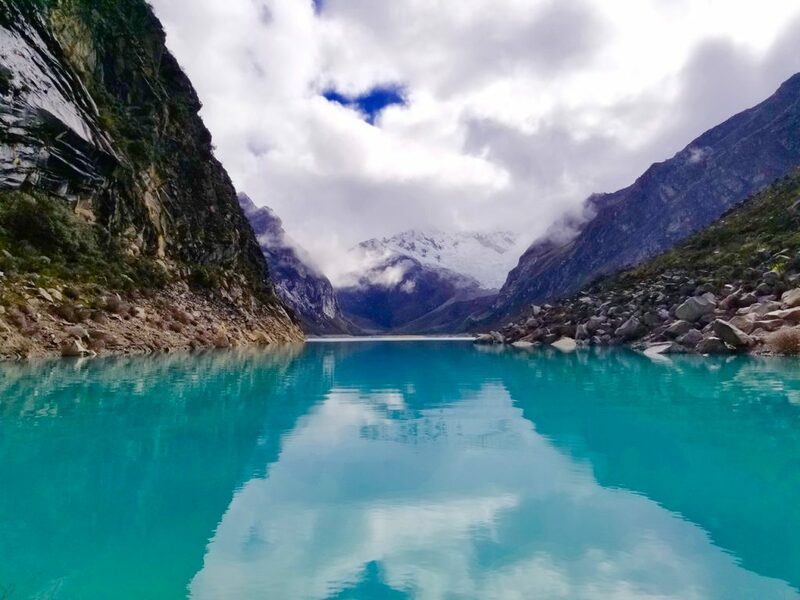 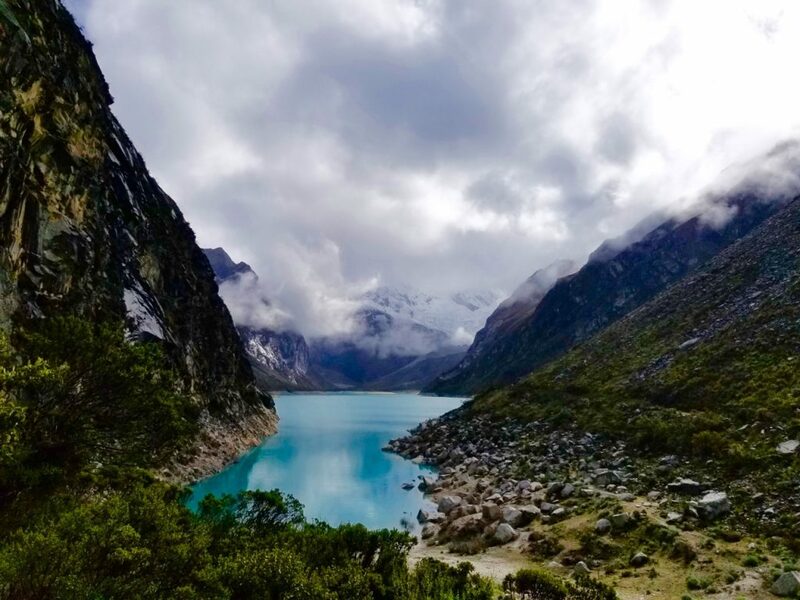 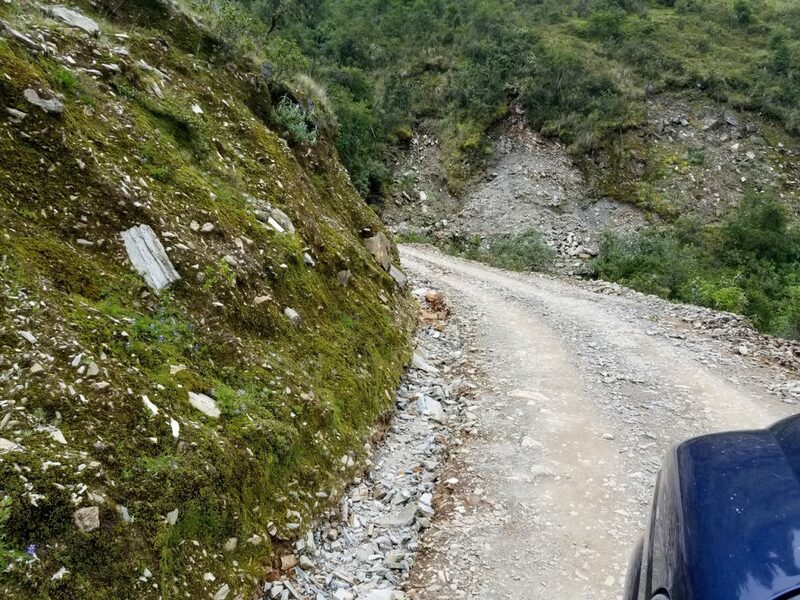 A couple of beach towns did the trick to break up the drive but it wasn’t until we reached the Cordillera Blanca area that we started to appreciate Peru’s beauty. 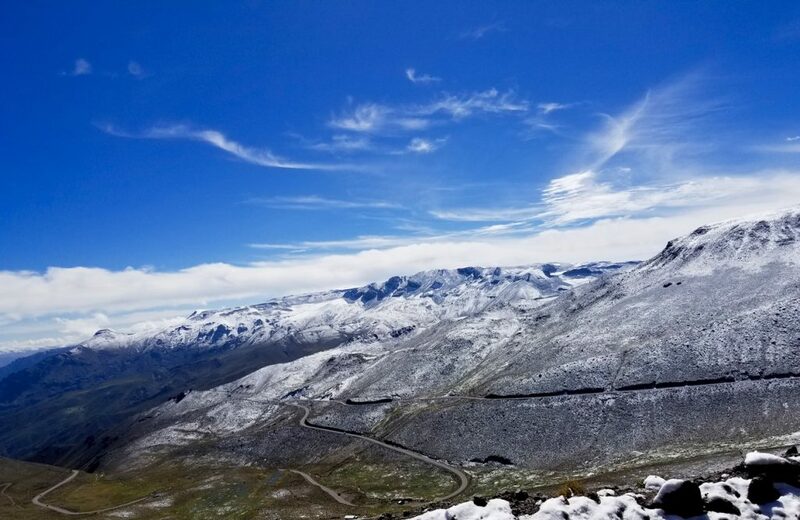 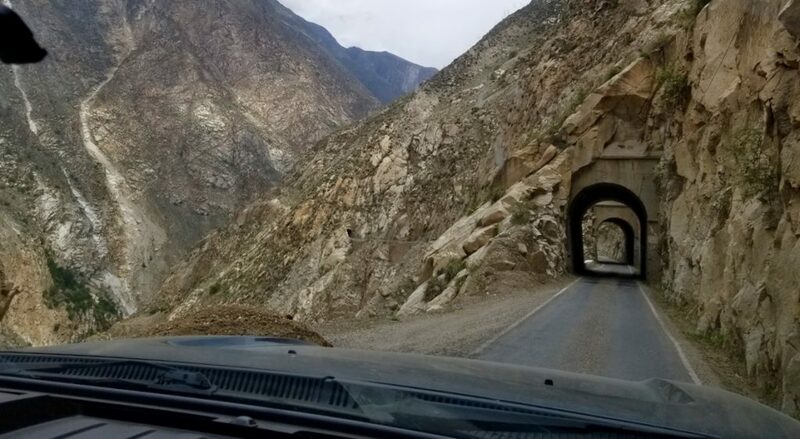 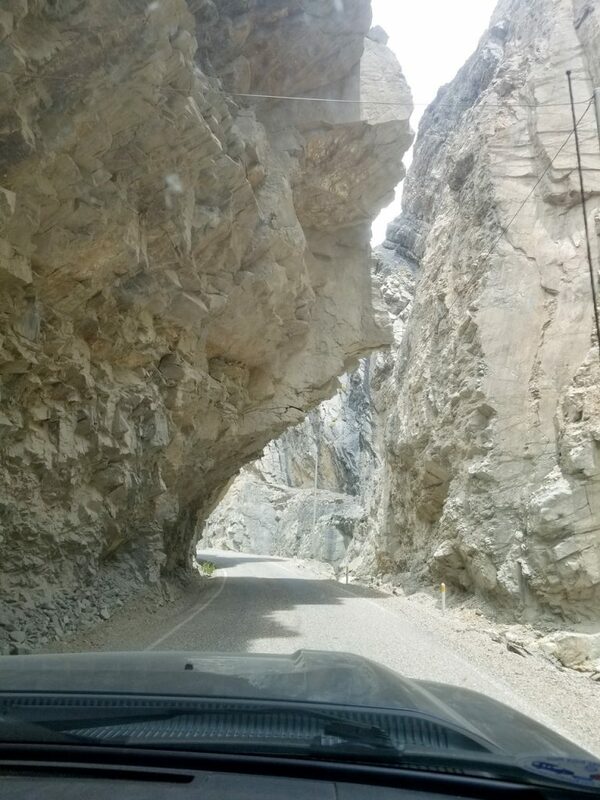 The drive towards the Cordilla Blanca winds through stunning mountain passes and a crazy network of hair-raising tunnels. 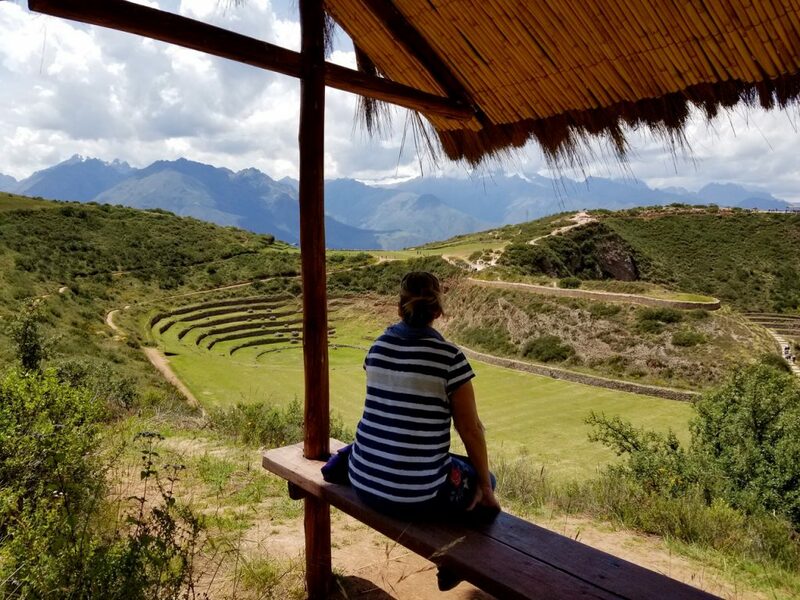 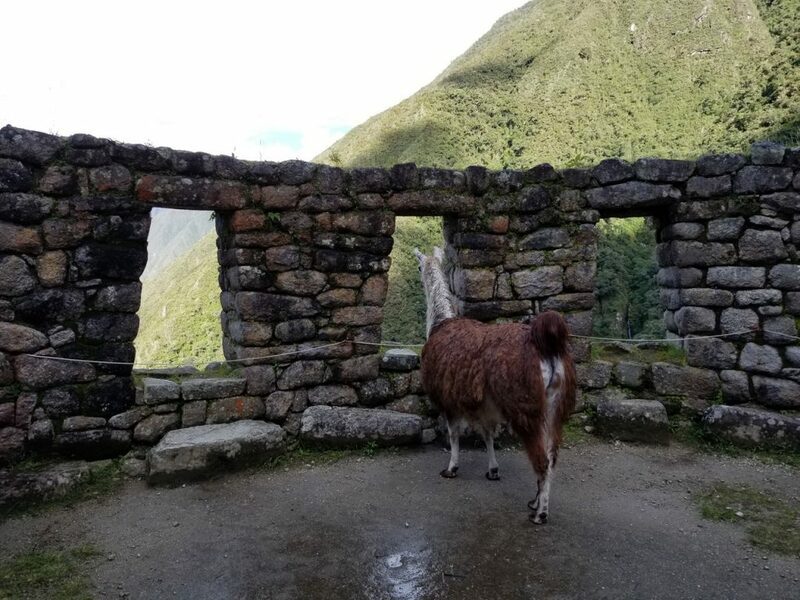 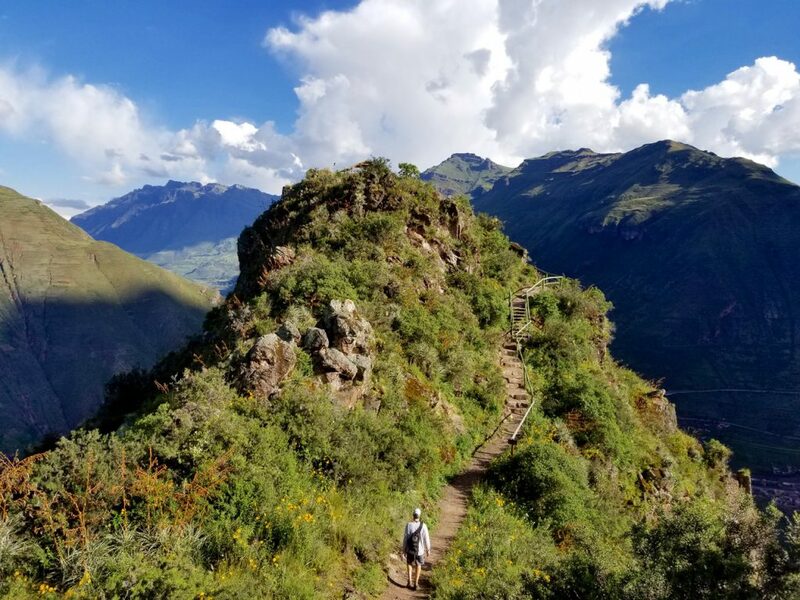 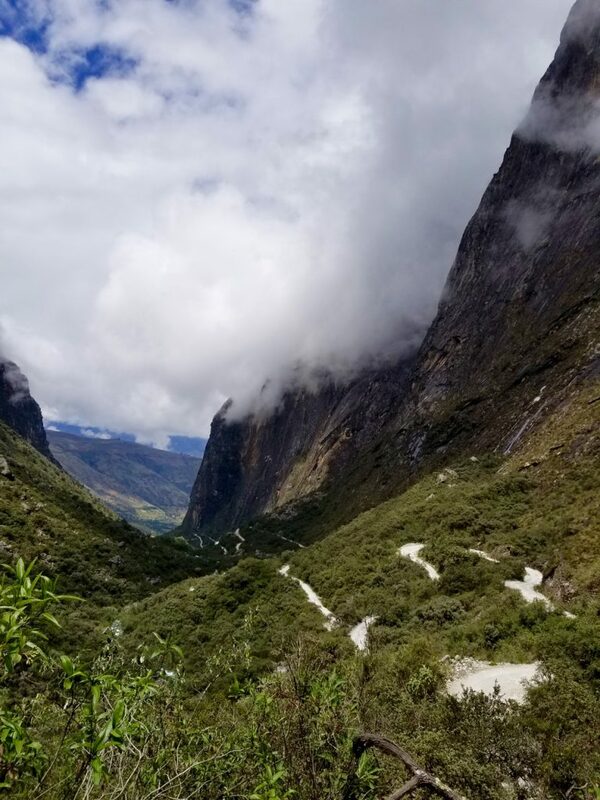 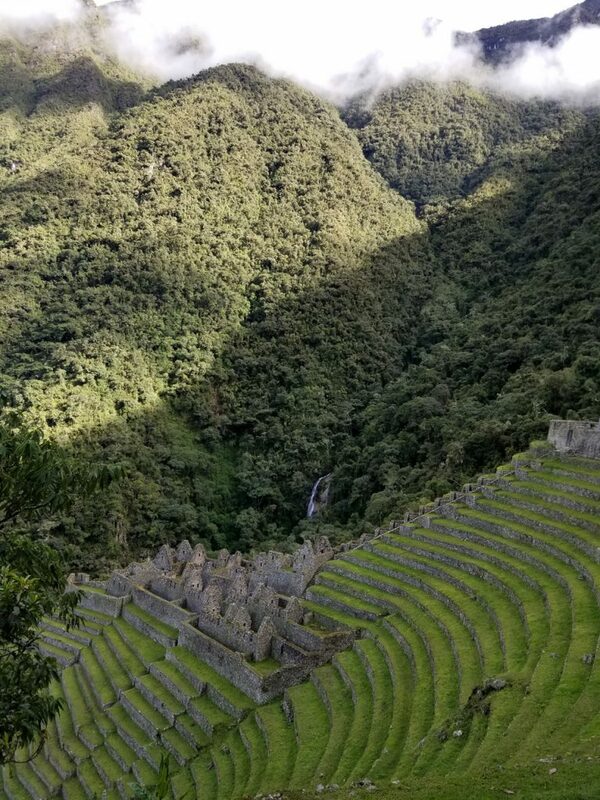 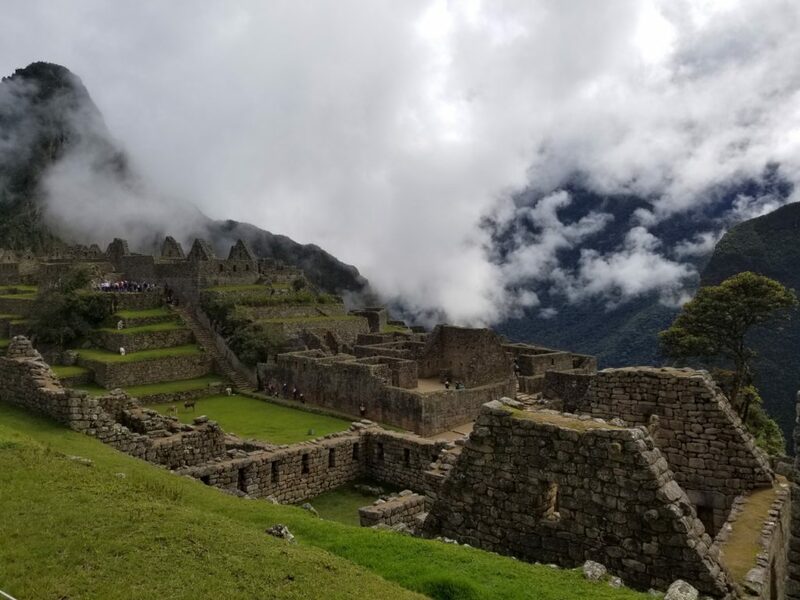 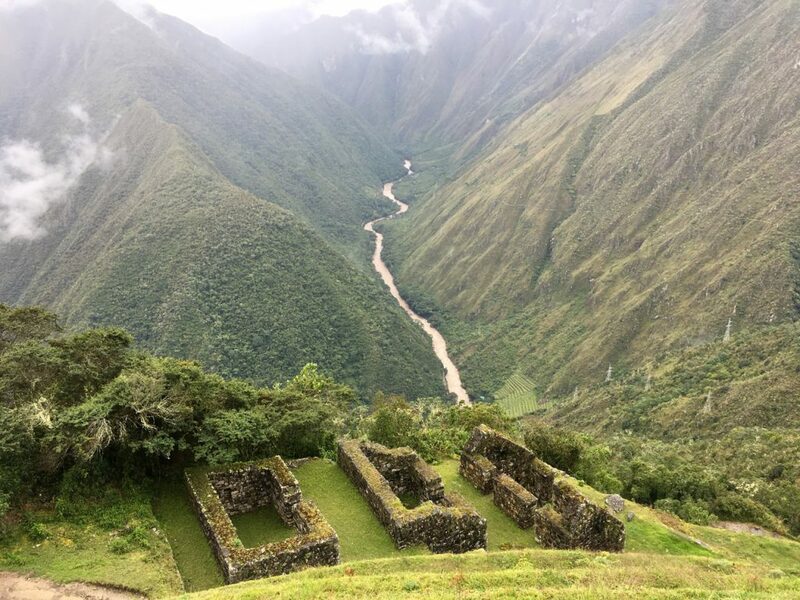 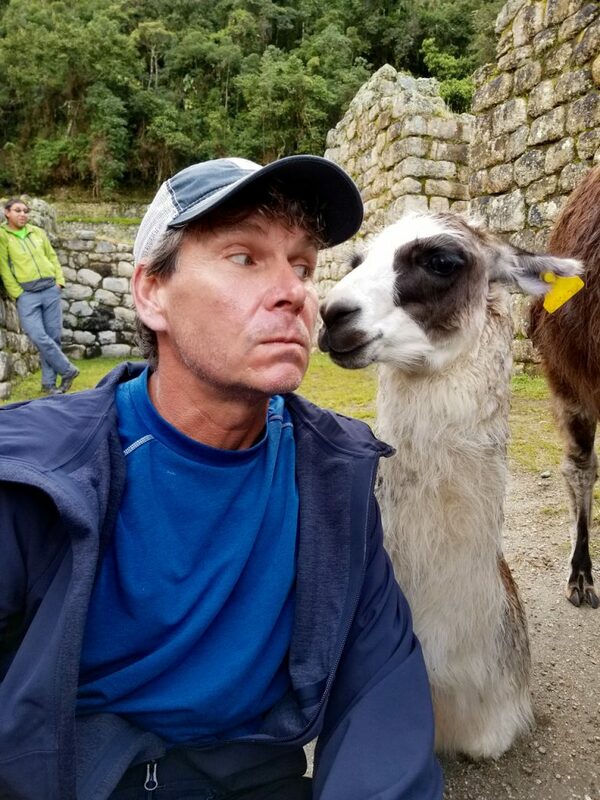 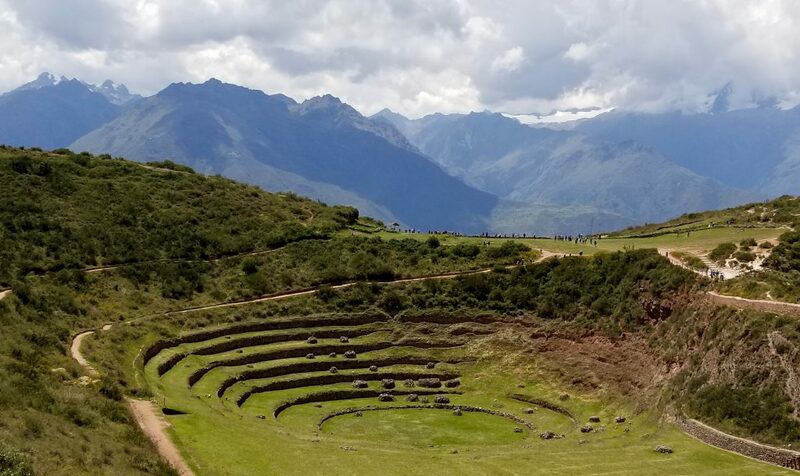 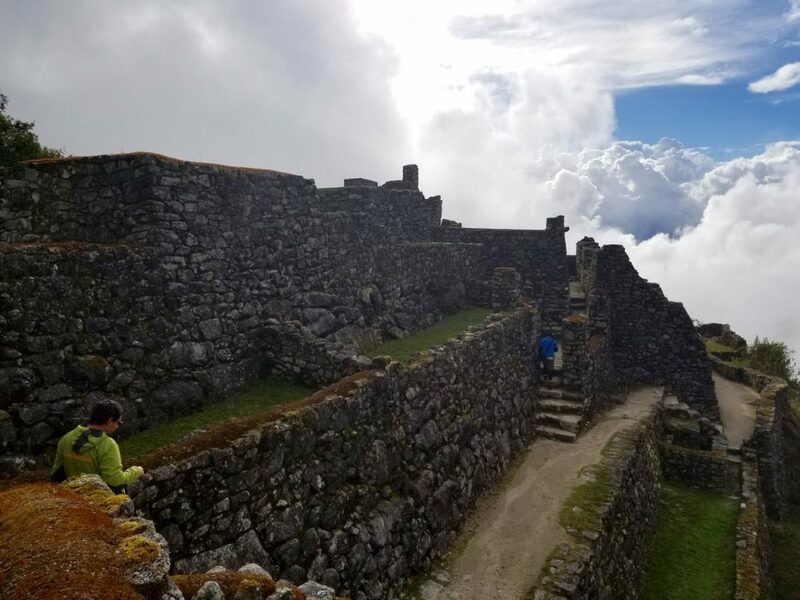 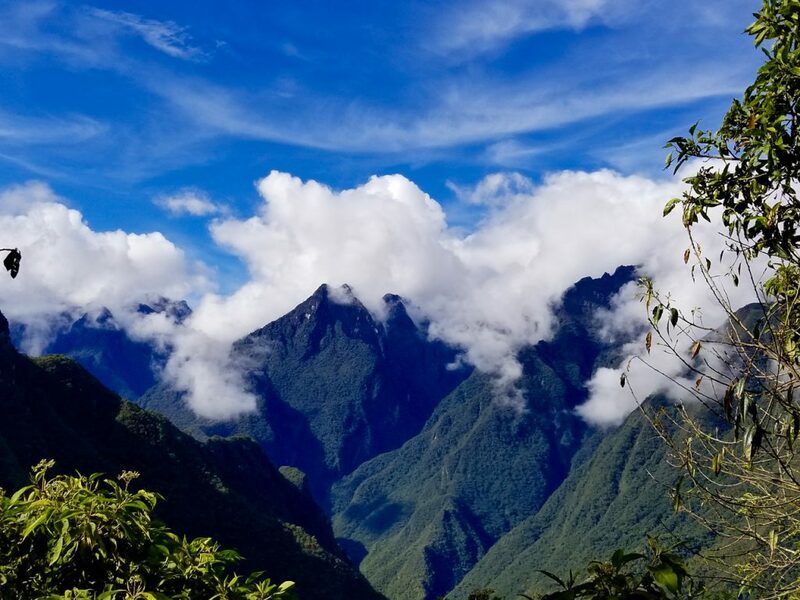 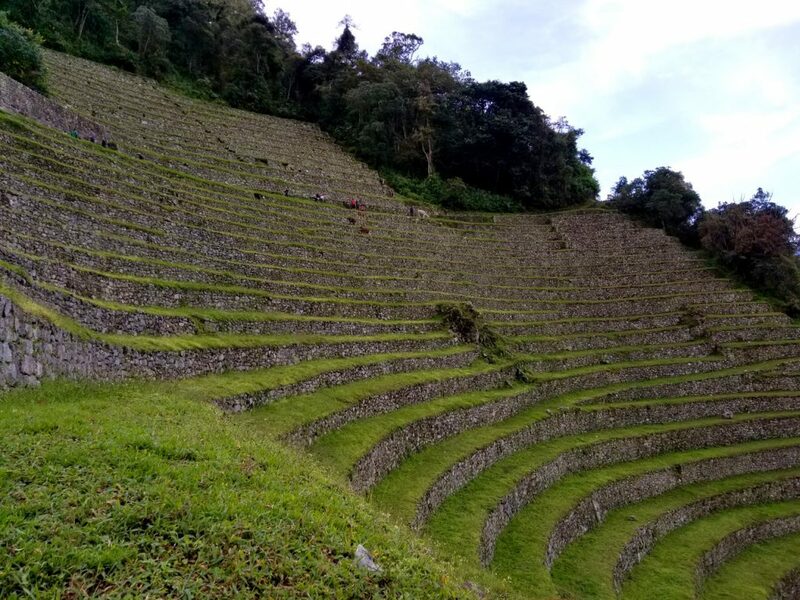 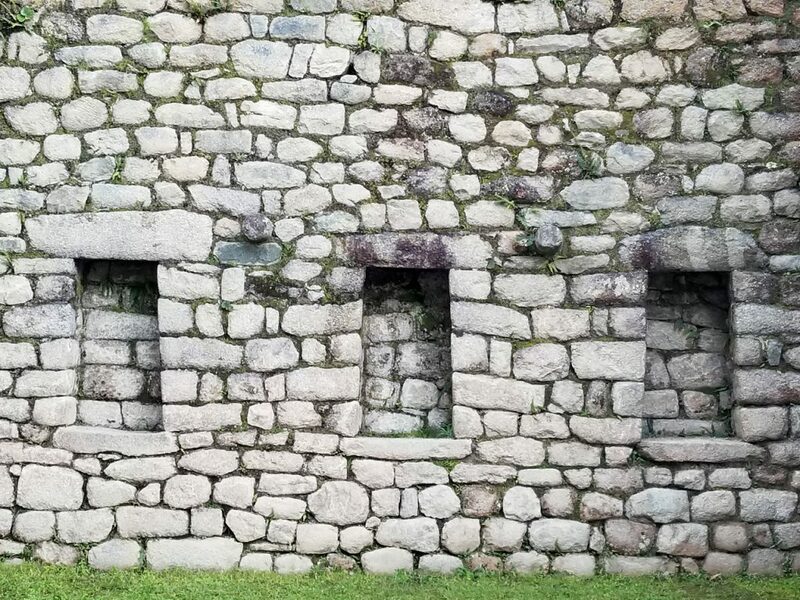 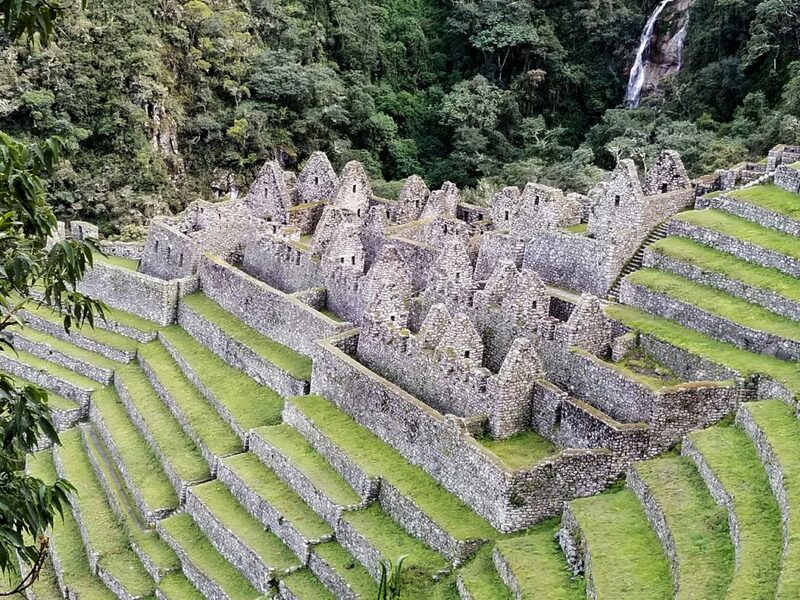 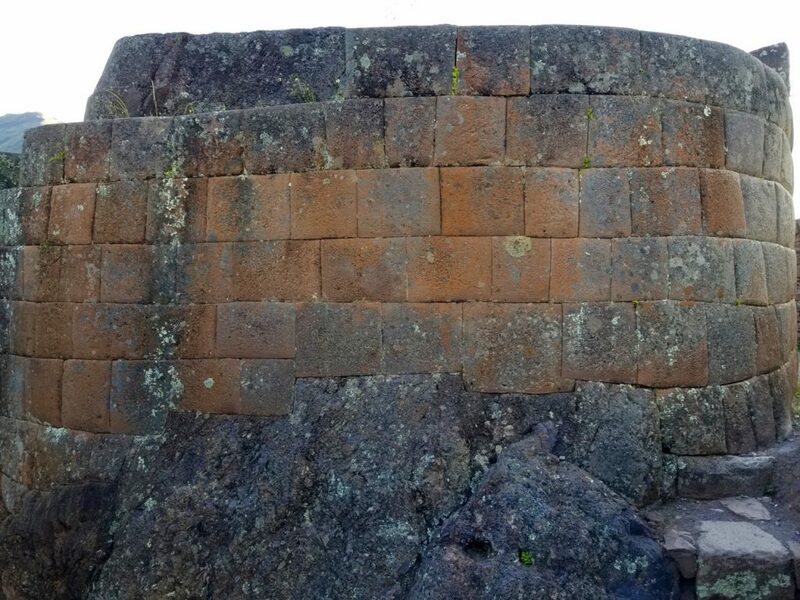 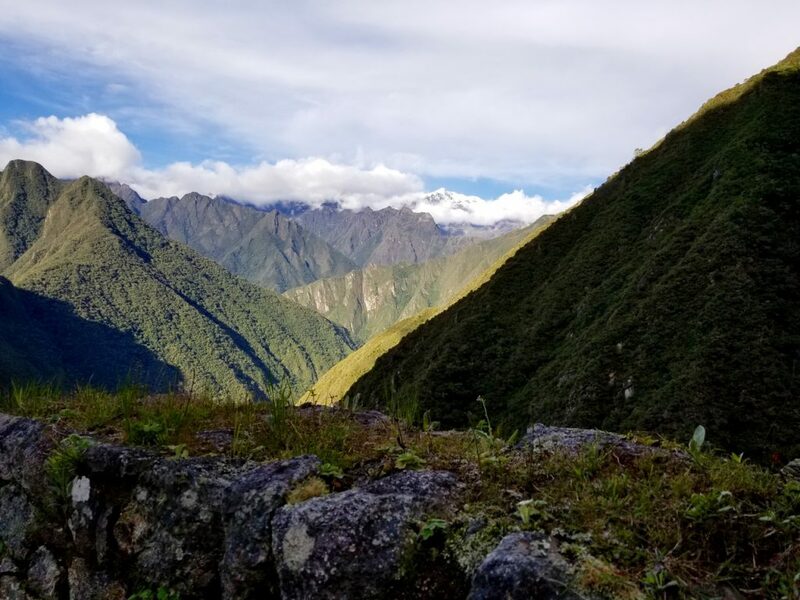 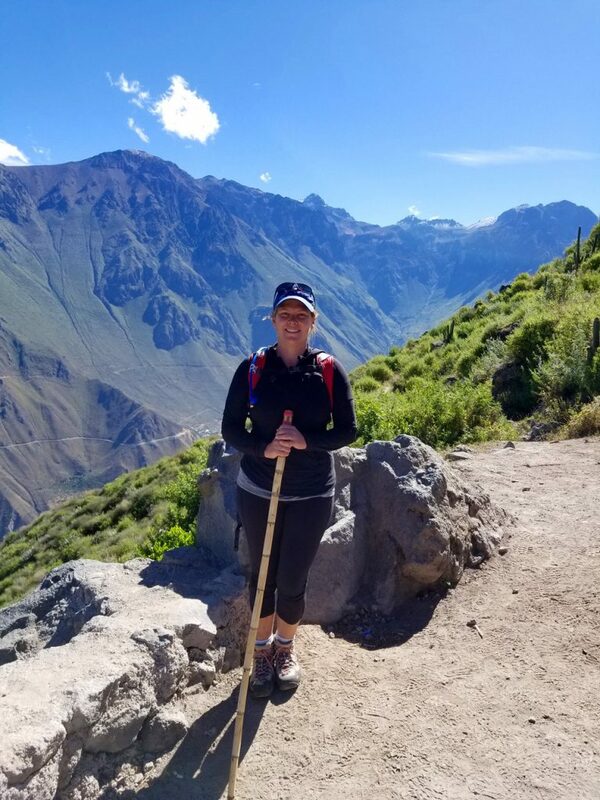 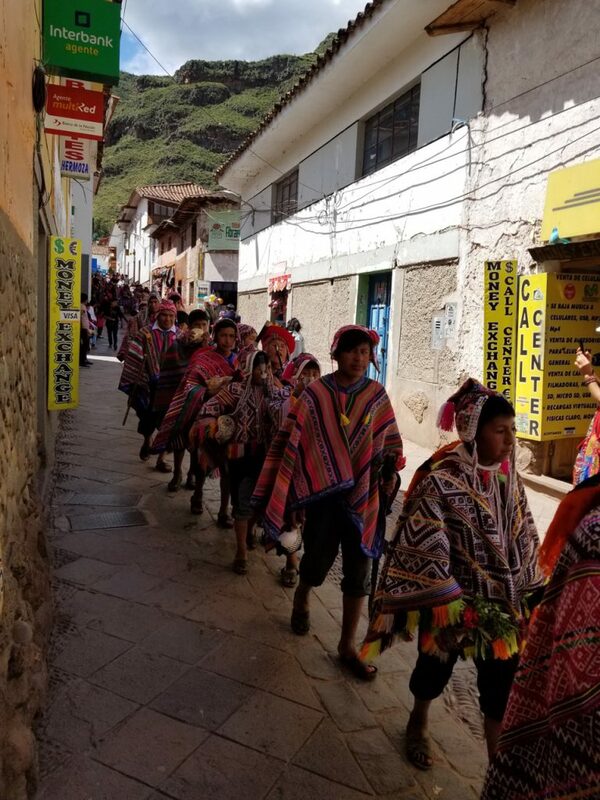 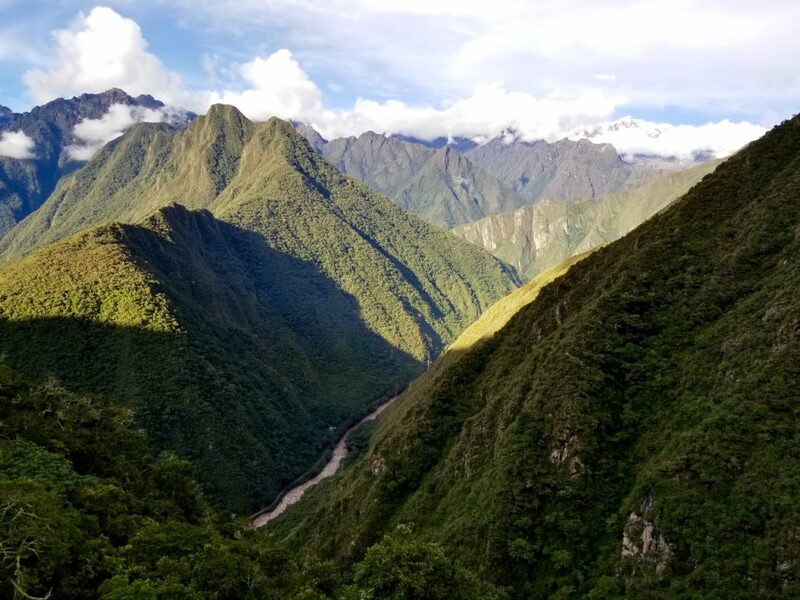 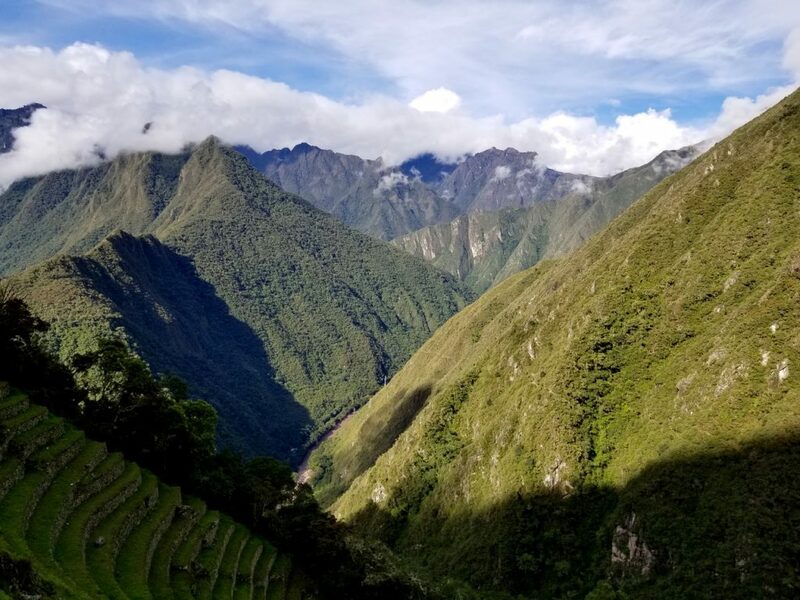 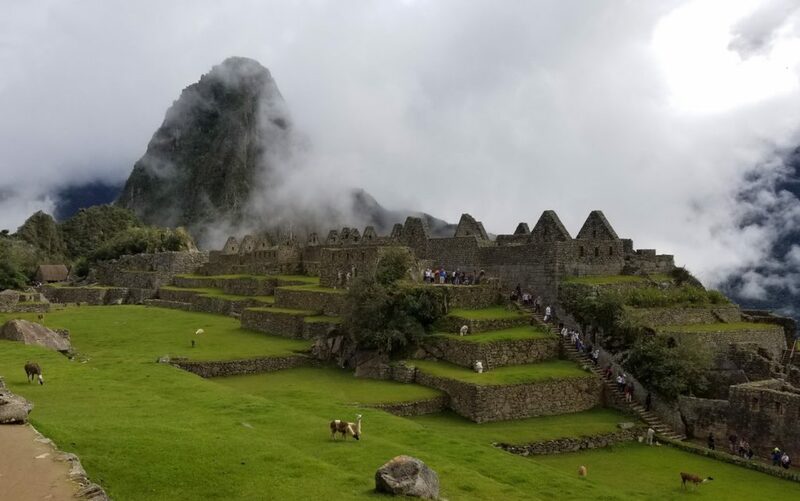 We had booked the famed Inca trail hike to Machu Picchu for a month into our Peru visit and had a lot of ground to cover and many places to see before we get there. 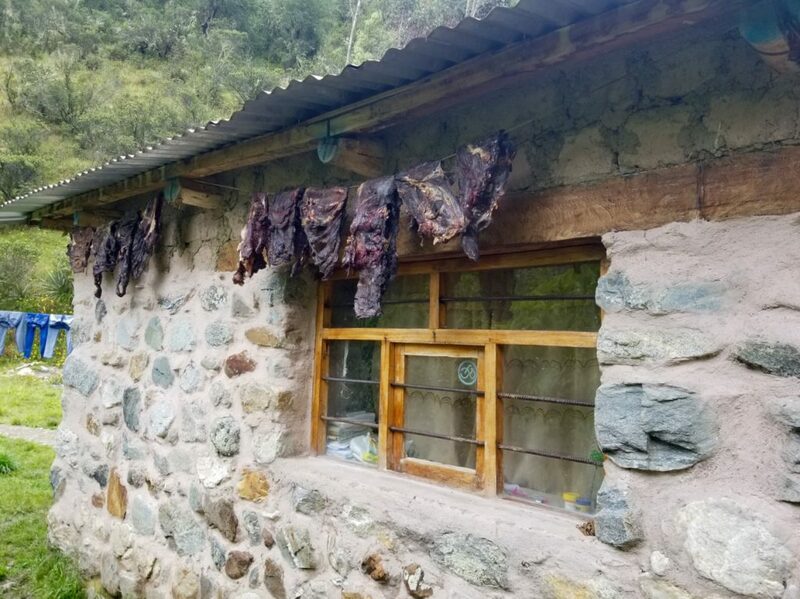 First stop was the Caraz area. 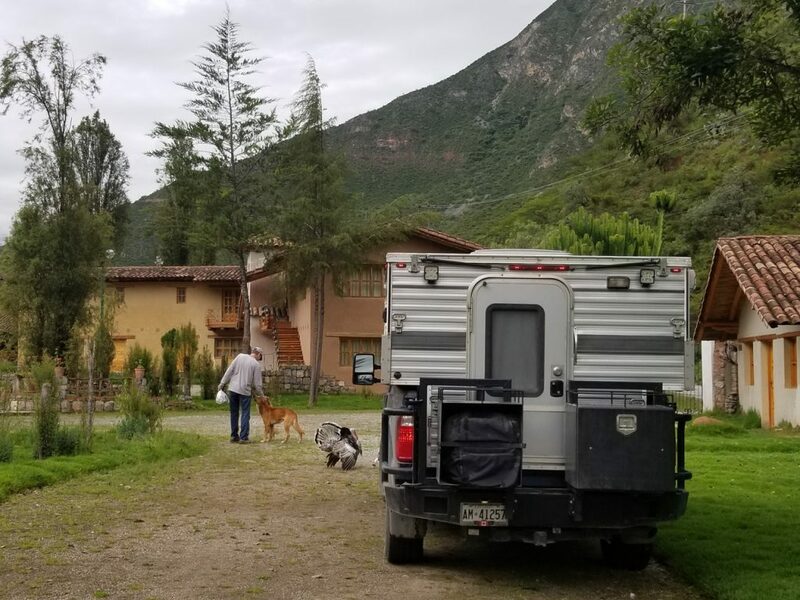 We stopped at a beautiful new campsite (Camping Guadalupe) with hot water and great wifi. 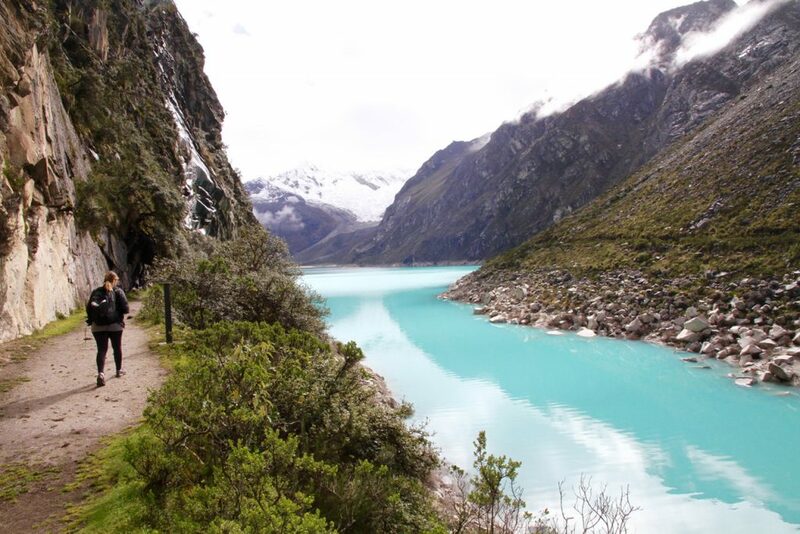 We then made the heavily switchback laden trek up to Lago Paron. 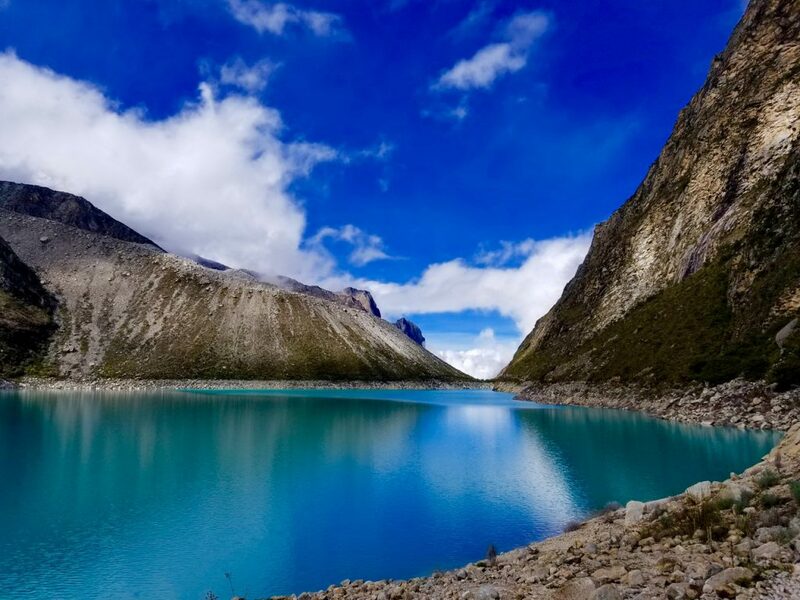 Lago Paron, 4,200m in the Huascaran National Park. 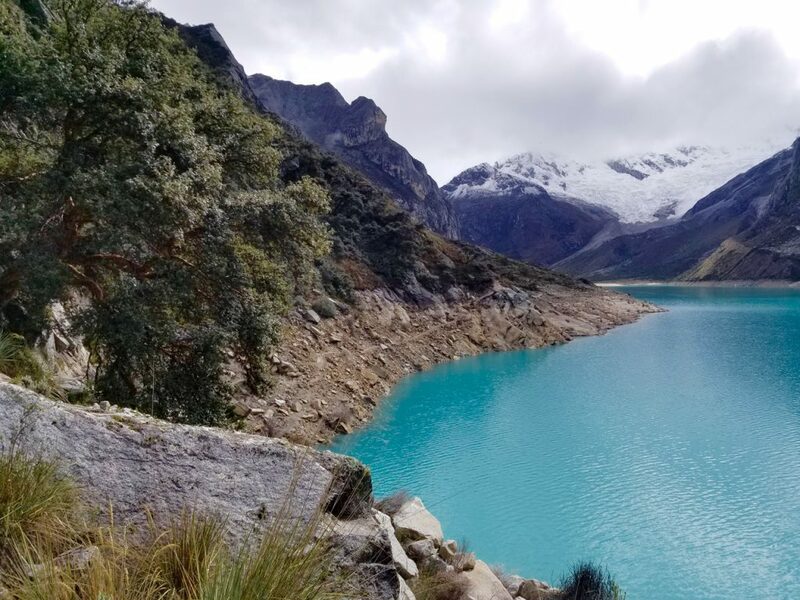 We set out for a hike around the lake. 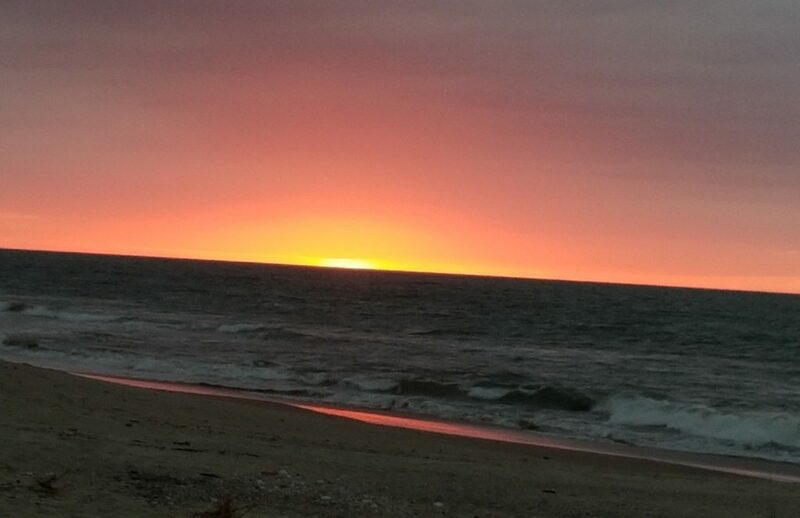 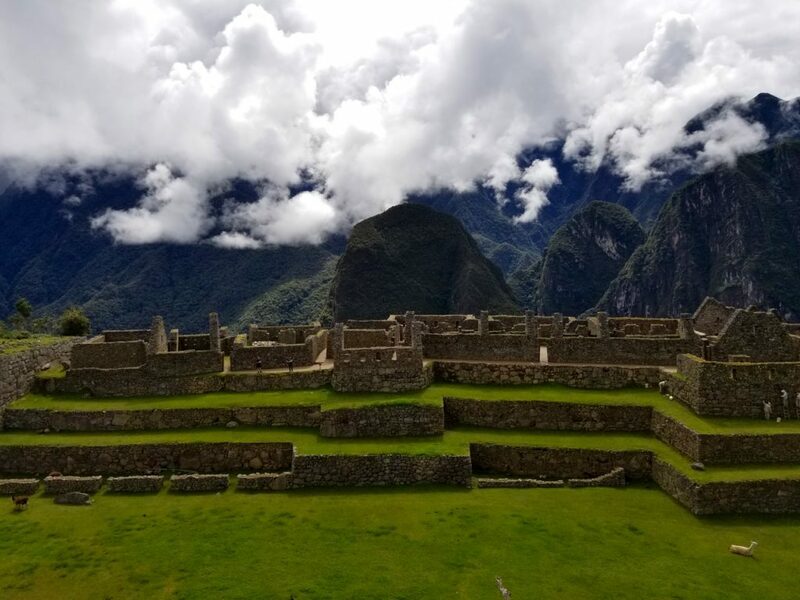 The beauty of this place is indescribable. 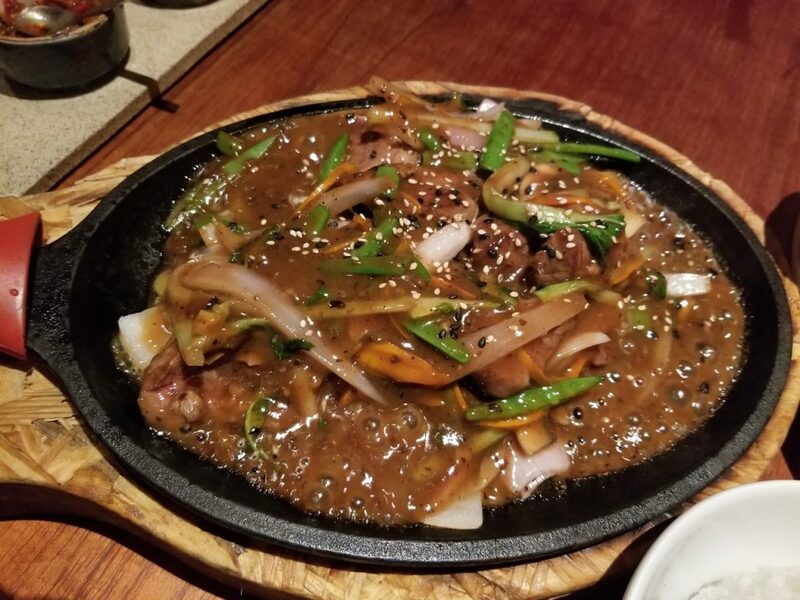 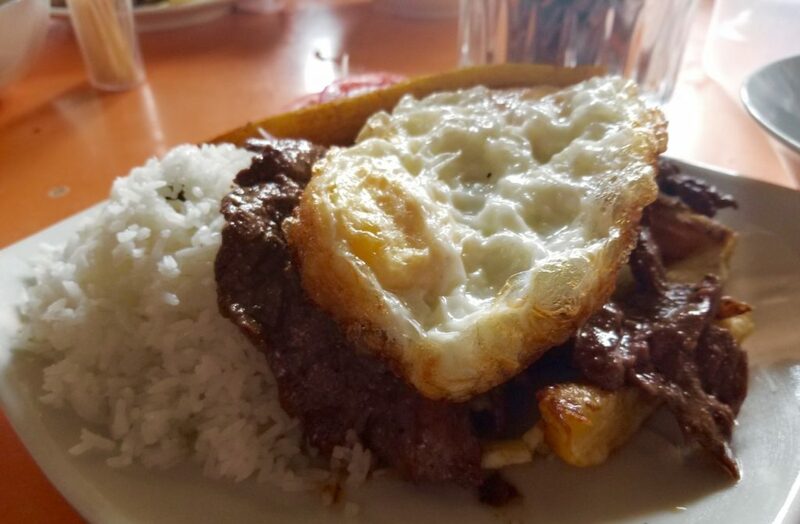 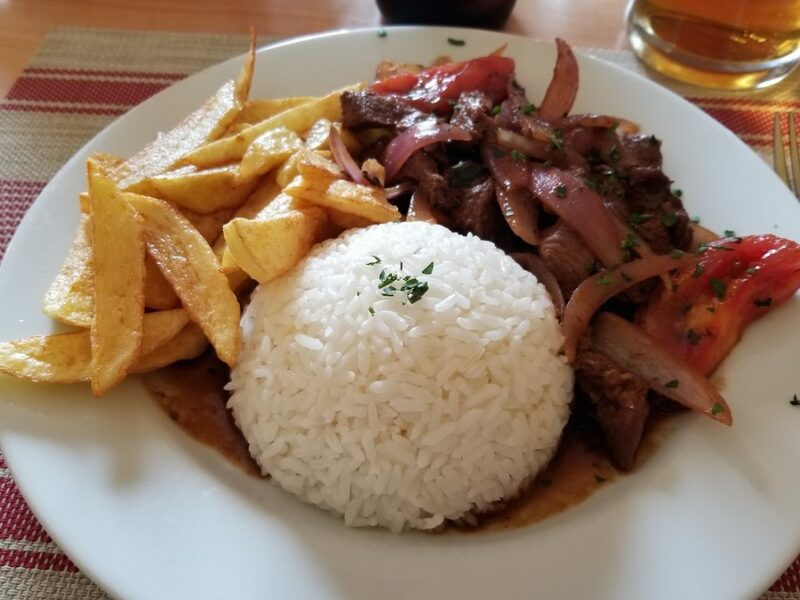 The town of Caraz is a neat little town with some good Lomo Saltado, a Peruvian staple. 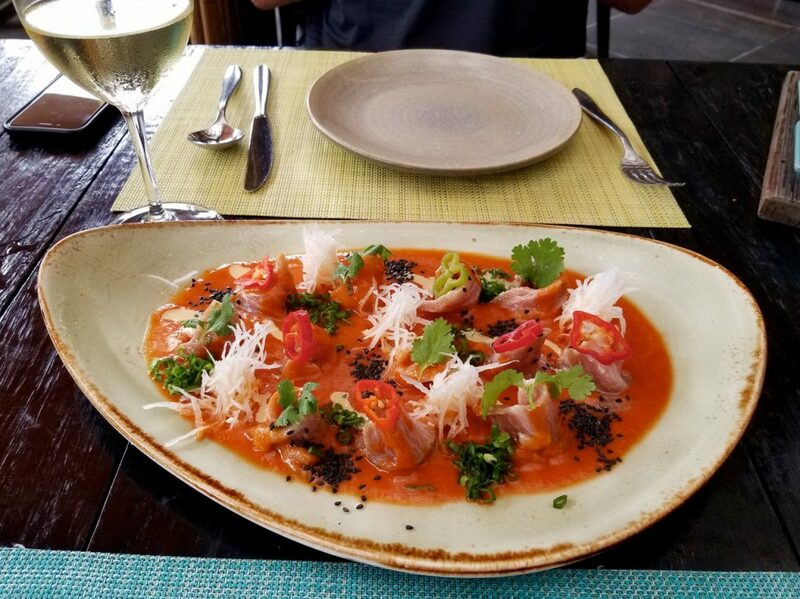 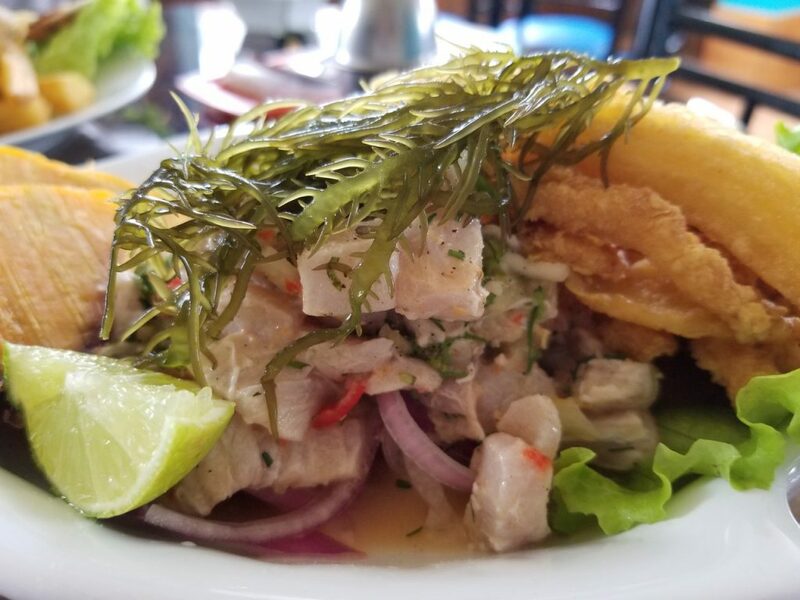 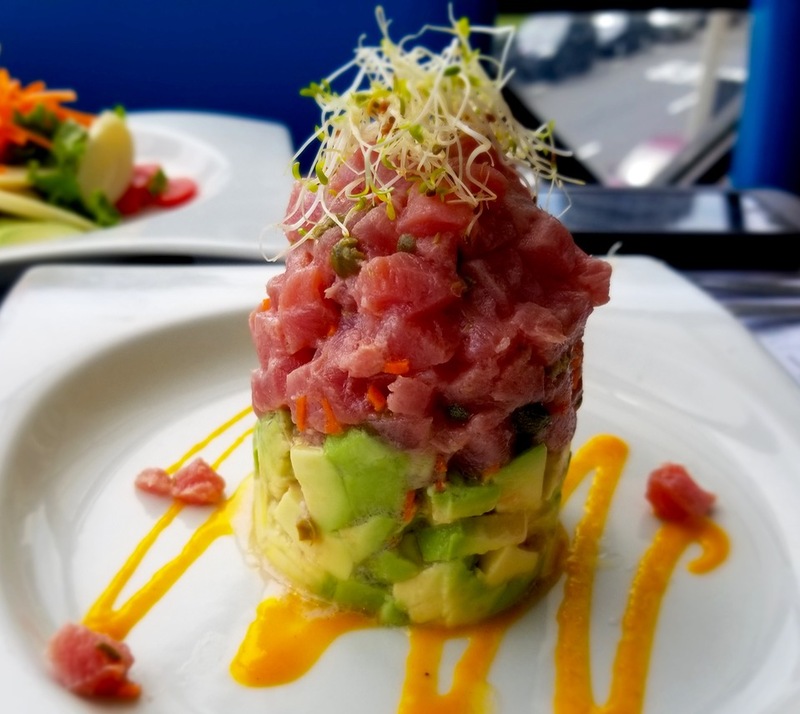 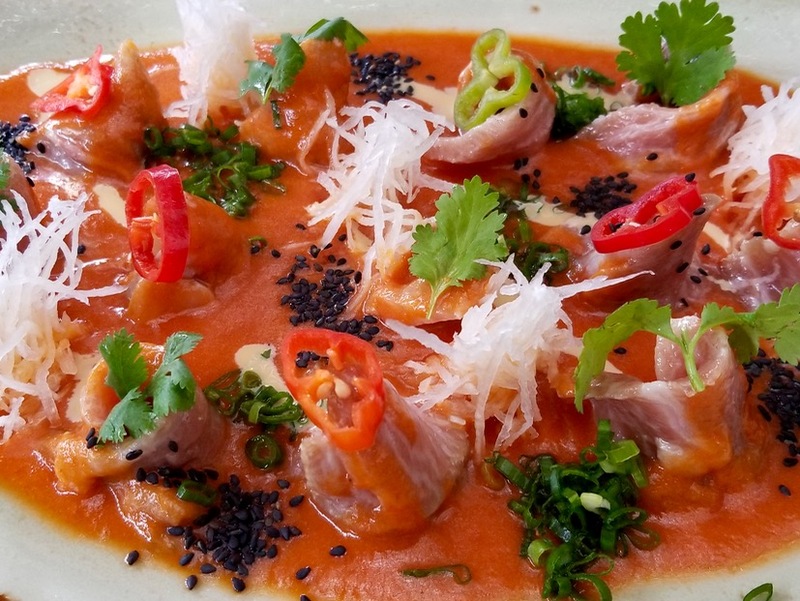 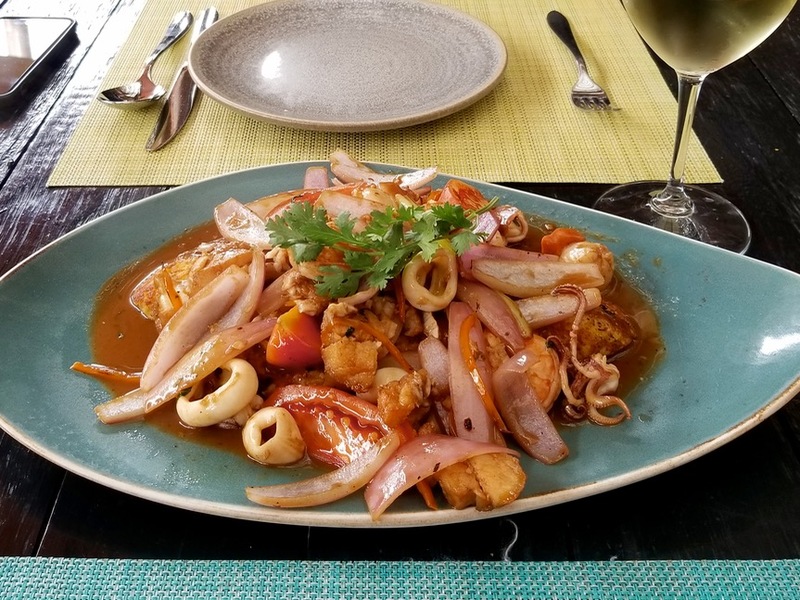 Another very popular dish in Peru - Ceviche. 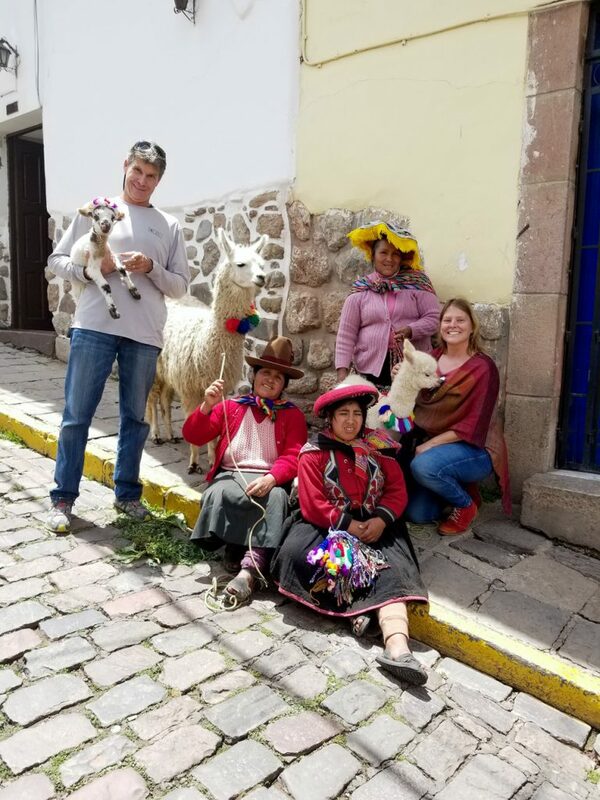 We met up with @300DaysSouth - fellow Canadians, a family of 4, from Calgary, Canada. 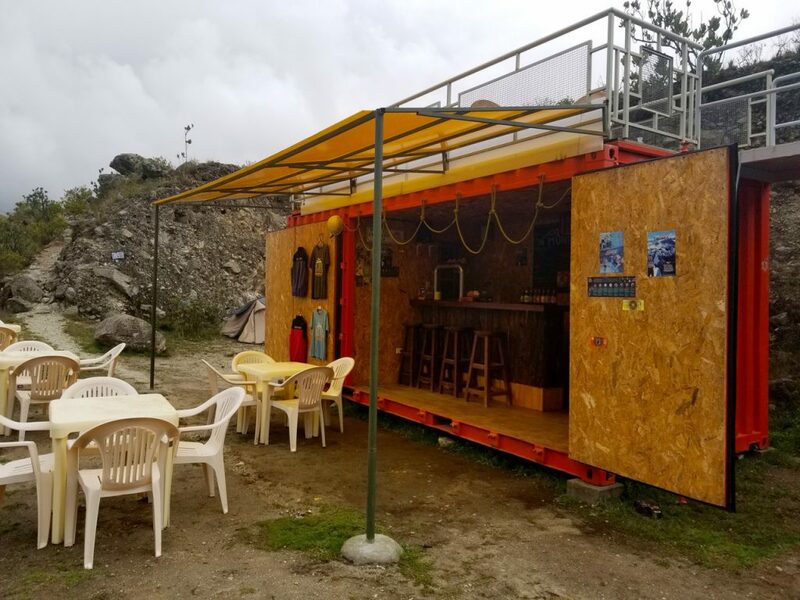 We camped at this shipping container / craft beer bar just outside of Laguna 69. 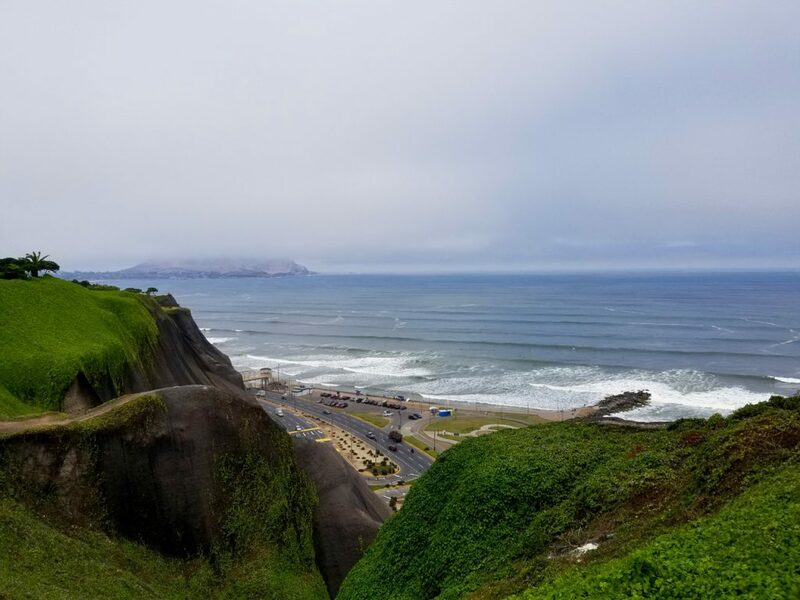 From the national park we kept moving south and headed back toward the coast where we would eventually arrive in Lima. 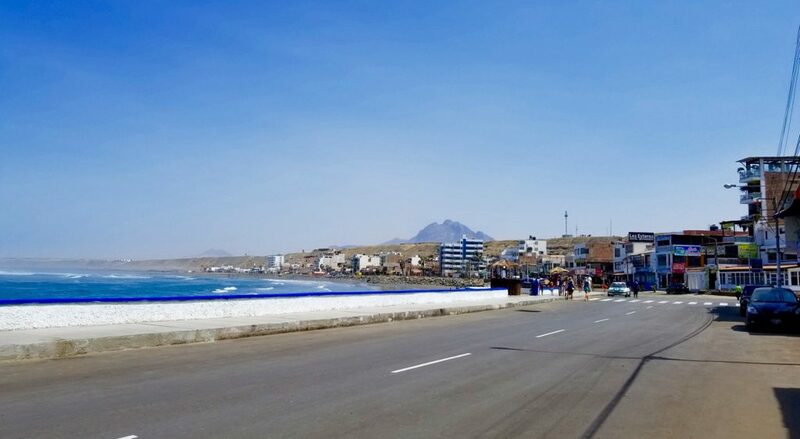 Entering the capital was some of the hariest driving of the trip but we were soon able to battle our way to the leafy Miraflores neighbourhood where everything calmed down and we settled in for 2 weeks of eating our way around this culinary hot spot and even squeezed in some jogging on the malecon. 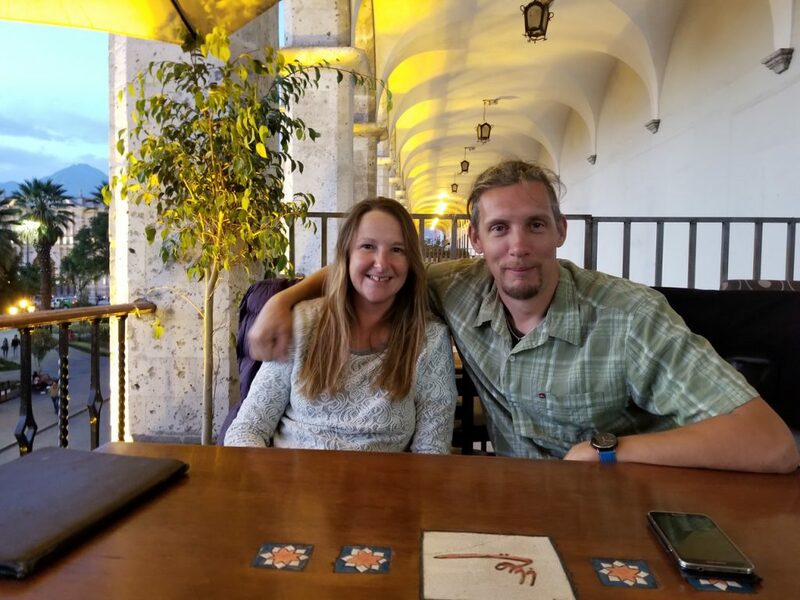 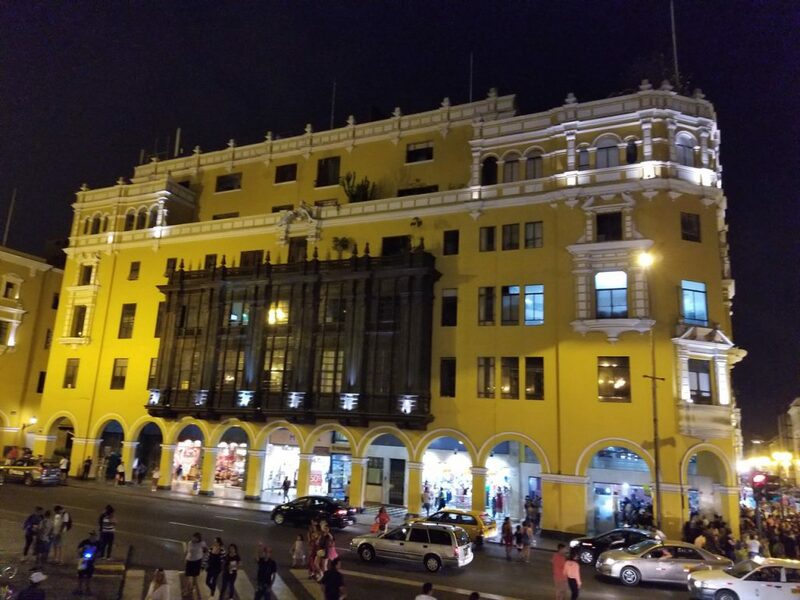 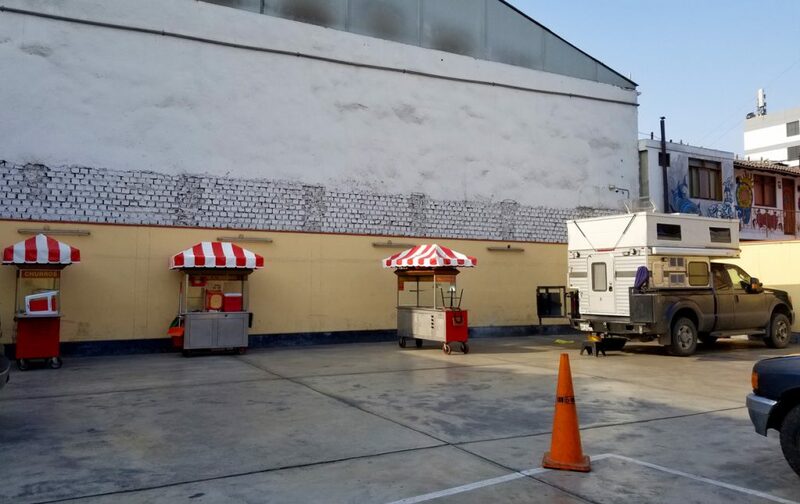 A downtown parking lot was home for the first few nights in Lima before finding more comfortable space, camping on the property of Hitchhikers Hostal. 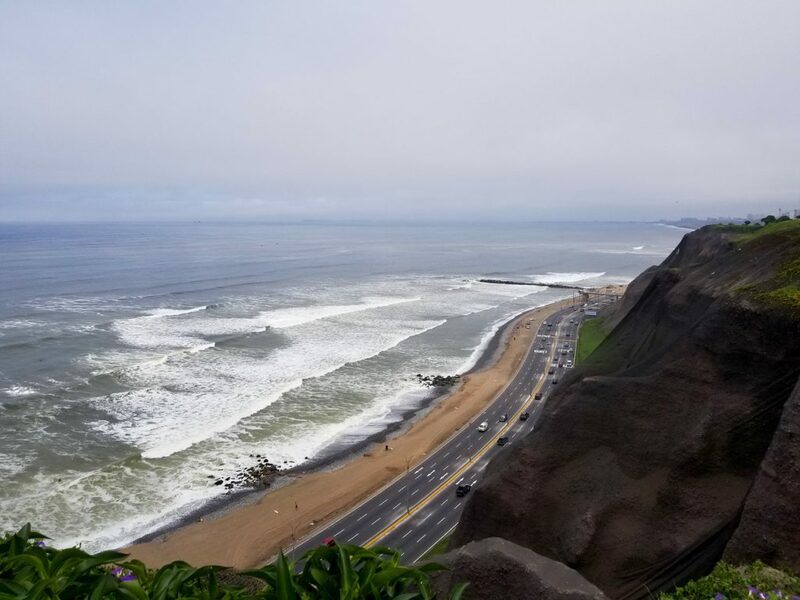 The beauty of the coast running below the big city was part of the reason we call Lima one of our favourite cities of the journey. 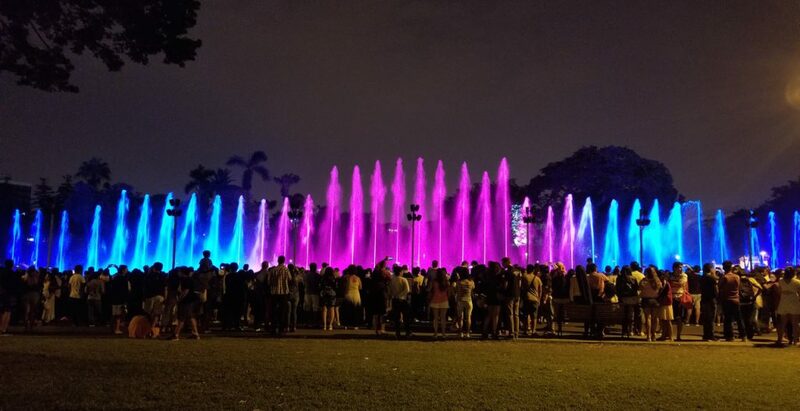 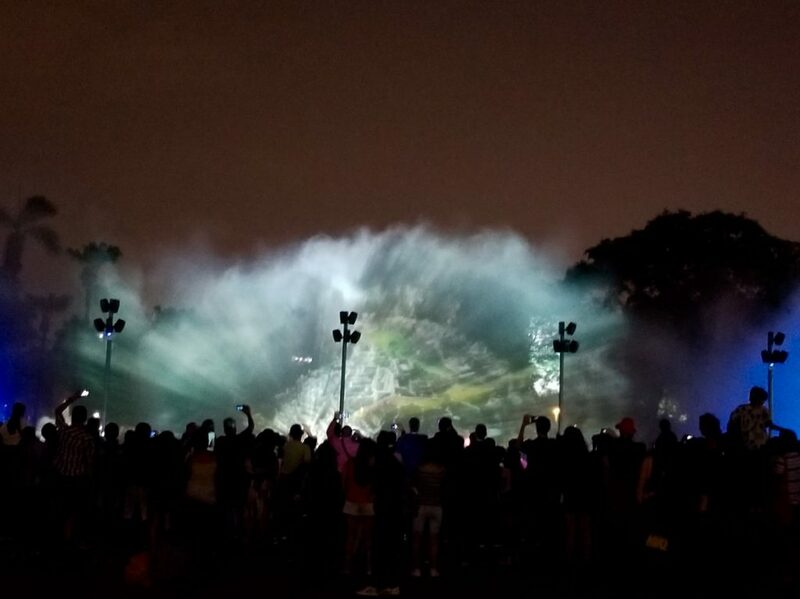 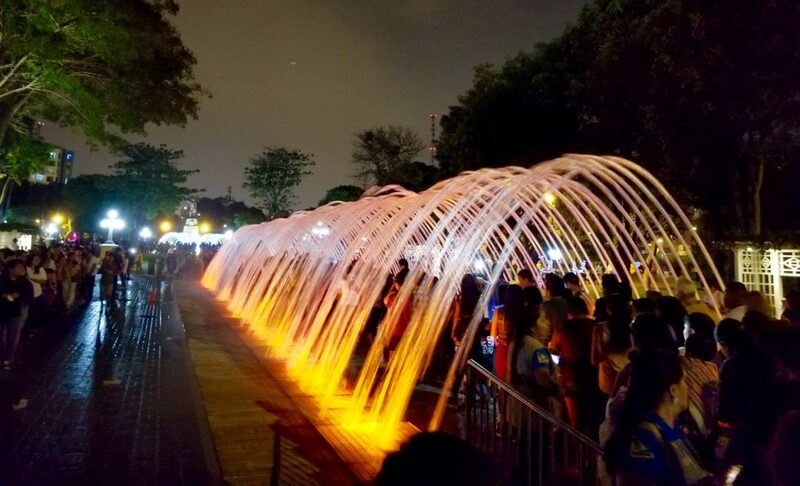 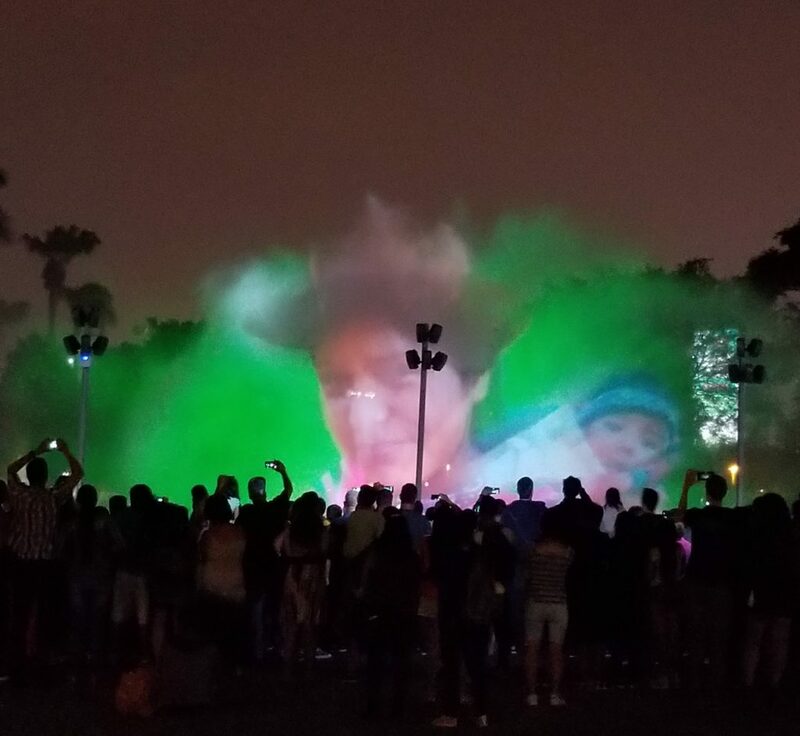 Circuito Magico Del Agua in Lima, Peru. 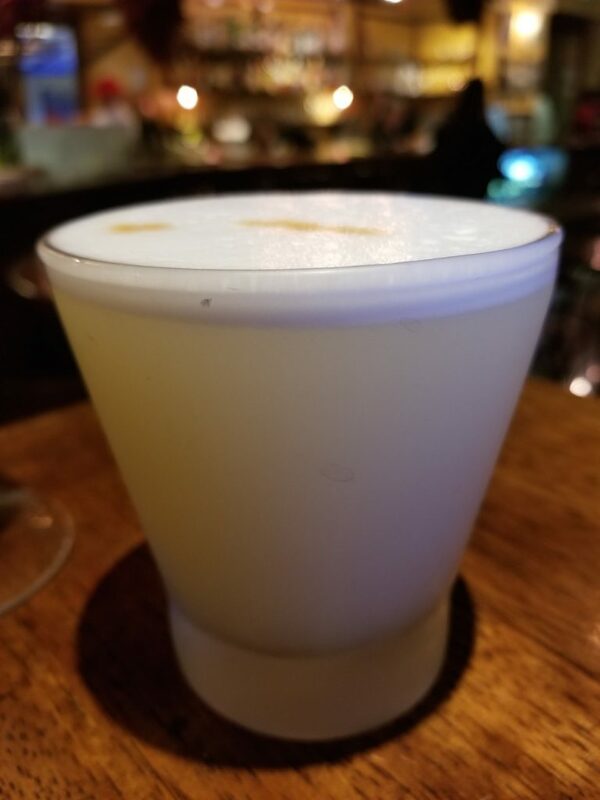 We had a few Pisco Sours while in Peru. 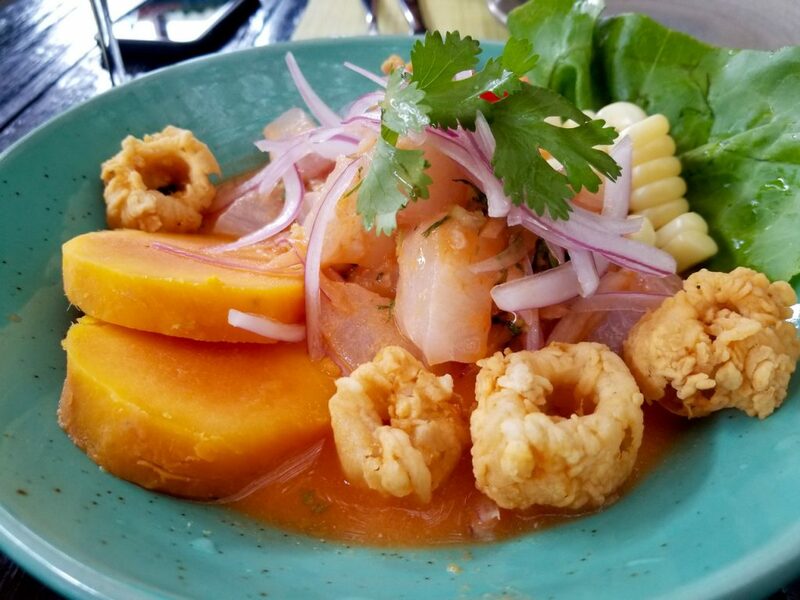 Great food at La Mar Cebicheria in Lima. 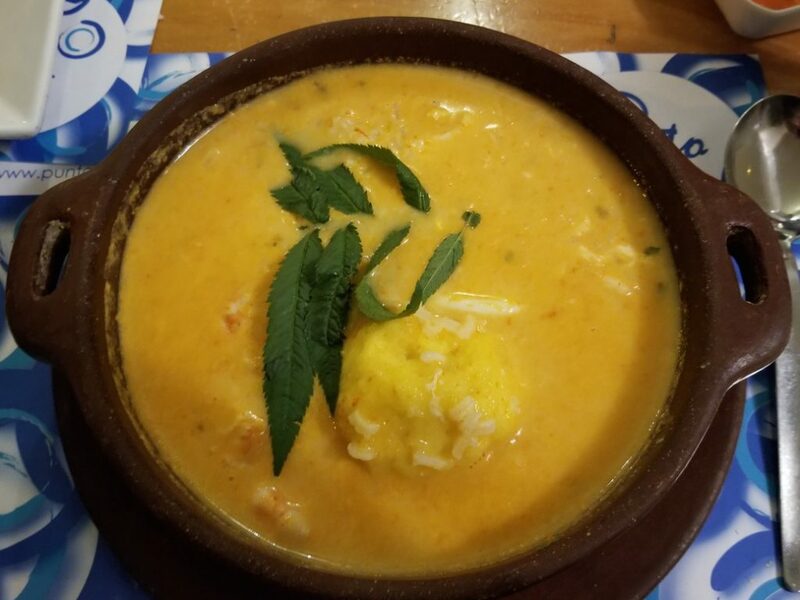 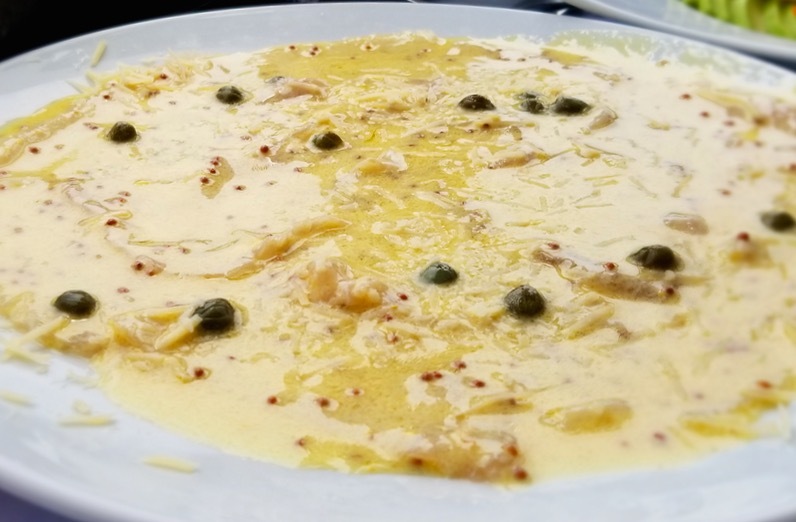 Locro - a popular potato based Peruvian soup. 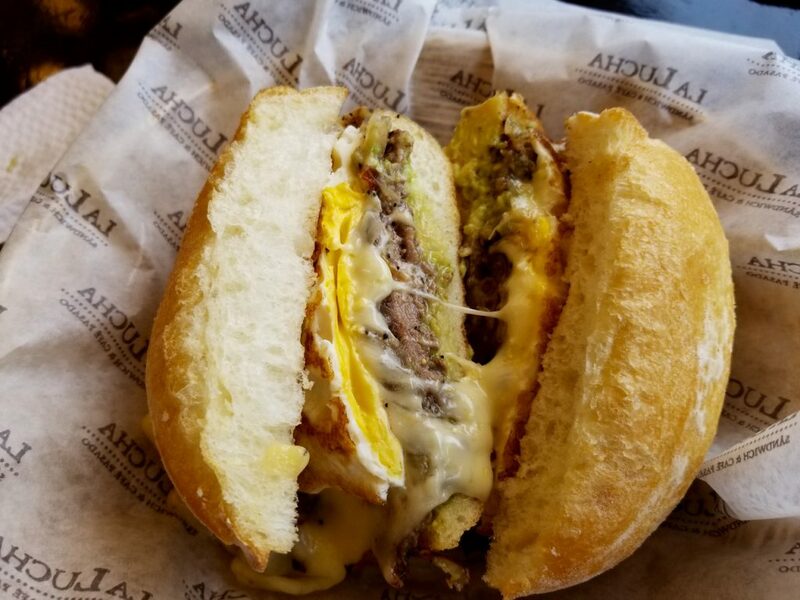 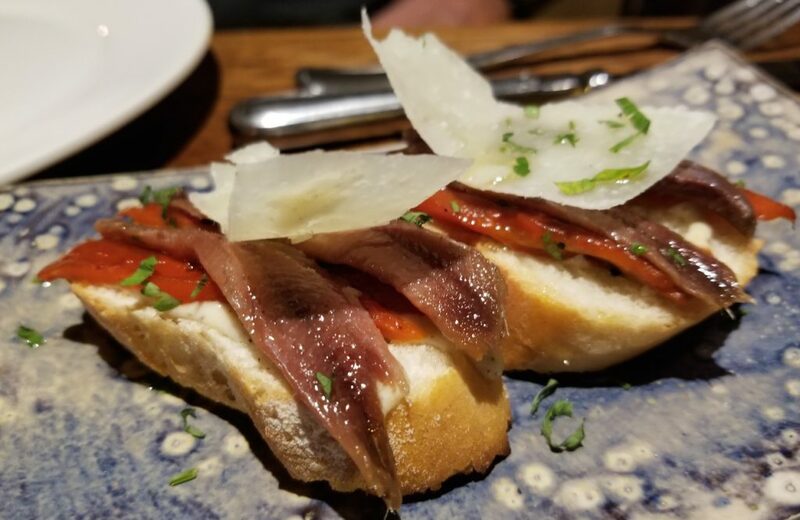 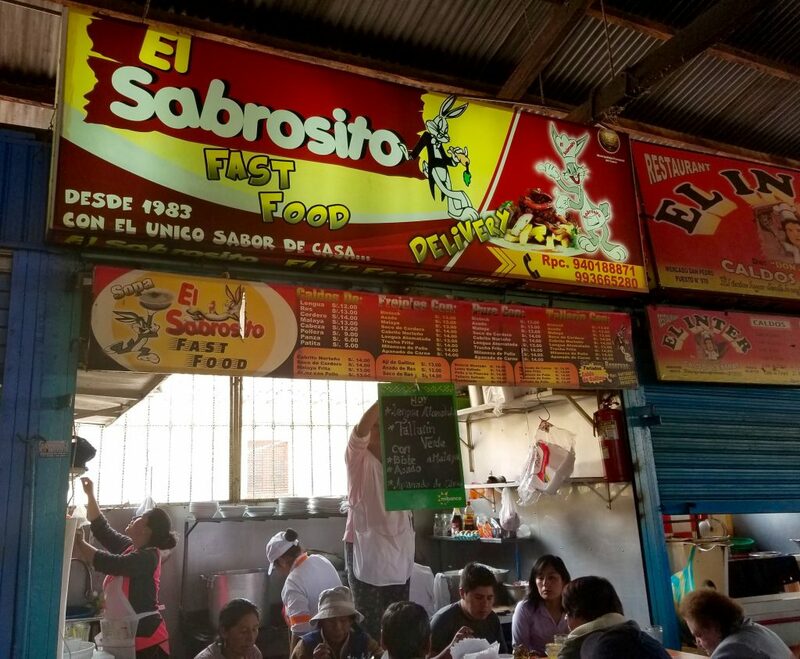 La Lucha Sanwicheria....one of the best sandwiches we've had since Mexico. 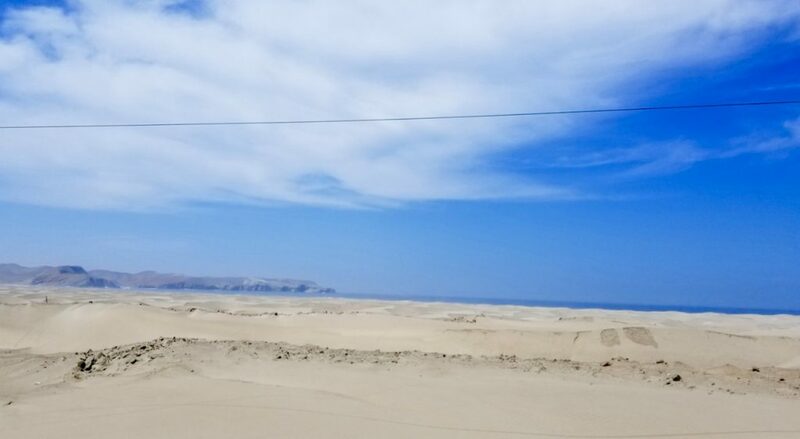 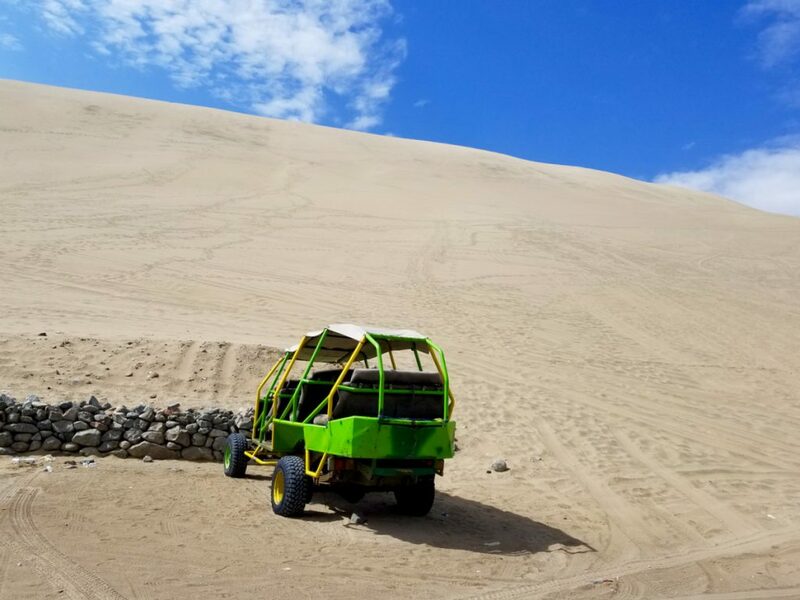 With bellies full we leave Lima and carry on down the coast through the sand dunes of Ica to Nasca and the mysterious Nasca lines. 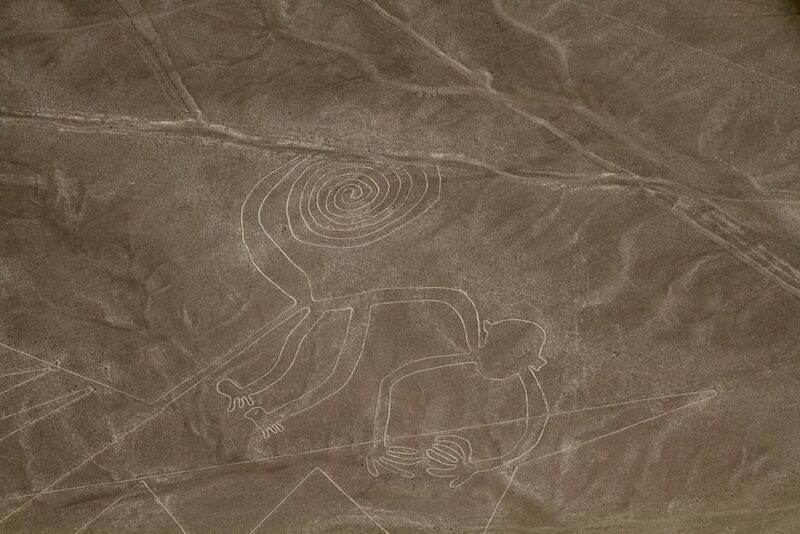 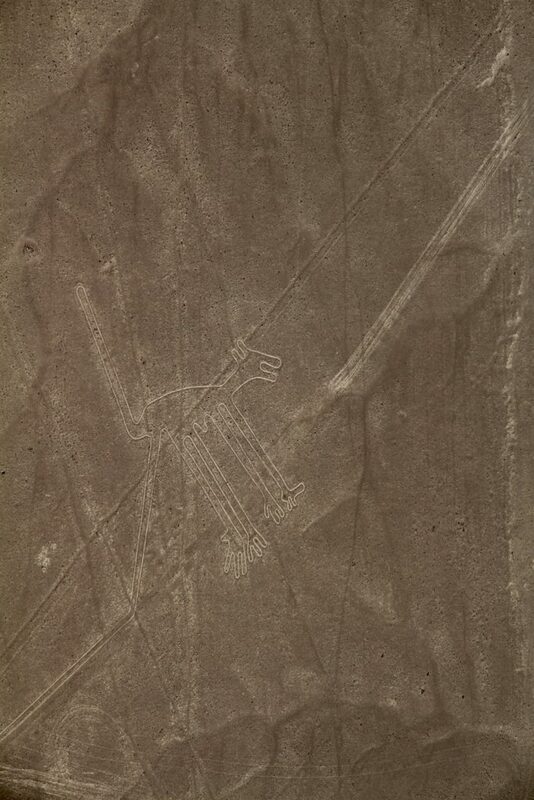 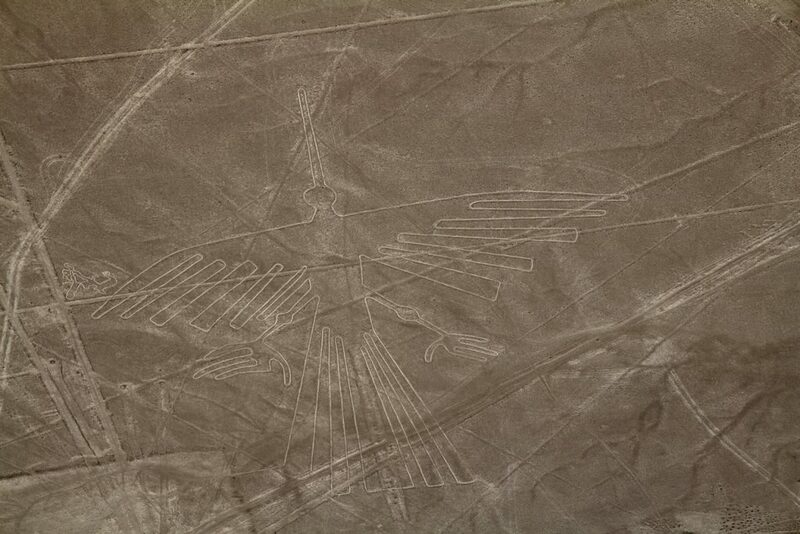 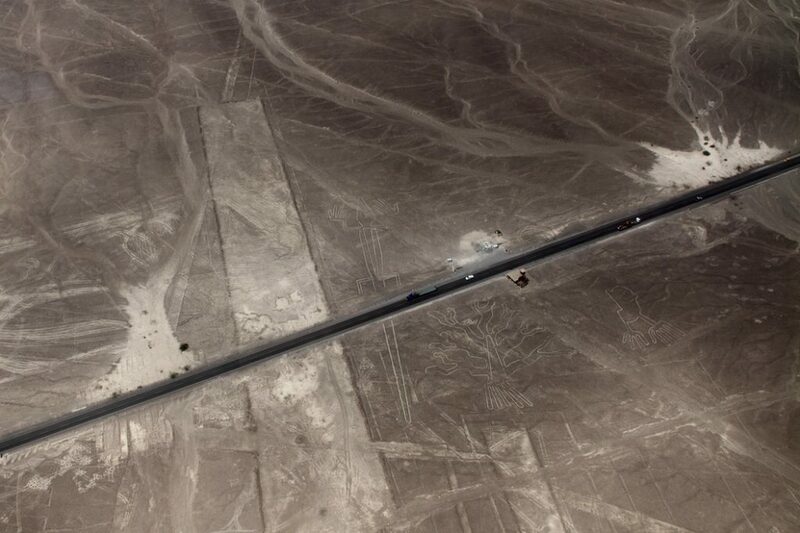 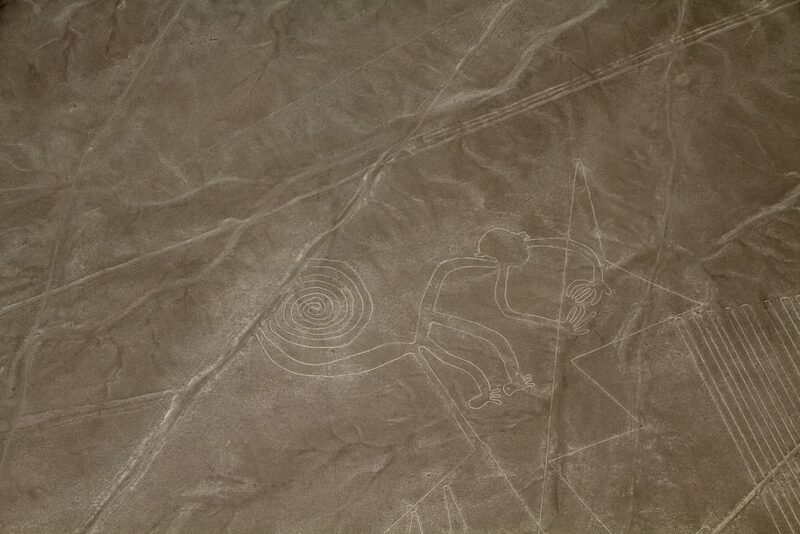 The Nasca lines date back 500 to 2,000 years. 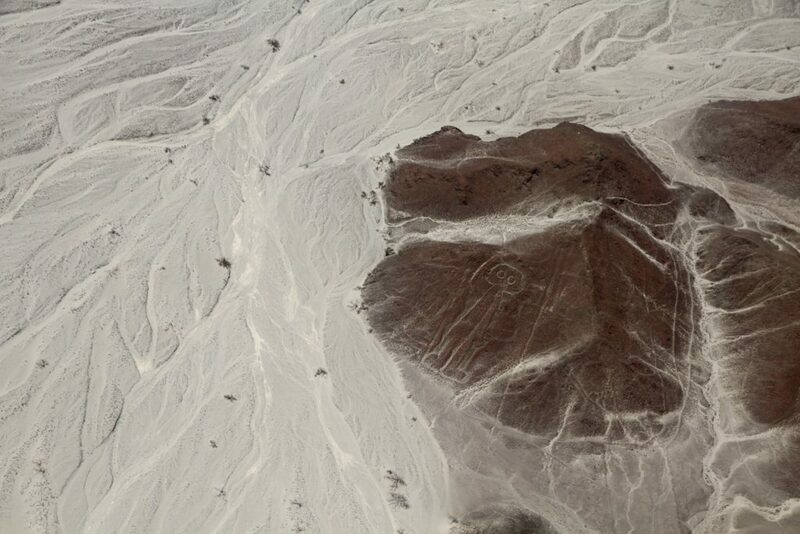 Thought to be created by the Nasca people as a form of ritual asking the gods for water and fertility of crops, the lines carved into the desert remain in tact to this day due to the area's very little rainfall, low winds and lack of erosion. 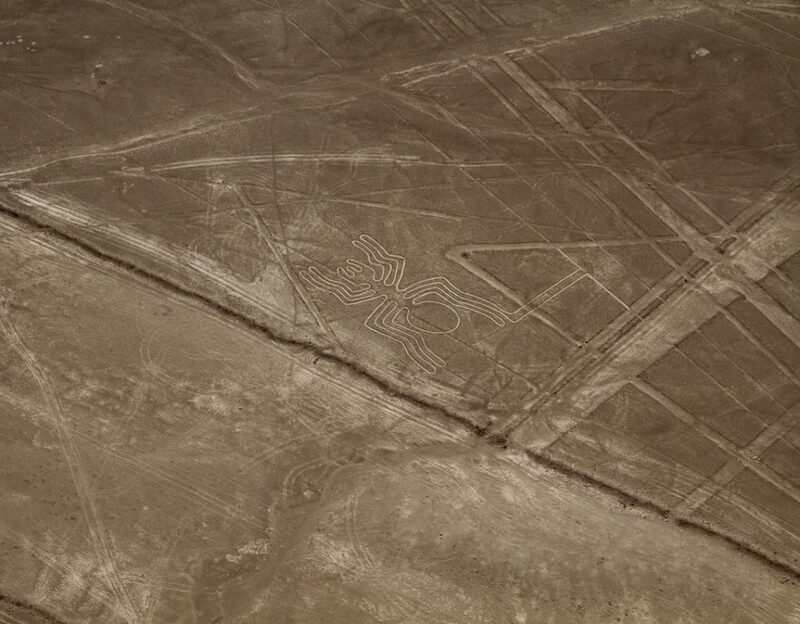 A day in a small prop plane gave a fantastic birds eye view of many of the over 800 straight lines, 300 geometric figures and 70 animal and plant designs. 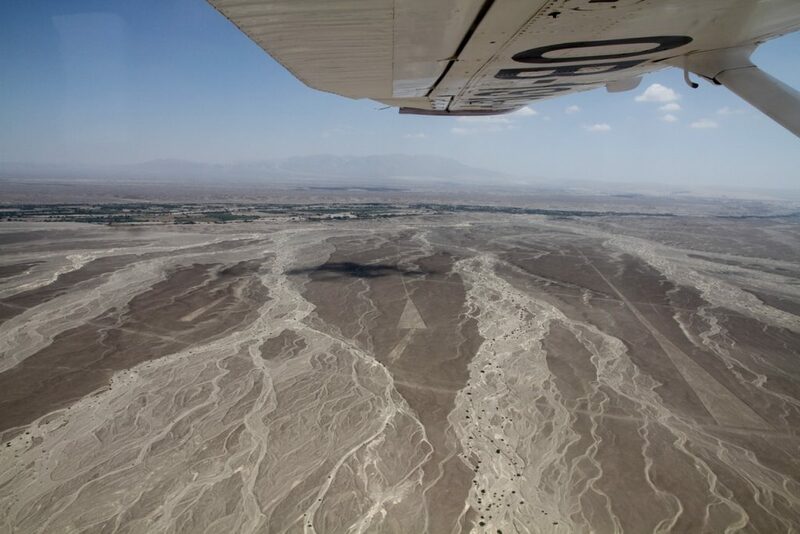 From Nasca it was back inland and our push to Cusco, the jumping off point for the Inca trail. 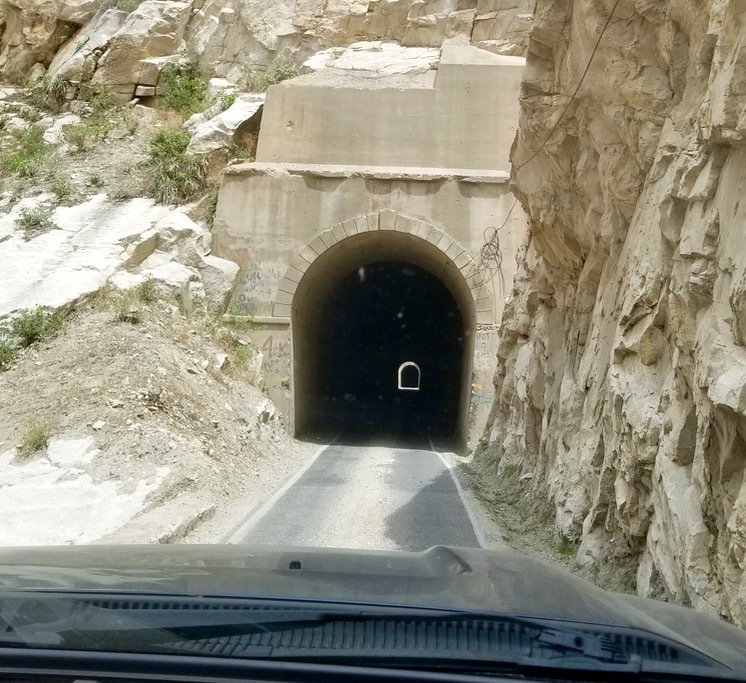 On our way we took a few days to explore the Humantay Mountains. 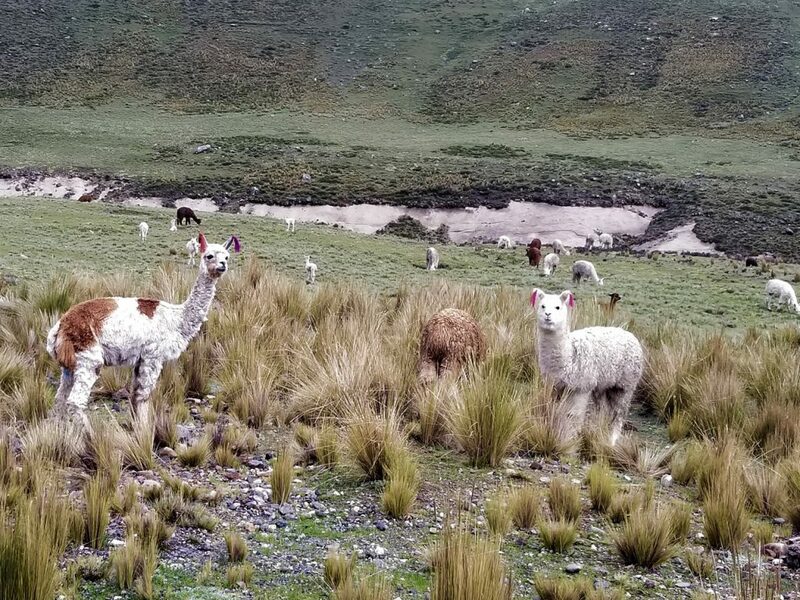 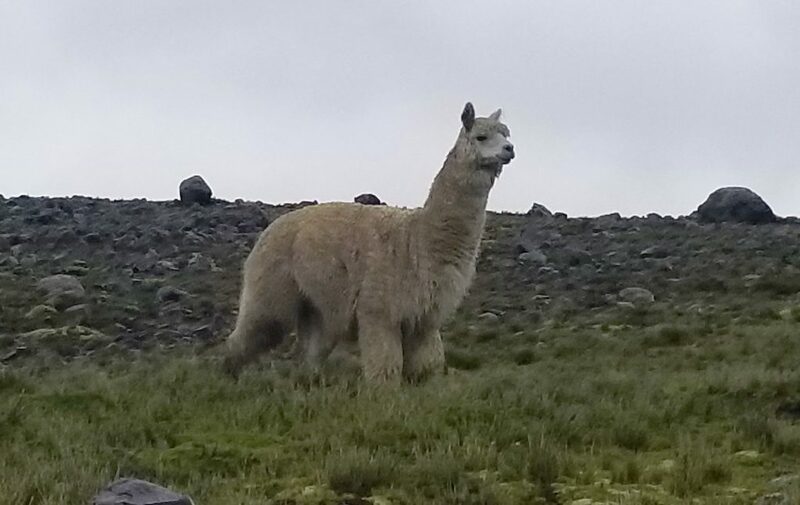 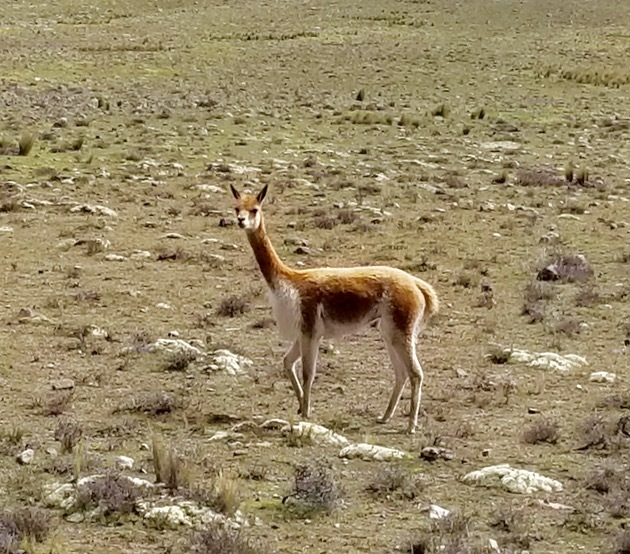 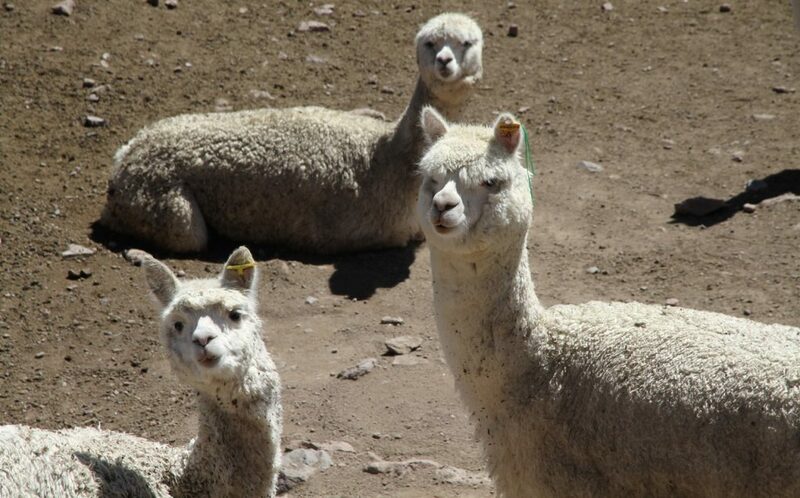 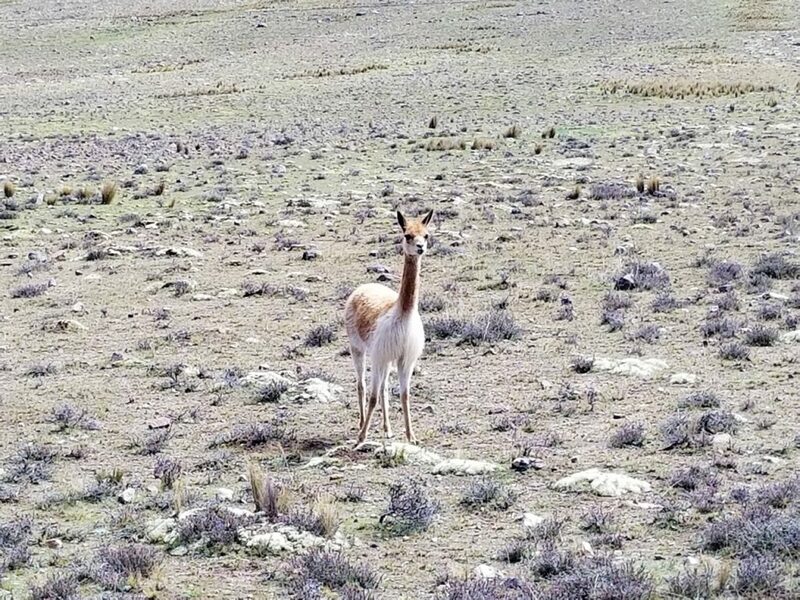 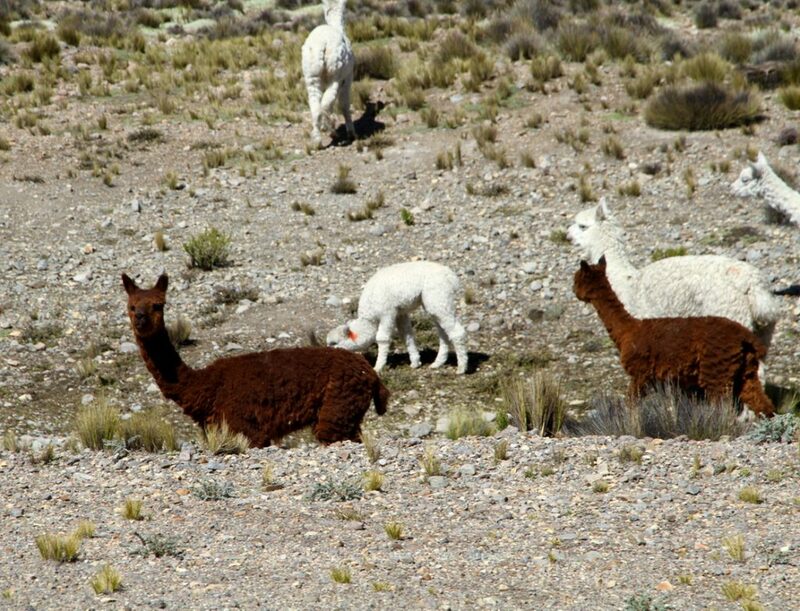 Llamas and Alpacas and Vicunas abound. 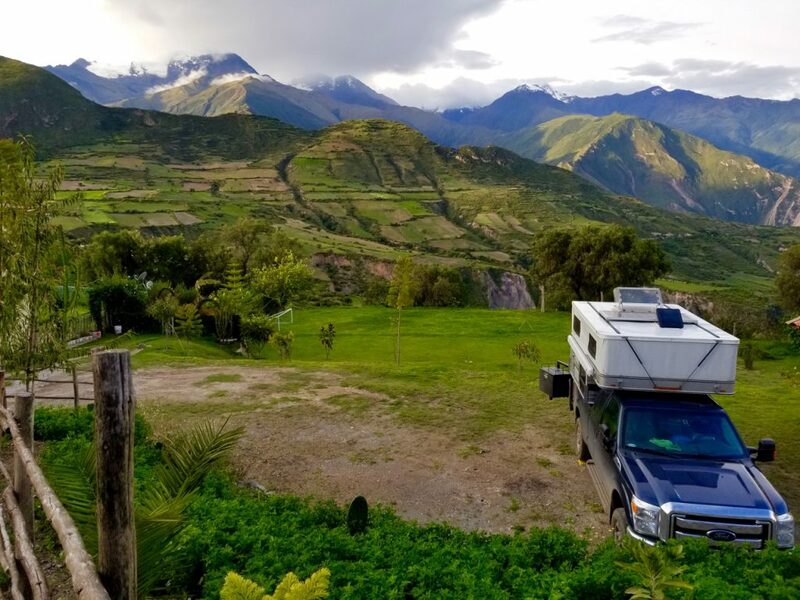 Below we parked at this great campsite in Curahuasi called Casa Lena Camping. 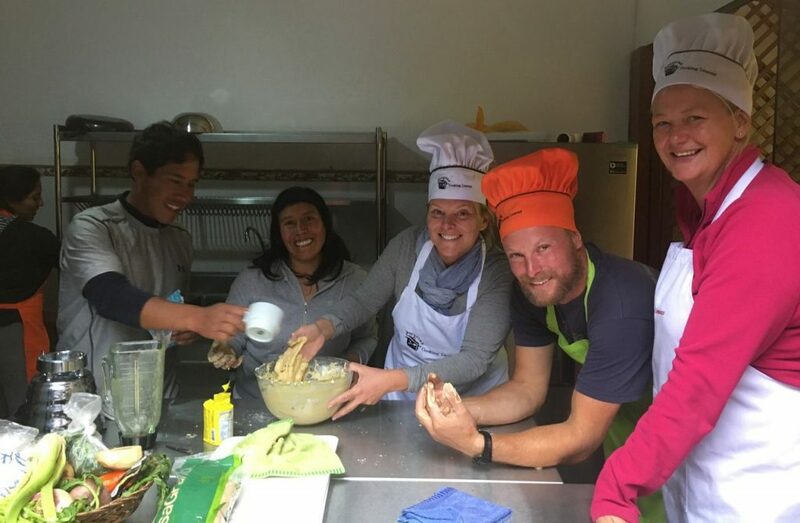 They help underprivileged kids and those with special educational needs in the community. 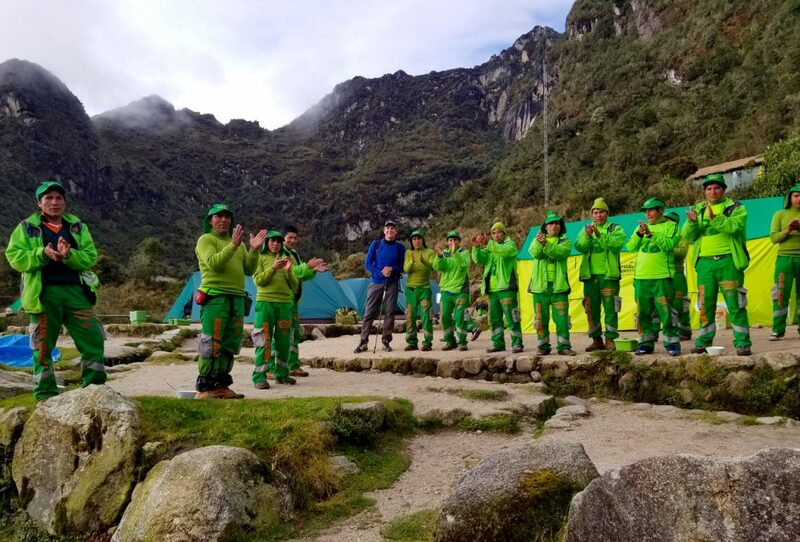 Camping $'s help fund these initiatives. 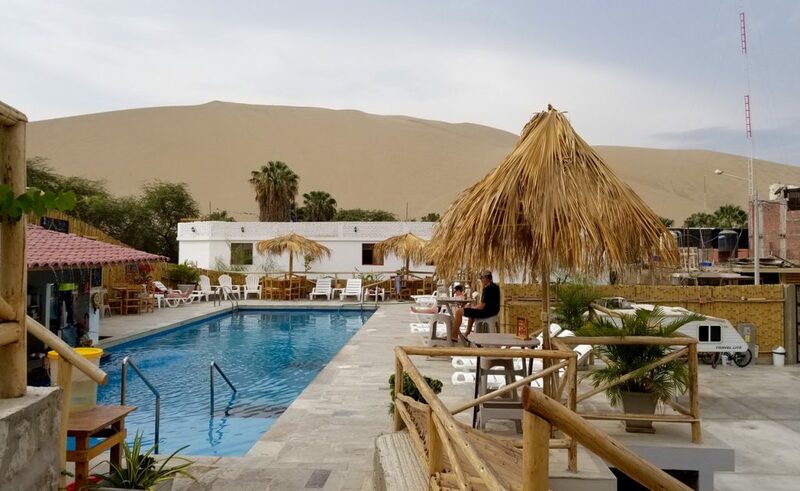 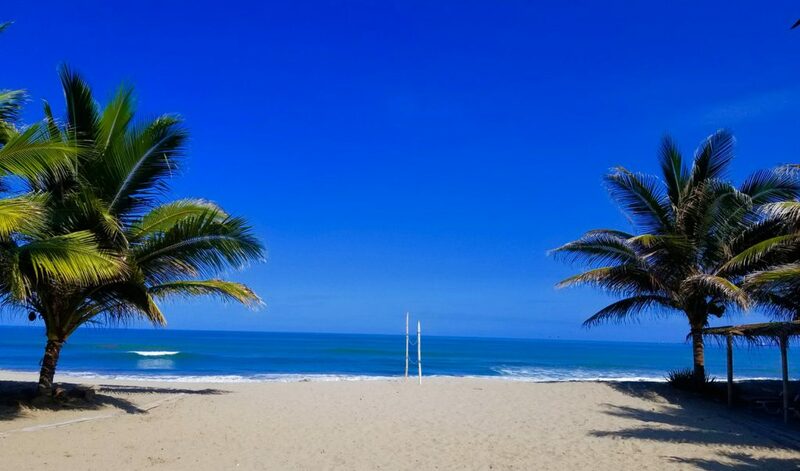 On their website (www.casalenaperu.com) they list items needed at the school....and the views are awesome! 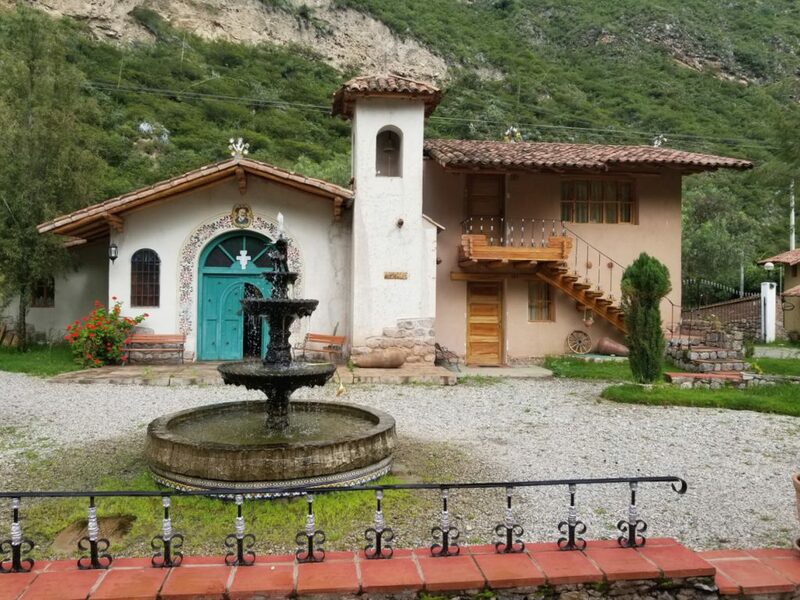 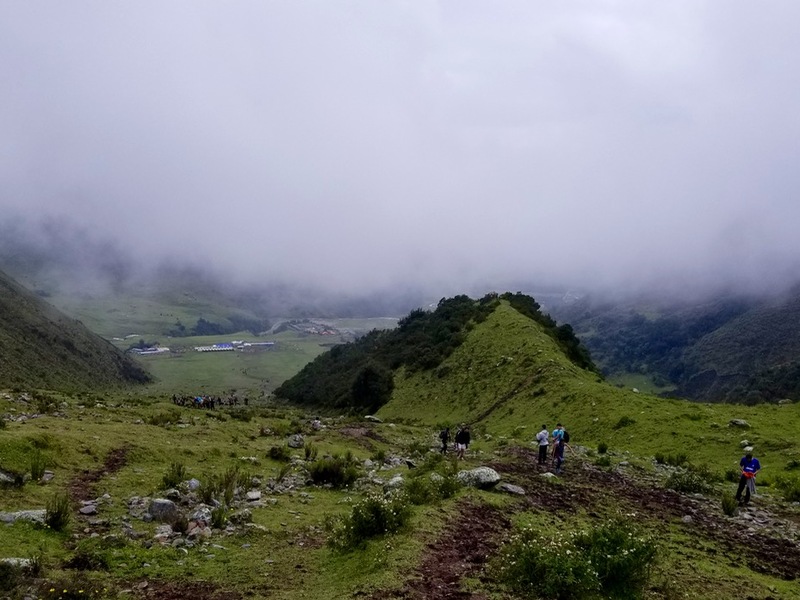 Off to hike to Laguna Humantay in the Vilcabamba Range of the Andes of Peru. 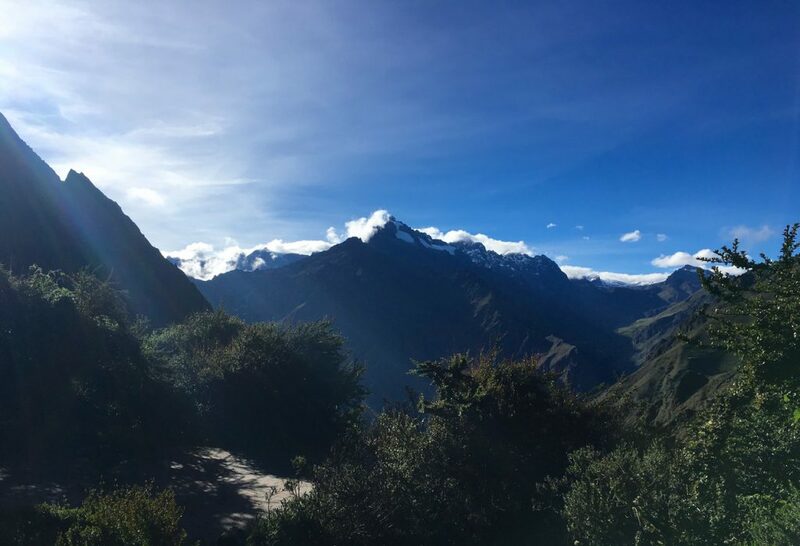 Its a short steep hike along the famous Salkantay Trek. 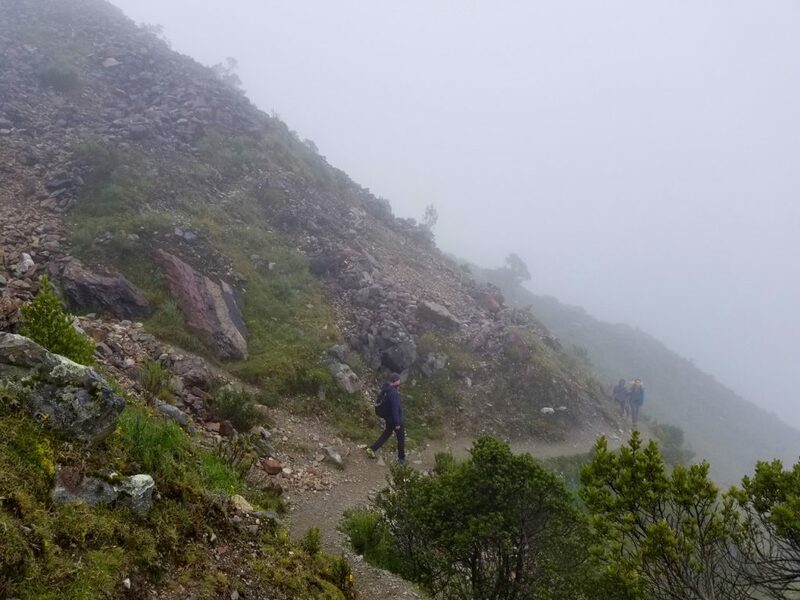 At 4200 meters, with rainy season still in full force we were assured a damp, cold hike but we needed to build some fitness for our Inca Trail hike. 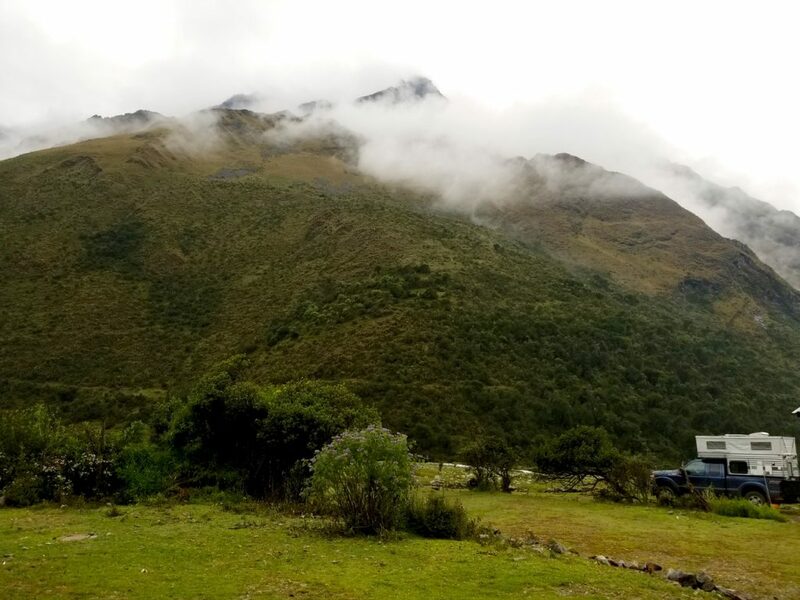 Camping at the base allowed us to get up early and be the first on the trail. 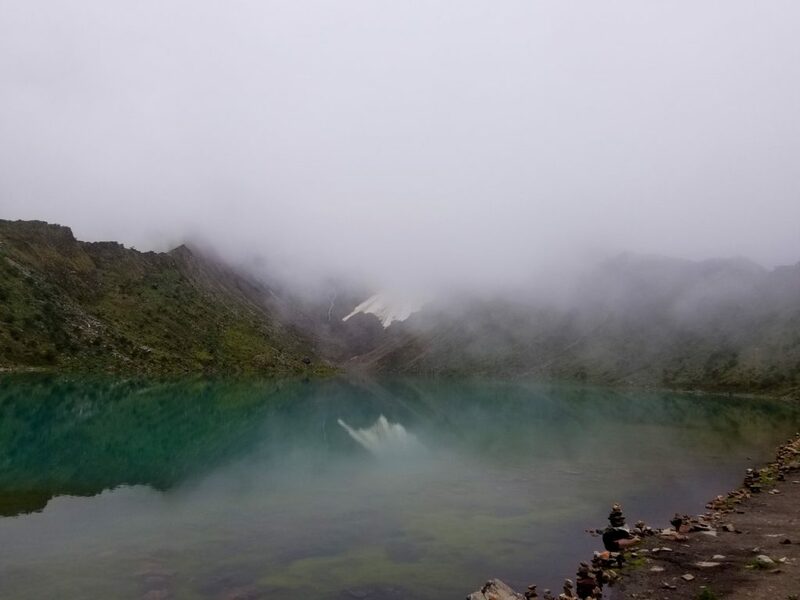 We made it to the lake just as the fog started to roll in. 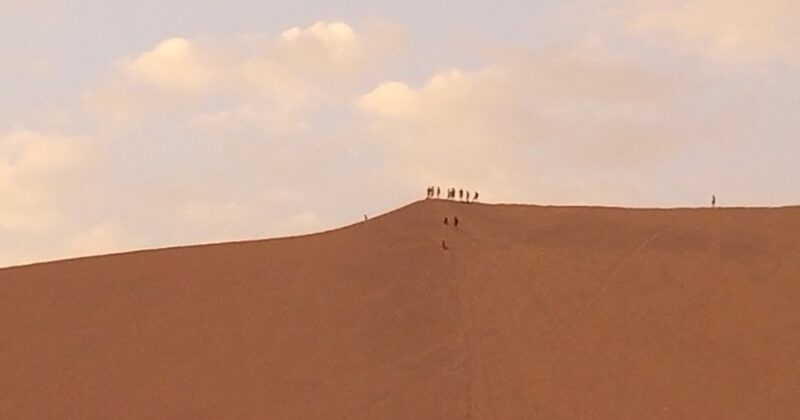 The next group on the way up won't have much to look at. 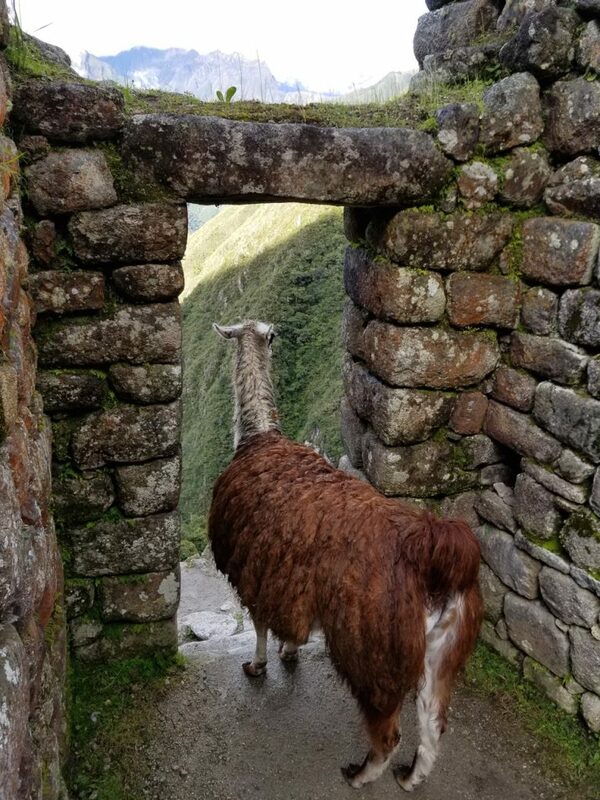 Llama jerky waiting for us when we make our way back down. 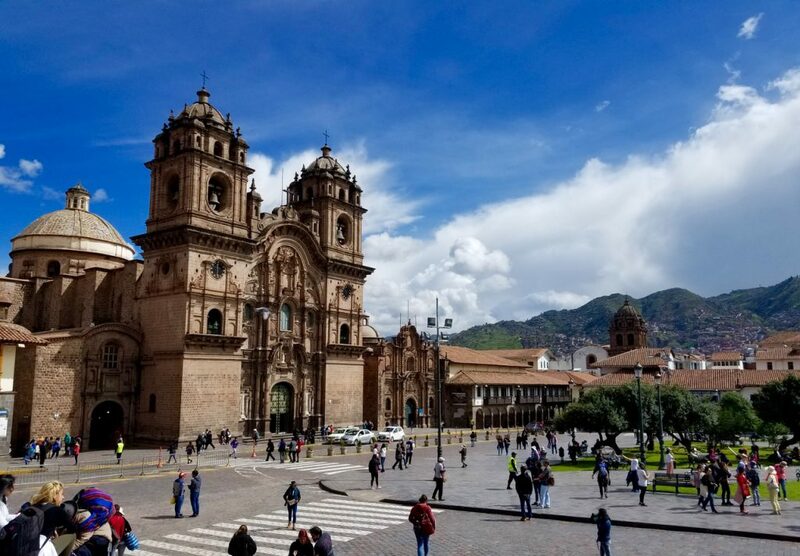 We soon move on to Cusco. 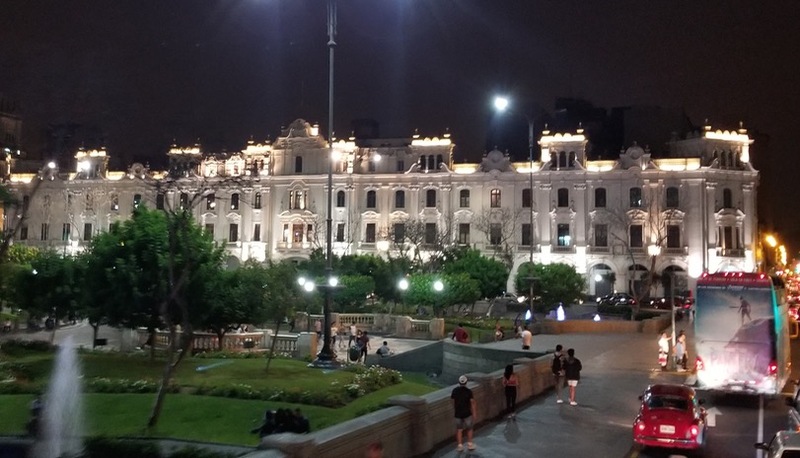 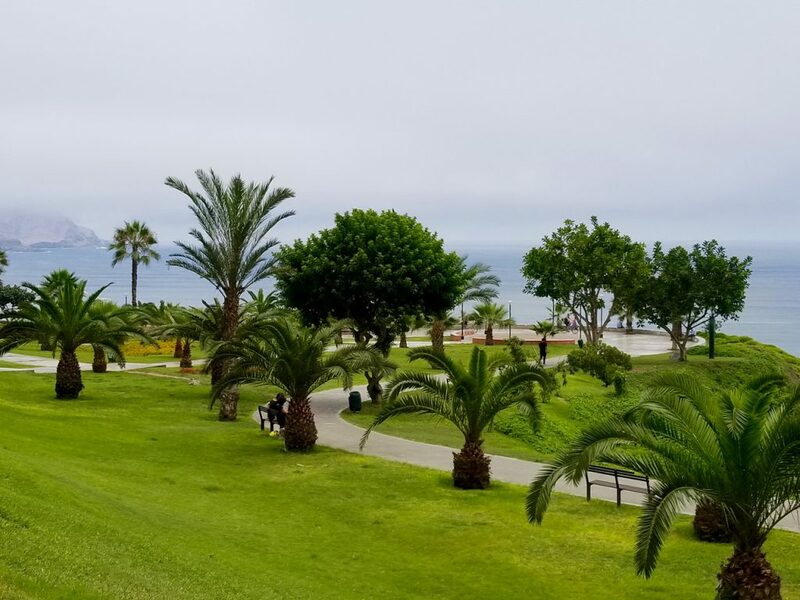 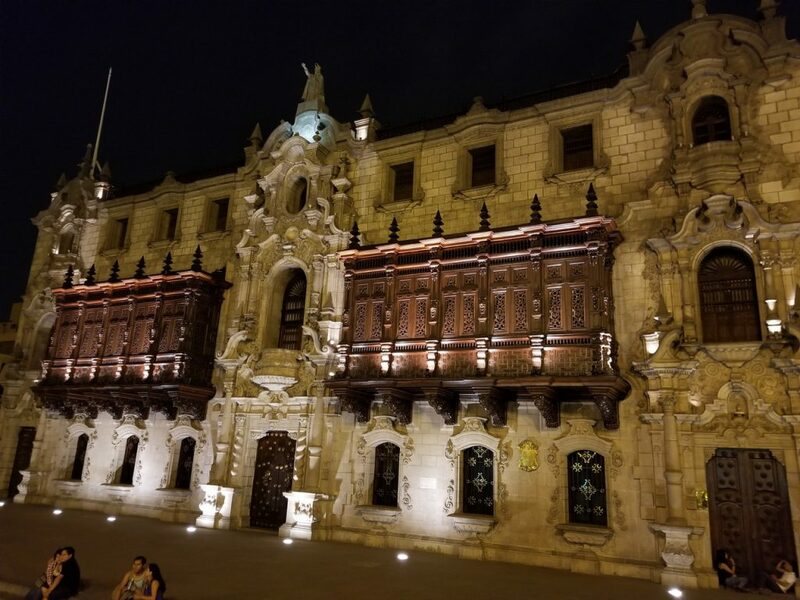 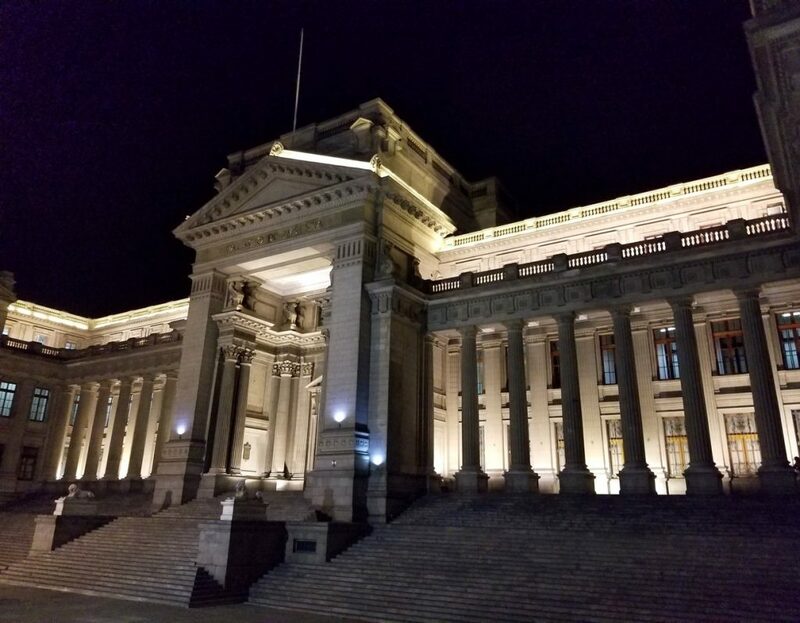 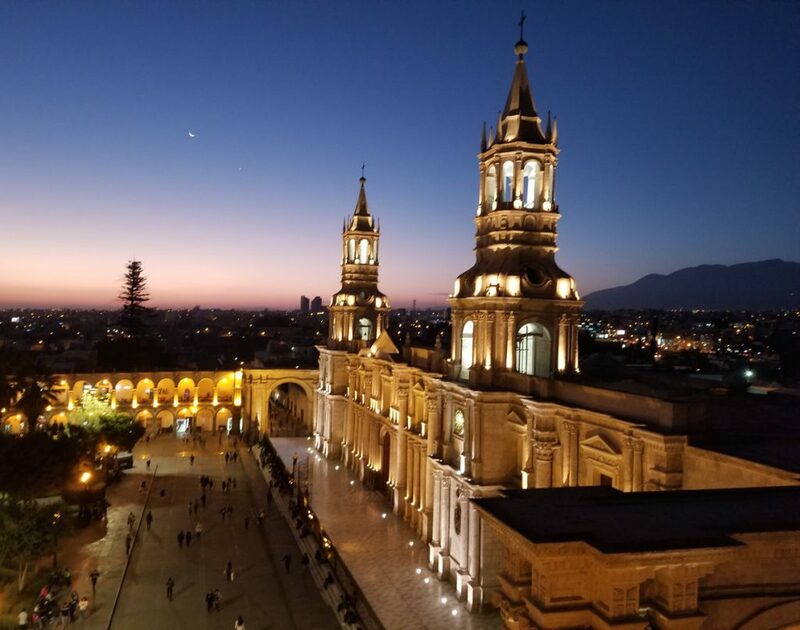 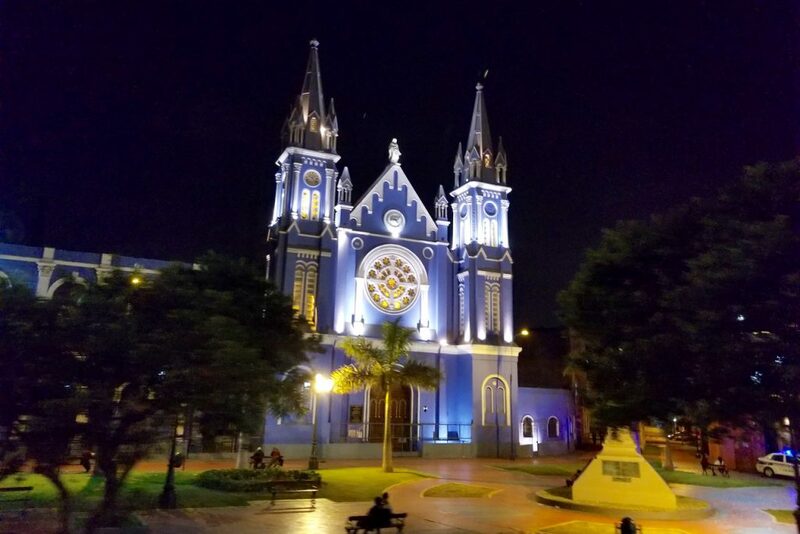 The "Historical Capital" of Peru. 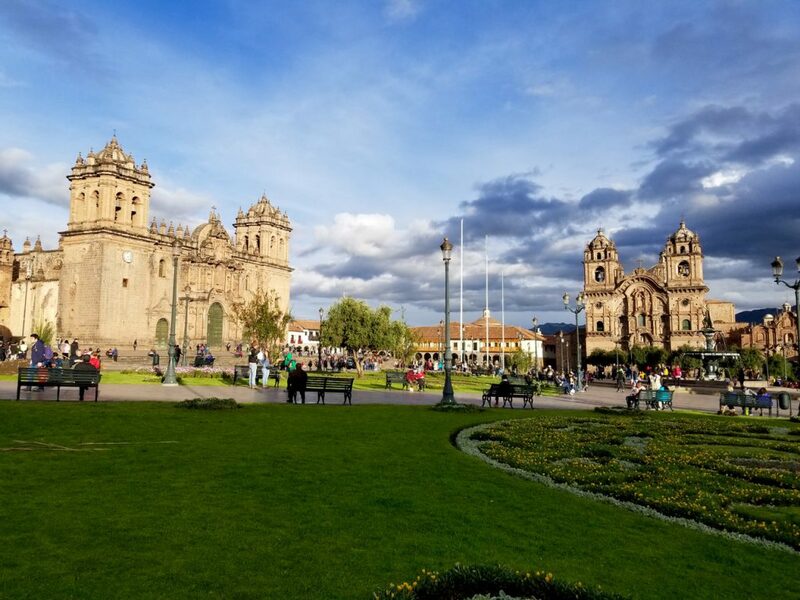 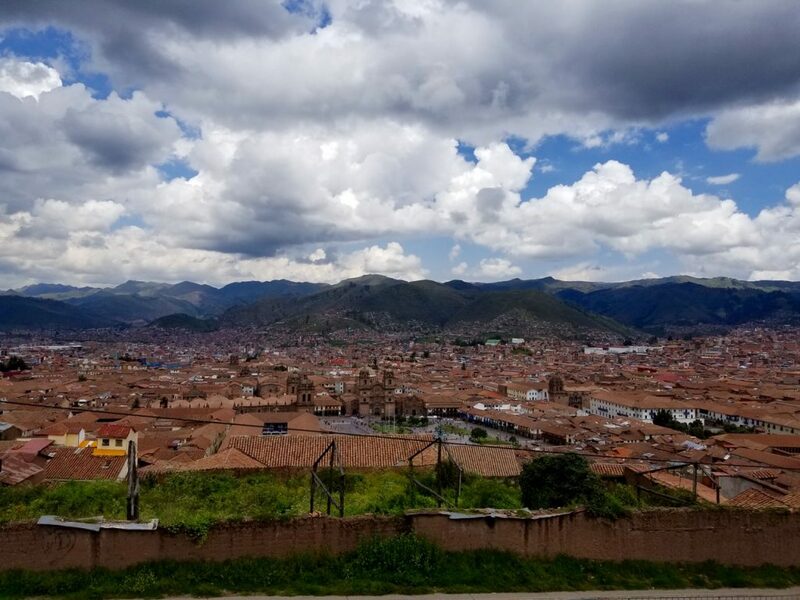 Cusco is the oldest city in the Americas at over 3,000 years. 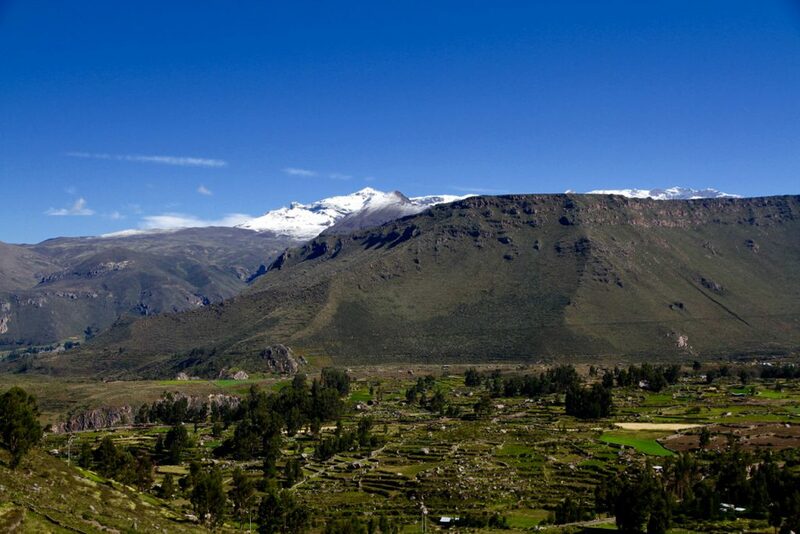 It was the capital of the Incan Empire from the 13th to the 16th Century when it was conquered by the Spanish. 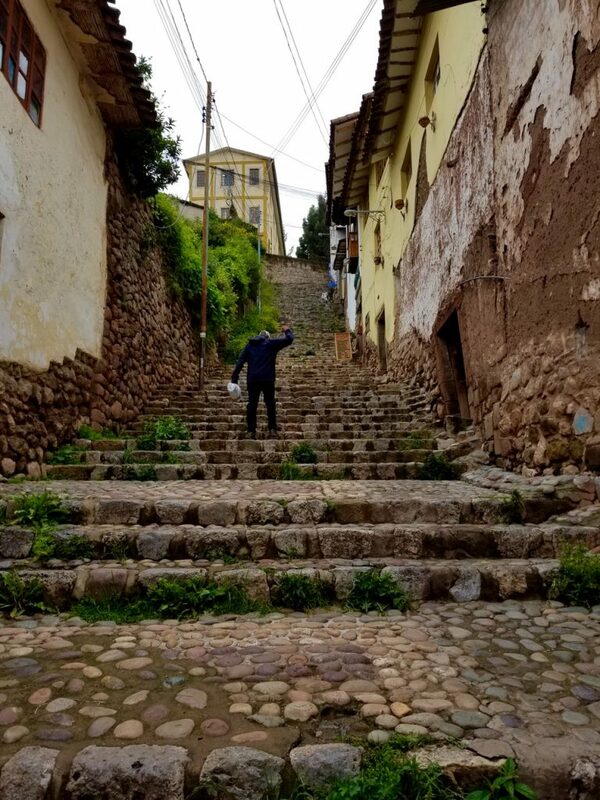 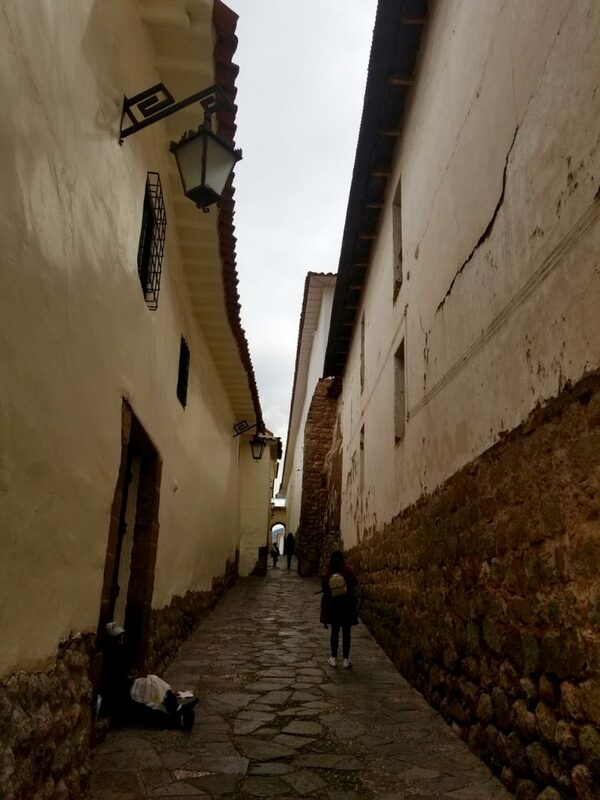 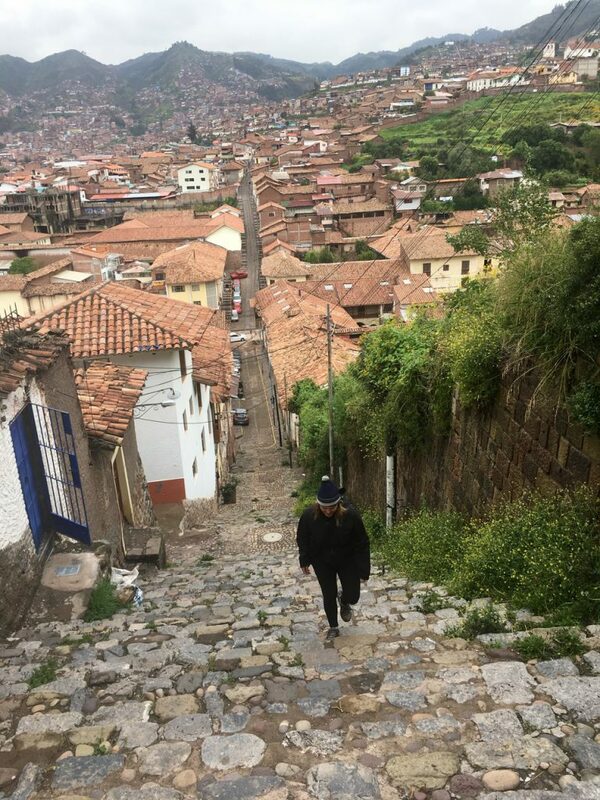 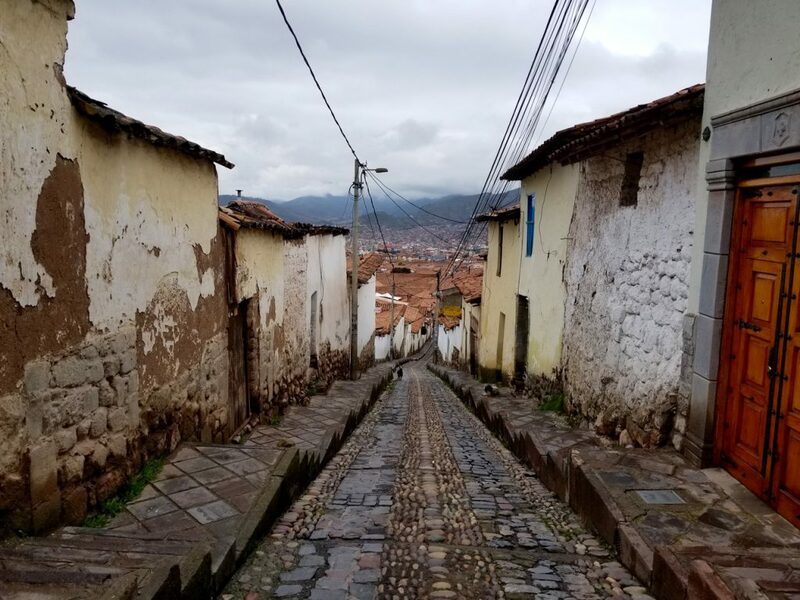 At 3,400 meters (0ver 11,000 feet) even just maneuvering the steep Cusco cobblestone streets and steps was a challenge the first couple days. 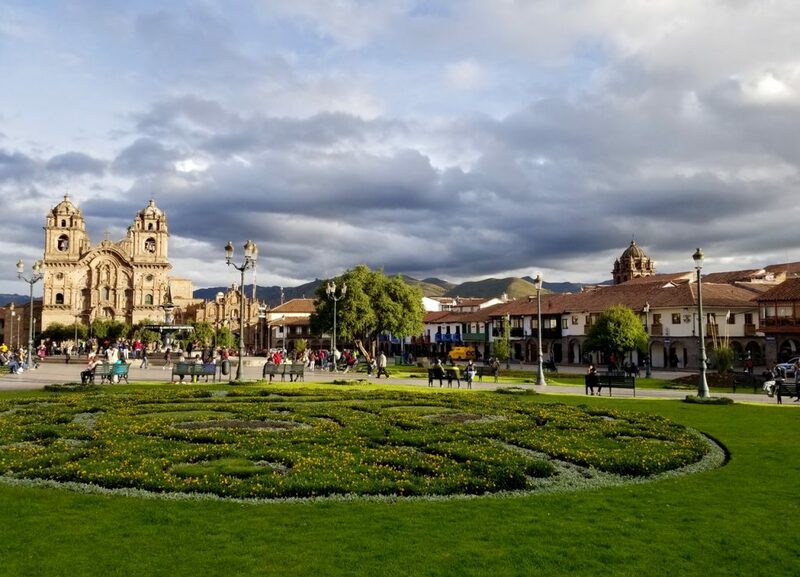 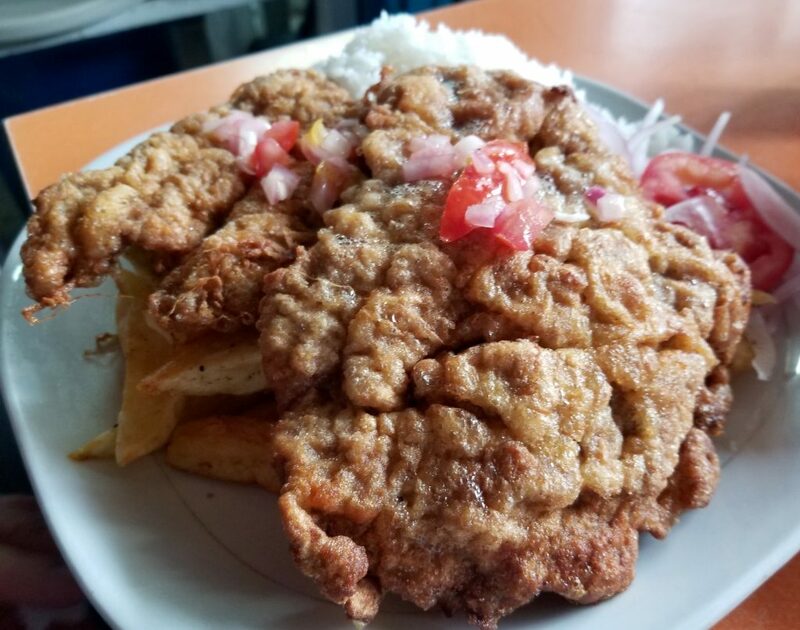 Like so many Latin American towns, Cusco has a fantastic local market (Mercado Central de San Pedro) with a section of cooked food stalls serving up huge portions of delicious local grub.....Cheap! 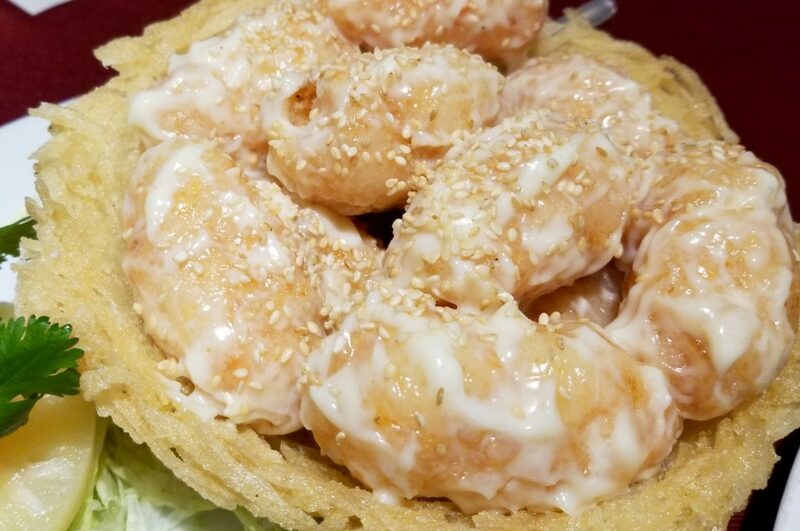 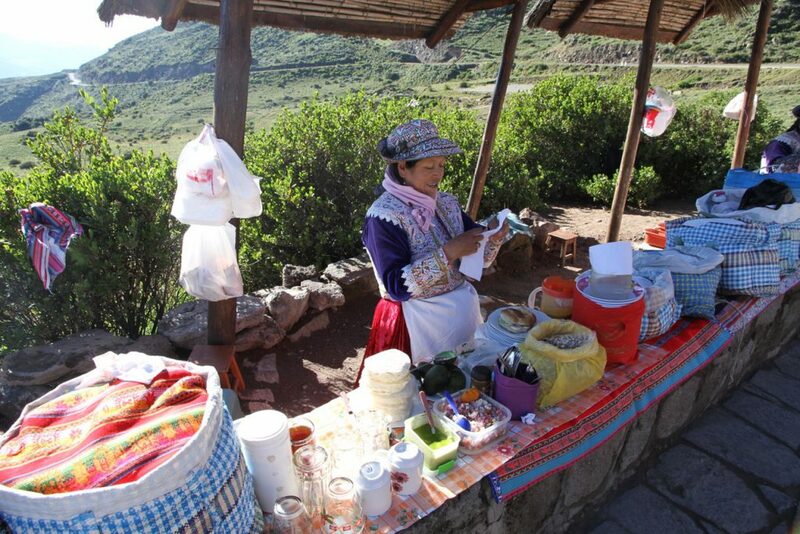 As Cusco is a major tourist destination it also has a great higher end food scene. 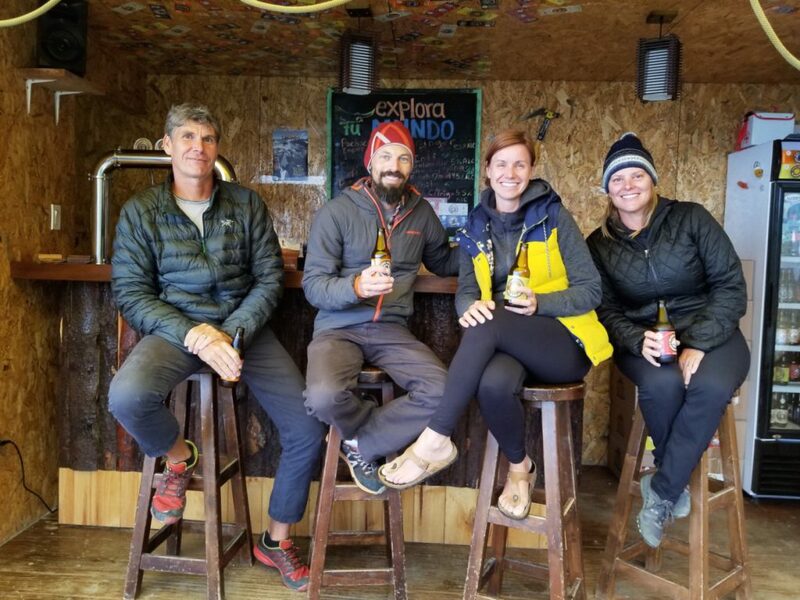 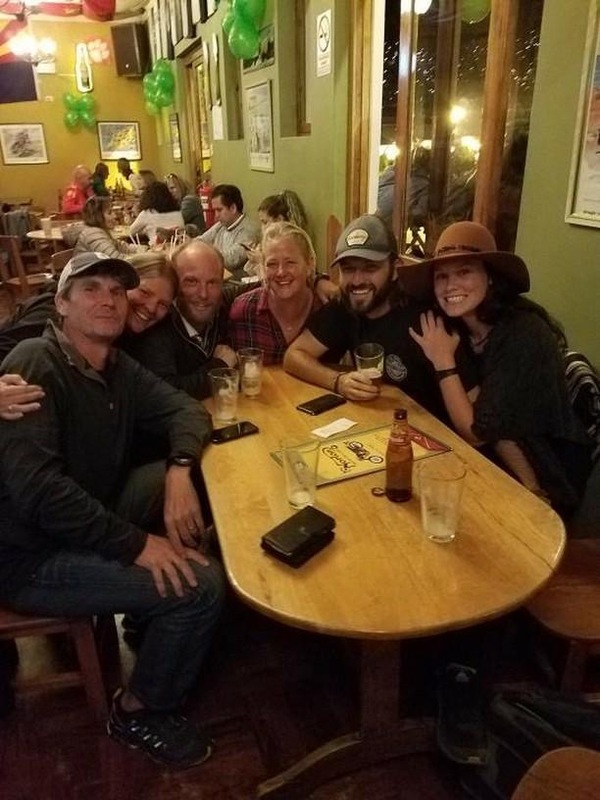 As everyone traveling to Peru passes through Cusco, it's a great place to meet up with fellow Overlanders for a pint. 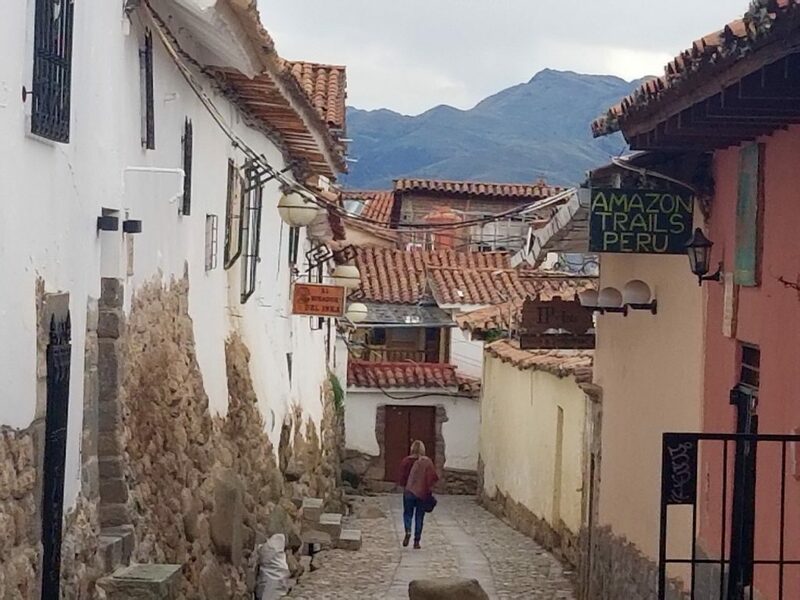 No shortage of tourist shops to work out a new look. 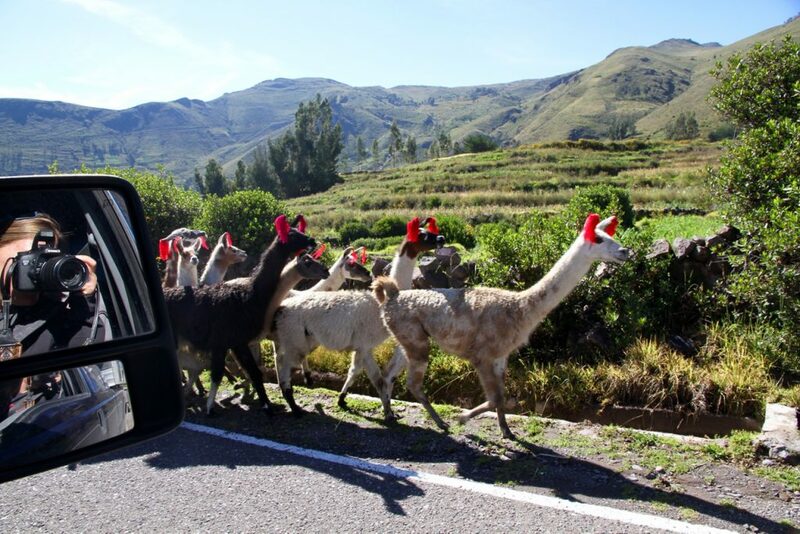 On the way to market to grab some ingredients for a Peruvian cooking class with Rachael and Richard from the UK. 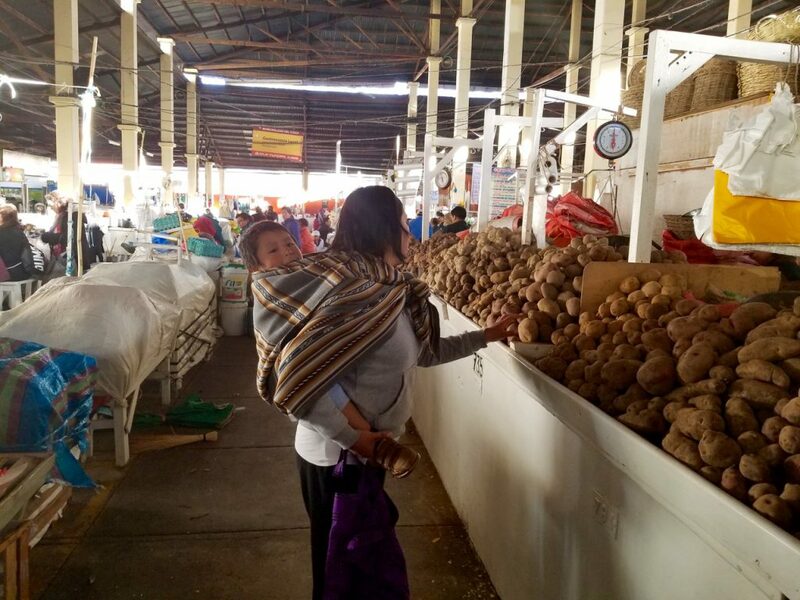 Our Chef and assistant picking out potatoes from the more than 4,000 varieties found in Peru. 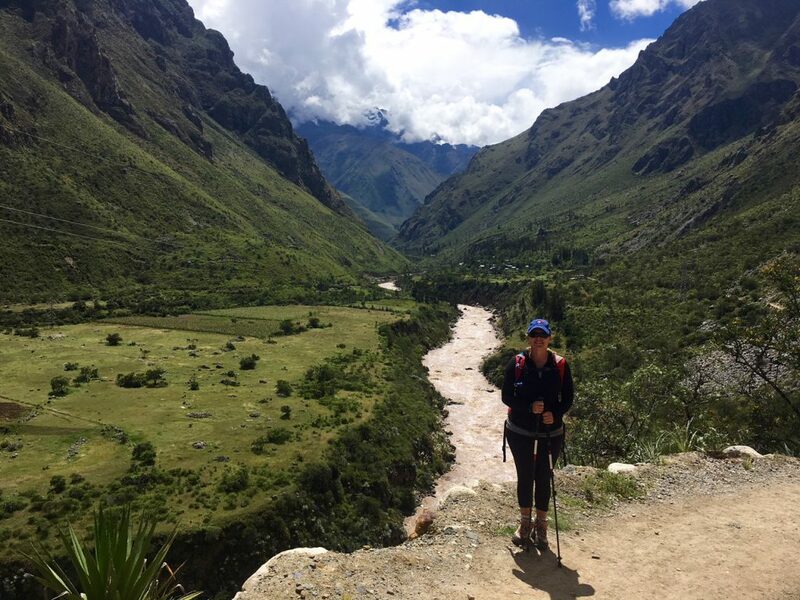 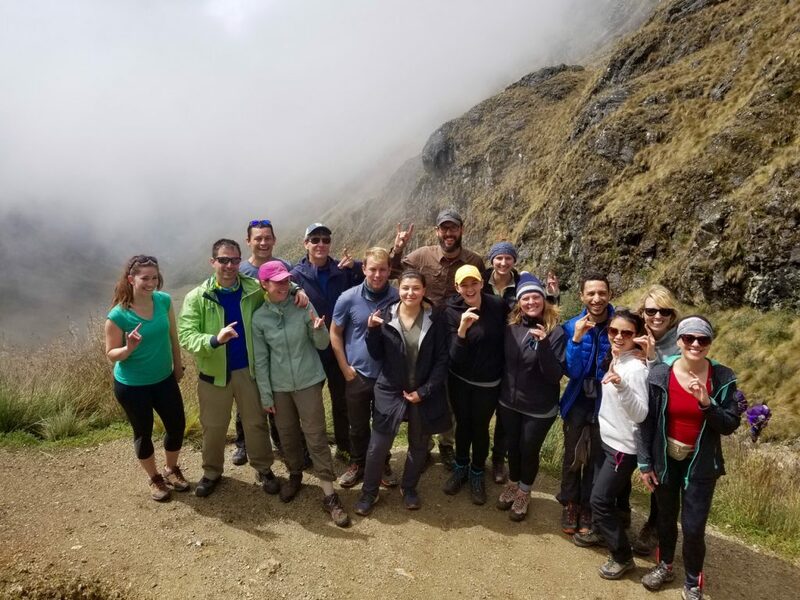 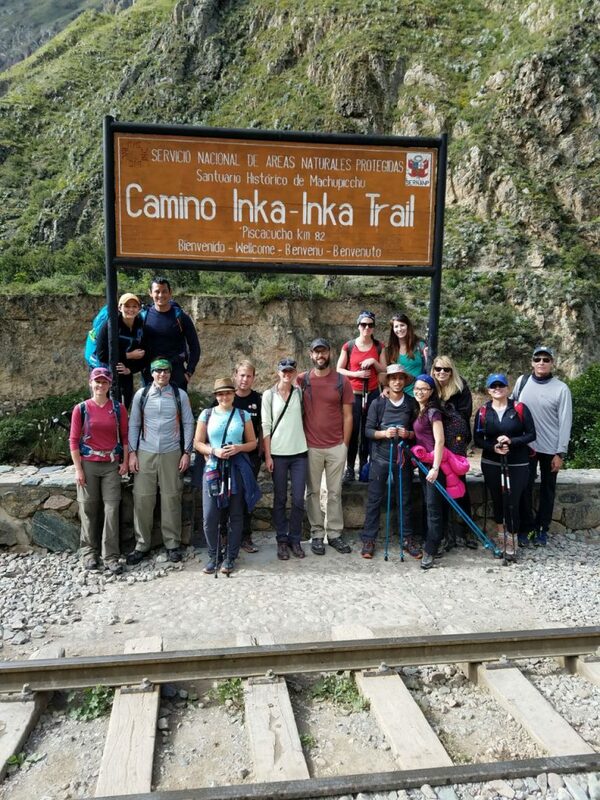 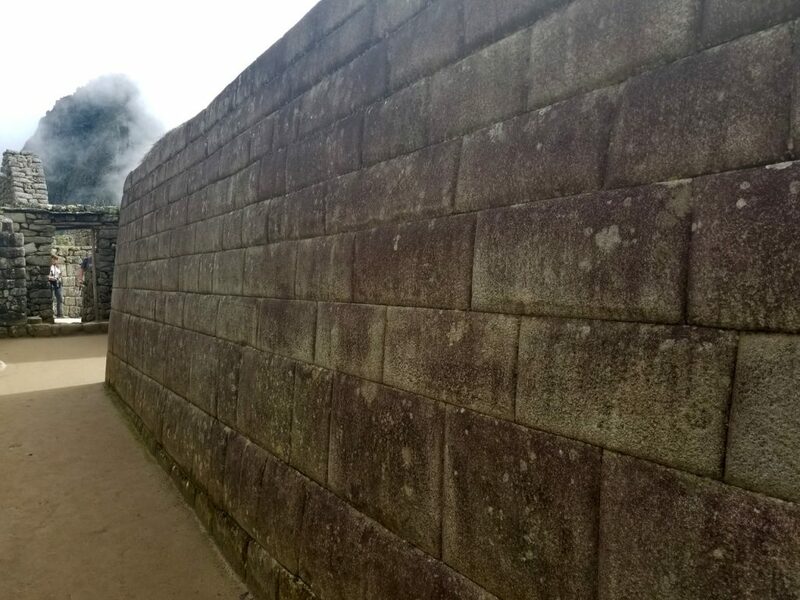 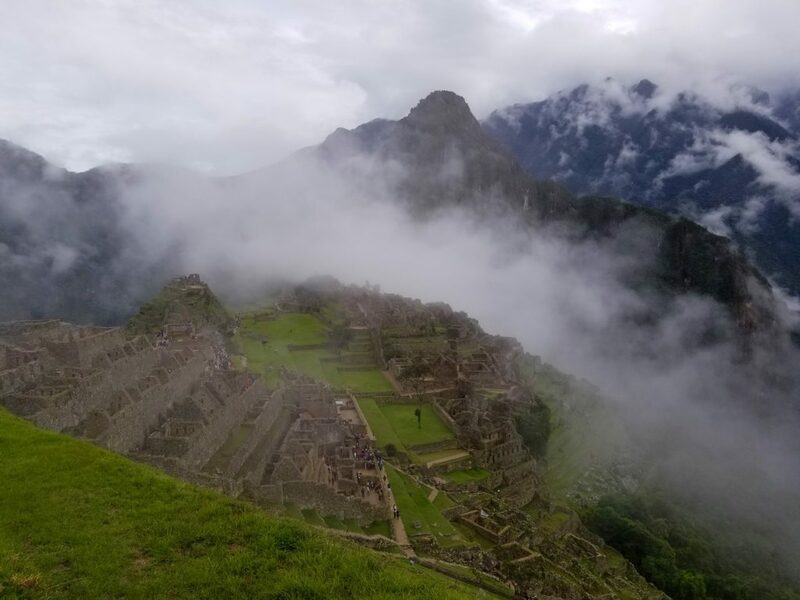 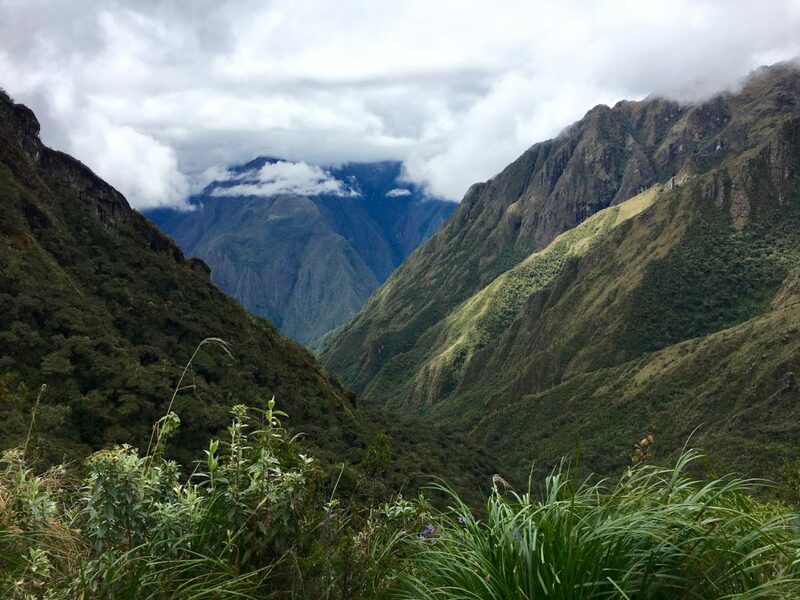 It was soon time for our Inca trail hike to Machu Picchu - 4 days climbing over 4200m mountain passes and one of the best experiences of our journey. 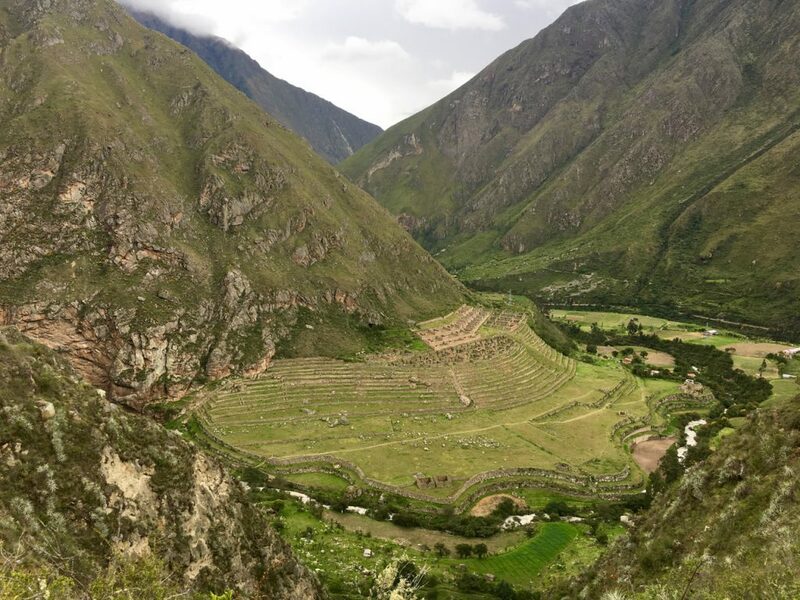 The Inca trail hike begins in Ollantaytambo. 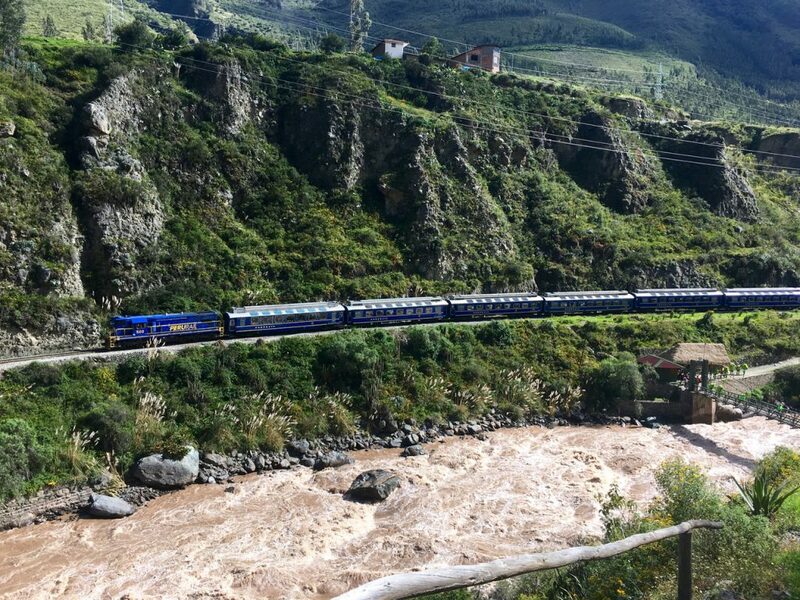 After completing our four day trail hike we'll return to town in comfort aboard PeruRail. 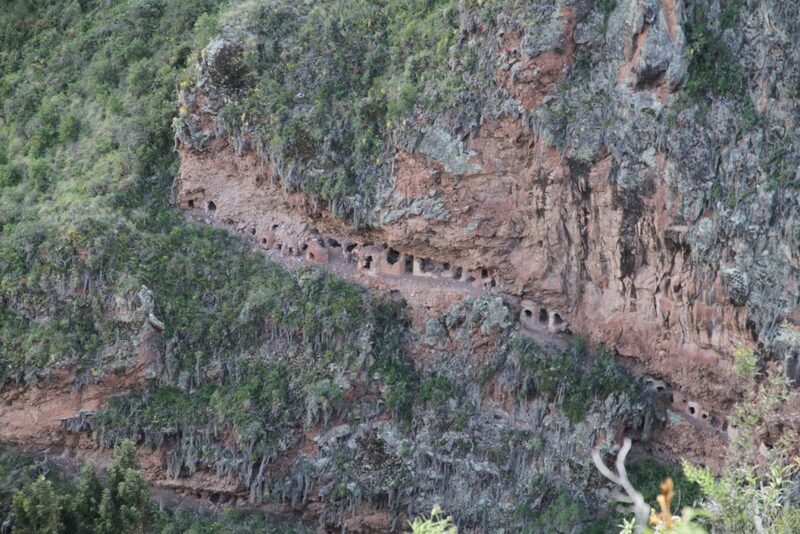 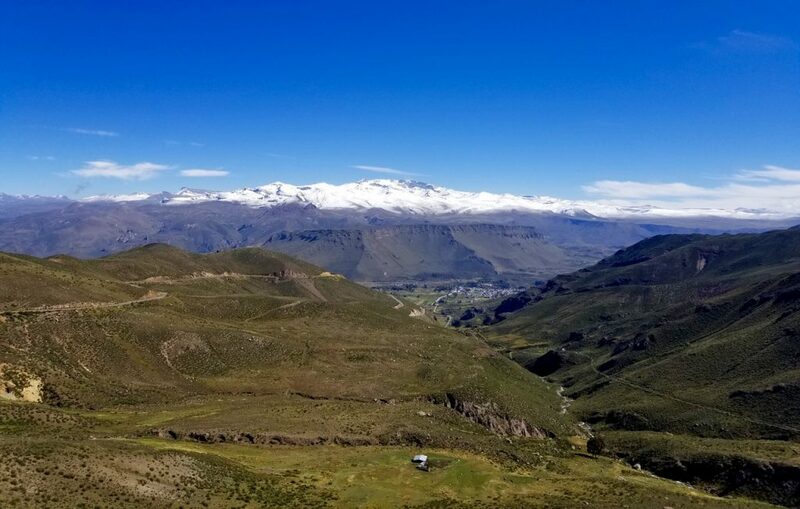 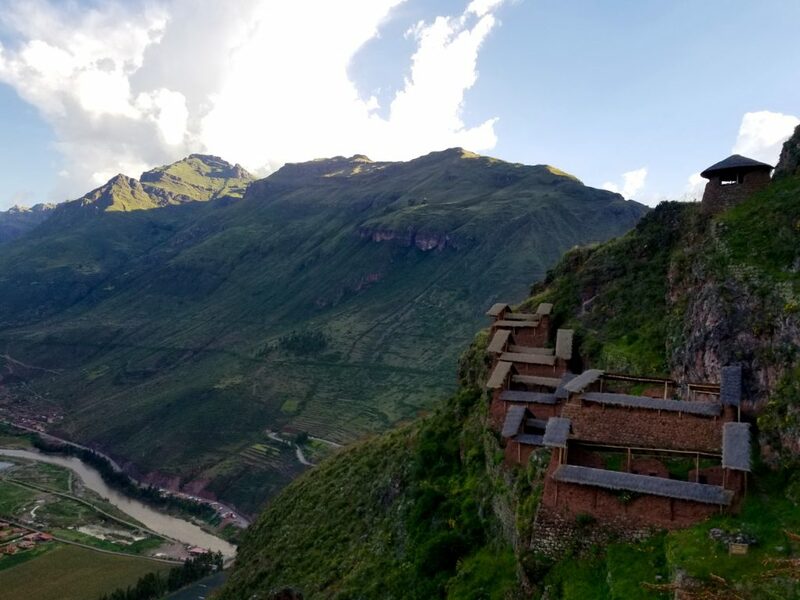 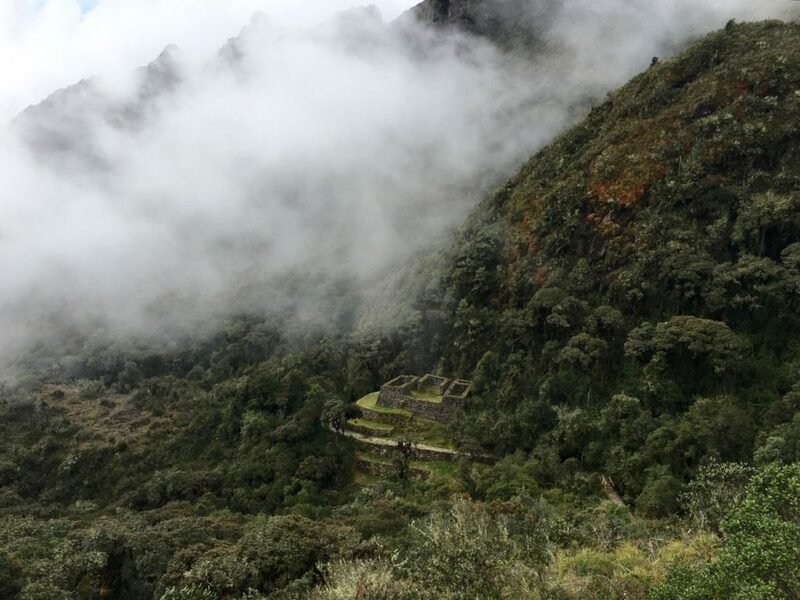 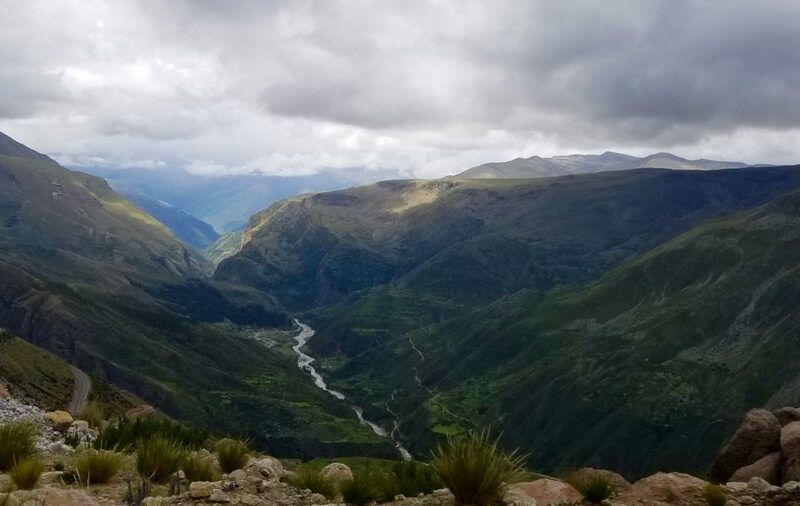 Our hike begins under cloud cover but the skies will soon clear to reveal the spectacular scenery of the Sacred Valley. 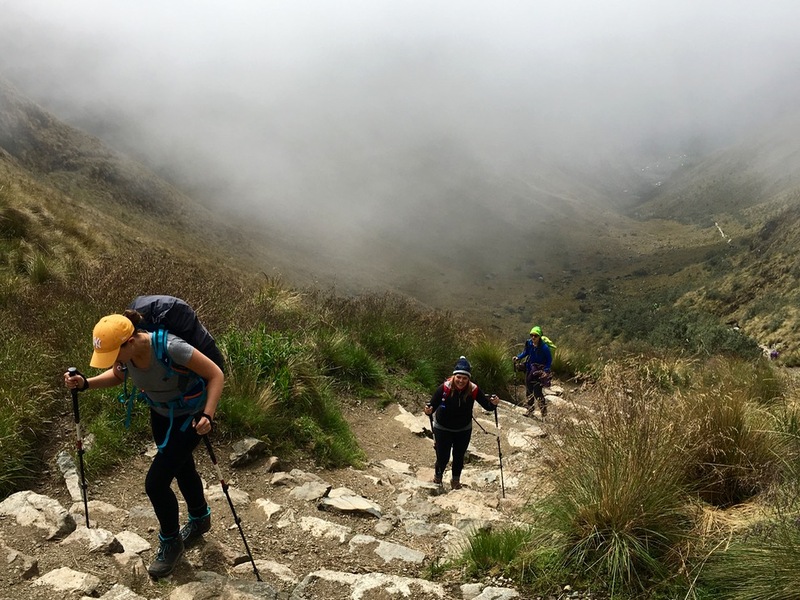 Once underway, we start to feel the burn in our legs almost immediately. 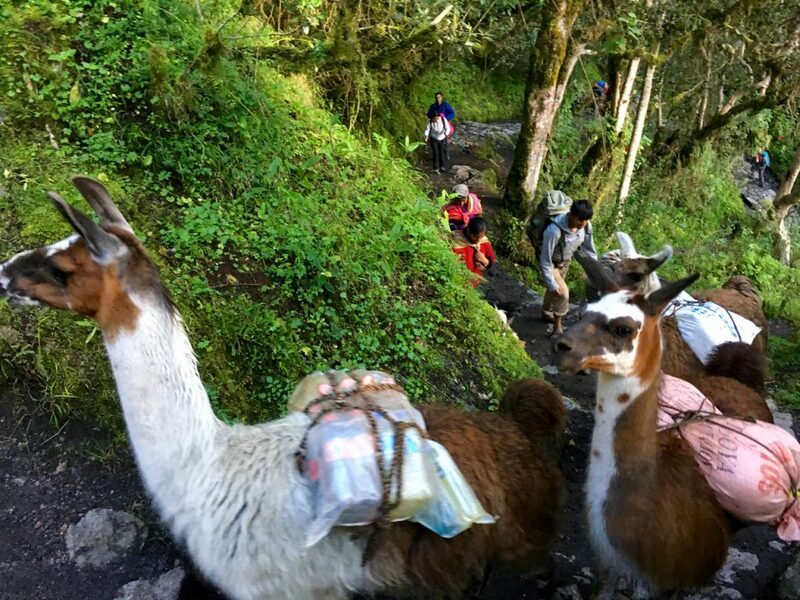 ...and then our porters who are carrying virtually all of our gear fly past us like we're standing still. 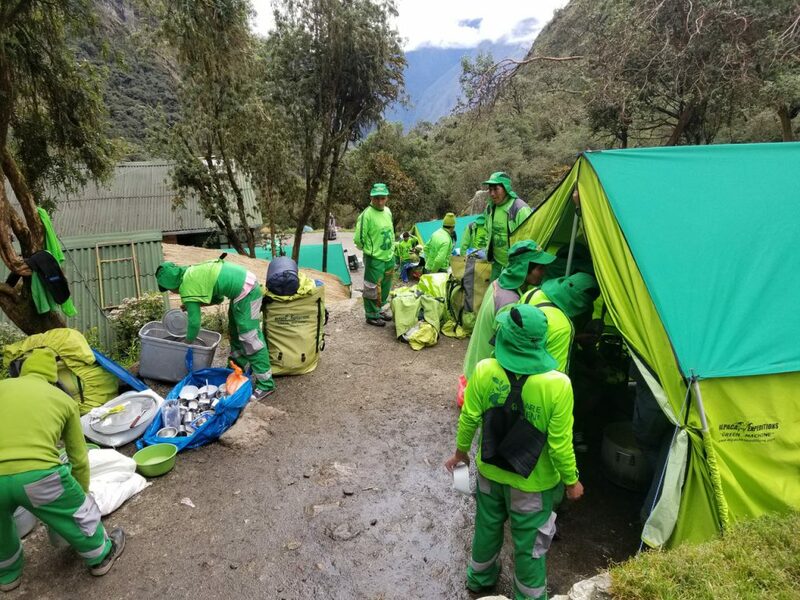 Each afternoon this group beats us to the site and sets up our camp before we can drag ourselves up the mountain. 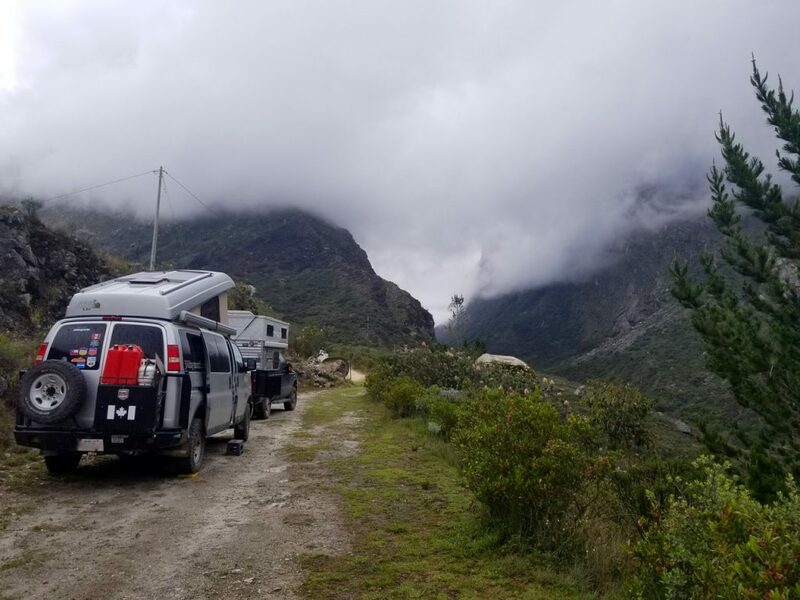 After we leave camp in the morning, they tear everything down, pack up and usually catch up to us in a couple hours. 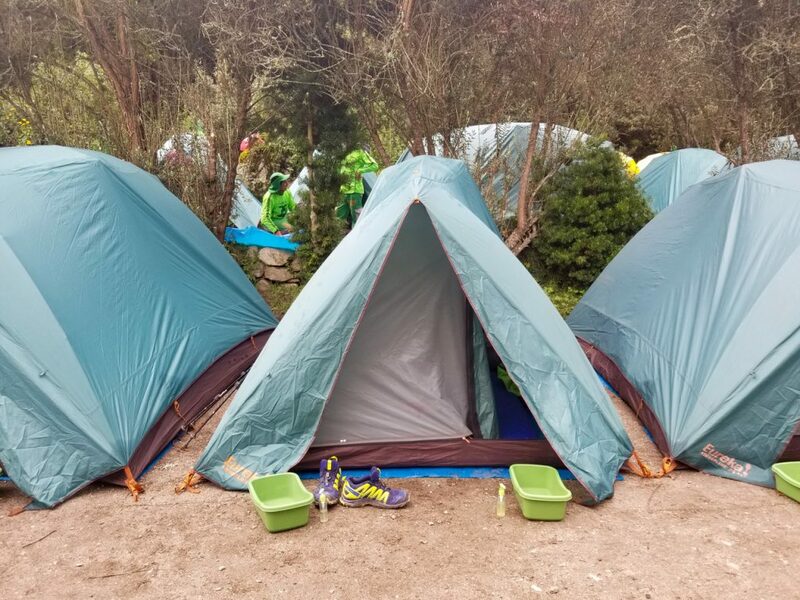 Our camp, complete with warm water foot soaking buckets with soap. 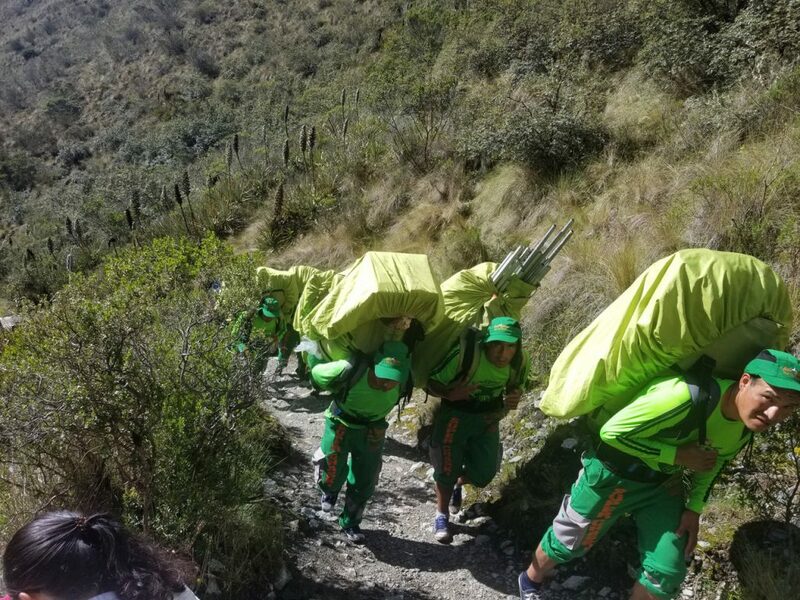 If carrying all the gear, running past us on the trail, setting up camp and having cocktails and snacks ready for us when we arrive isn't embarrassing enough, each day the porters also line up and clap for us as we crawl into camp. 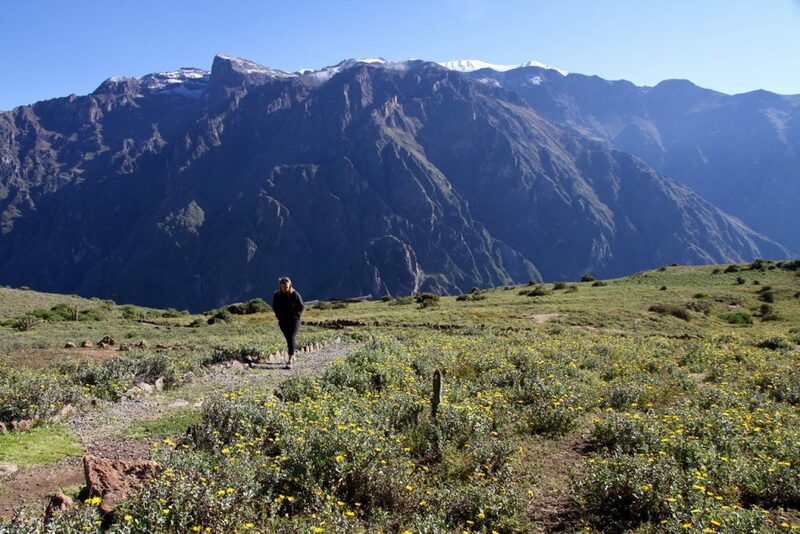 Each day along the Inca Trail reveals another spectacular Incan city. 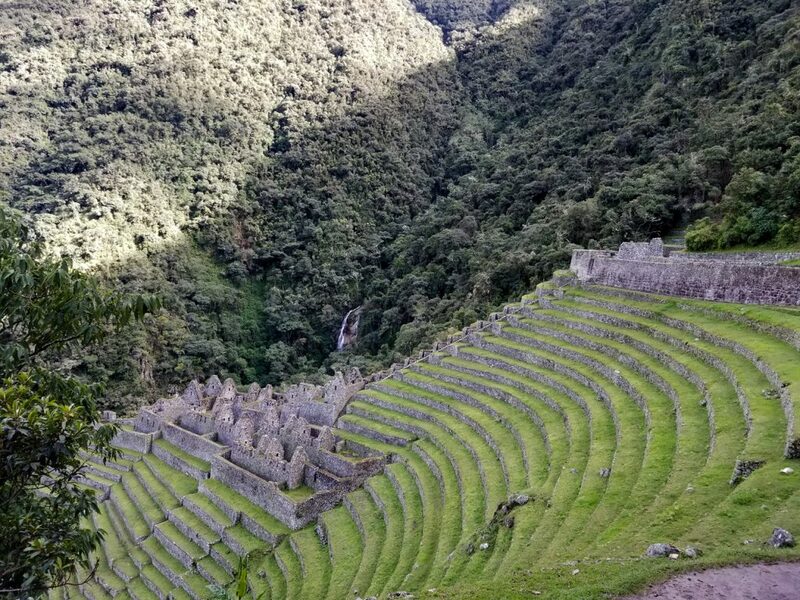 One of our favourites on the trail ~ the Wiñay Wayna Incan ruin. 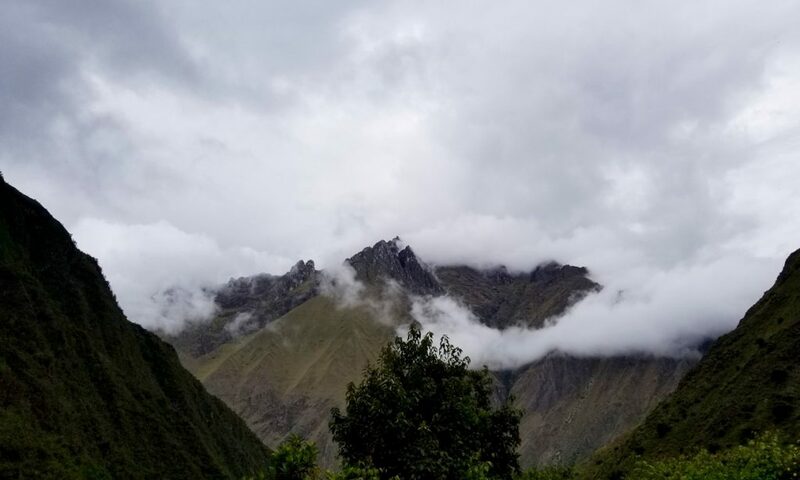 On the morning of day four, after an early morning hike through the pouring rain, Machu Picchu reveals itself through the clouds. 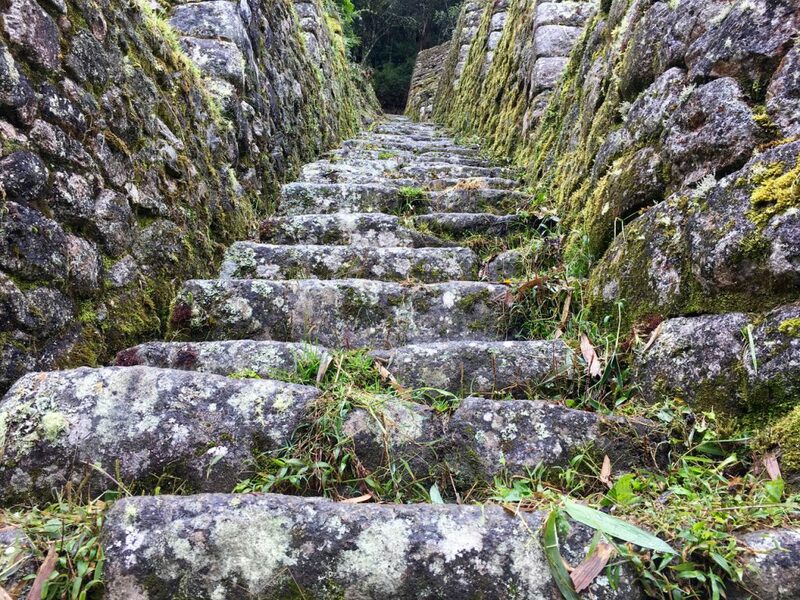 Machu Picchu is an Incan Citadel that was built in the 15th Century. 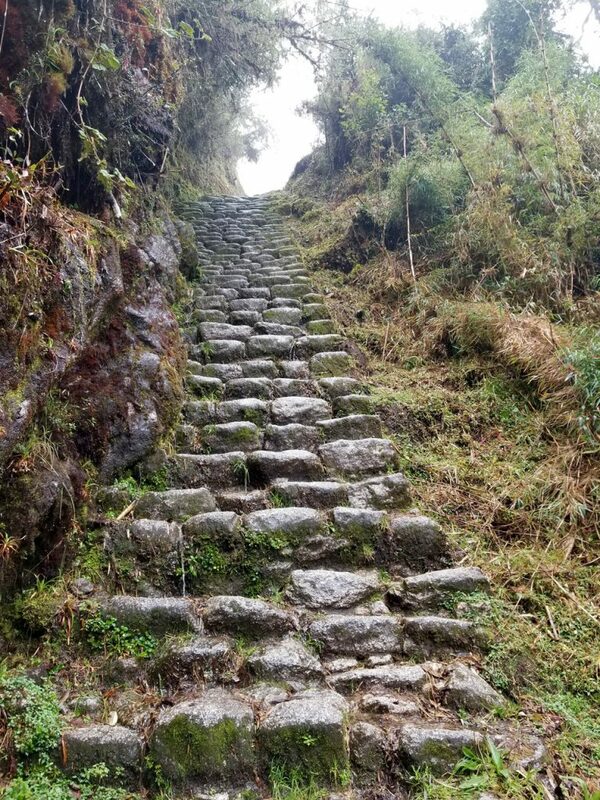 Famous for its beauty and location it is mostly renowned for its construction technique where huge stones are stacked and fused without the use of mortar. 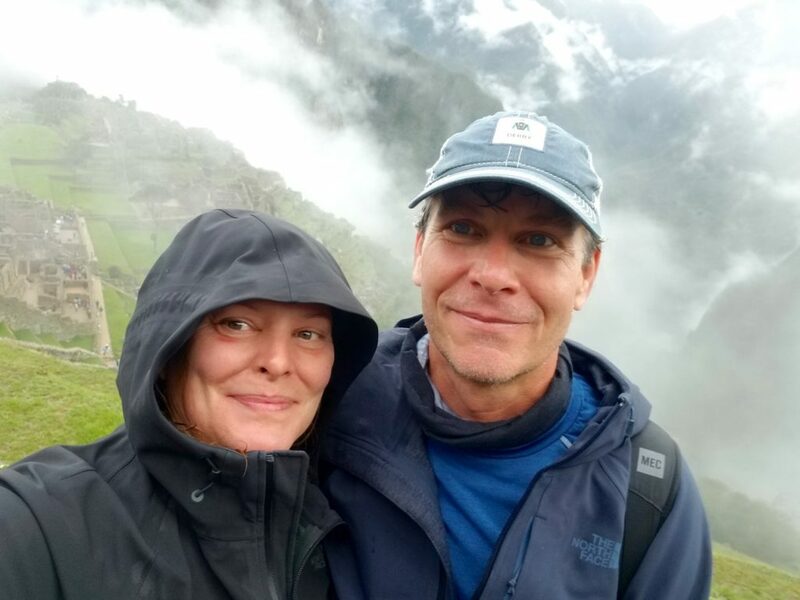 Tired and more than a little haggard after our four days on the trail we came away from the experience very pleased with our accomplishment and in awe of the people who lived here and the sheer beauty of this part of the world. 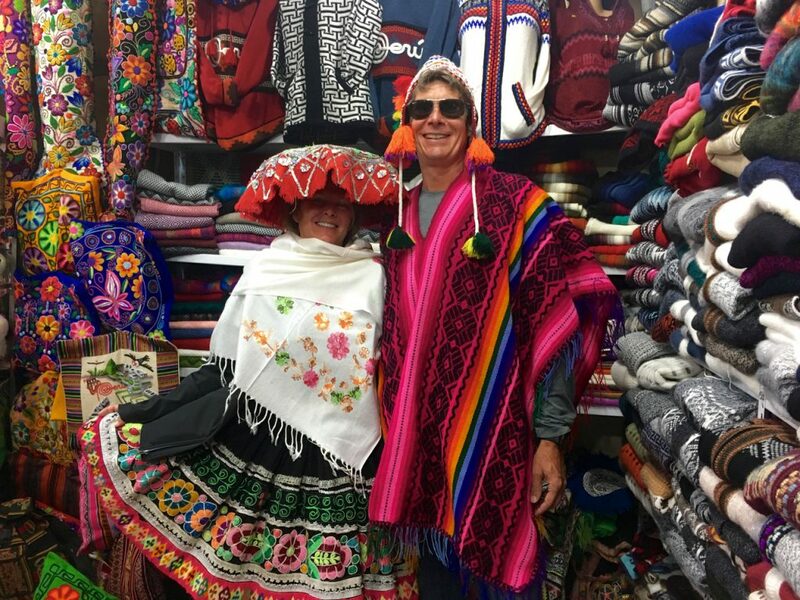 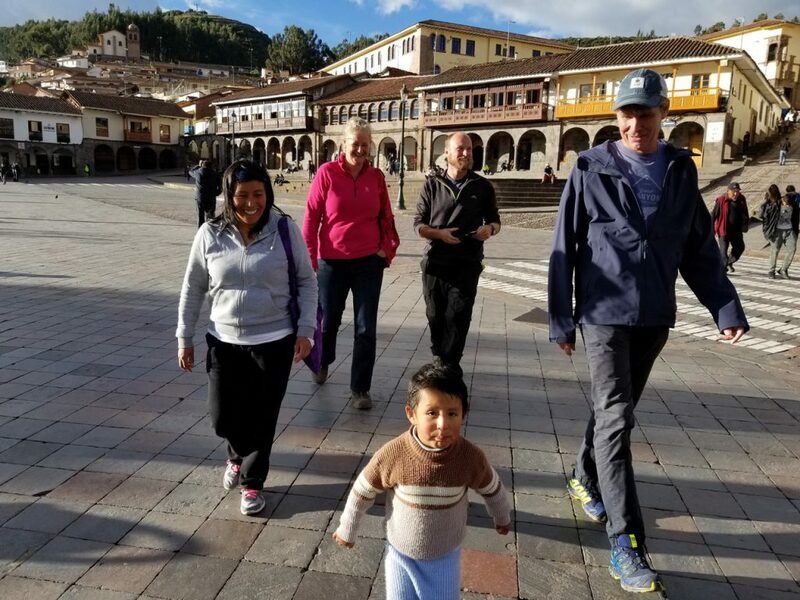 After a few days relaxing back in Cusco and we were ready to head off again and explore the rest of the Sacred Valley. 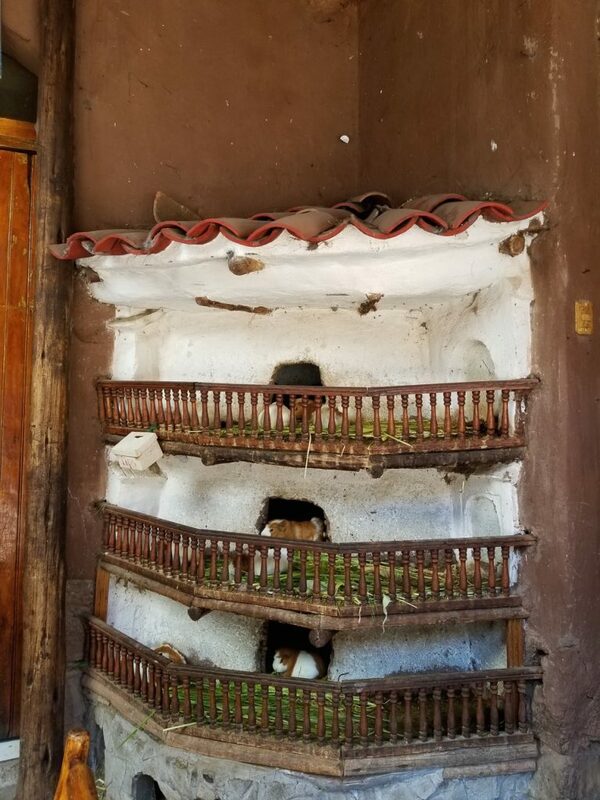 A Cute Guinea Pig House....Come and Pick Out Your Lunch! 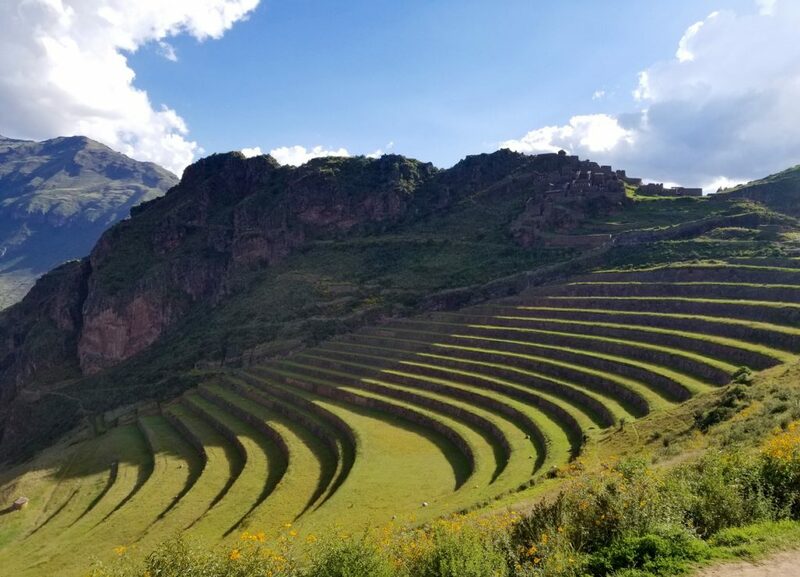 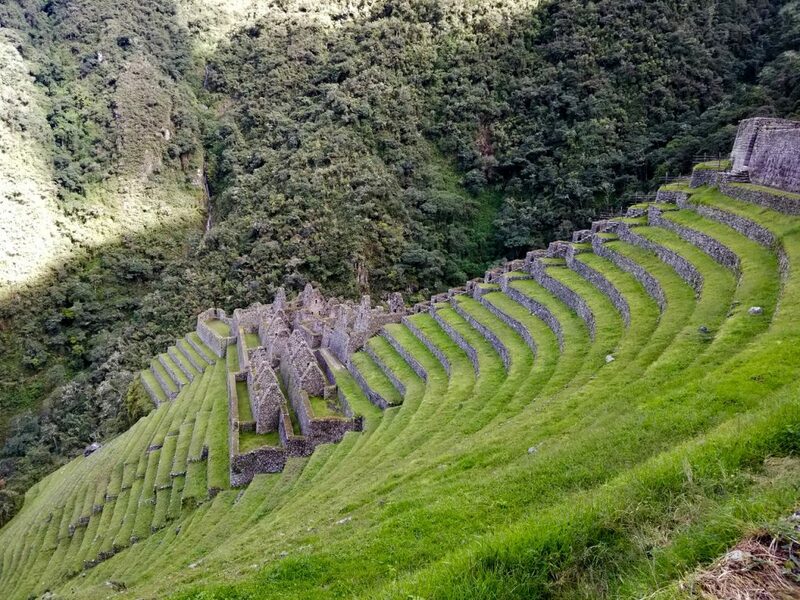 From Pisac we moved on to Moray and one of the best examples of the Incan agricultural terraces. 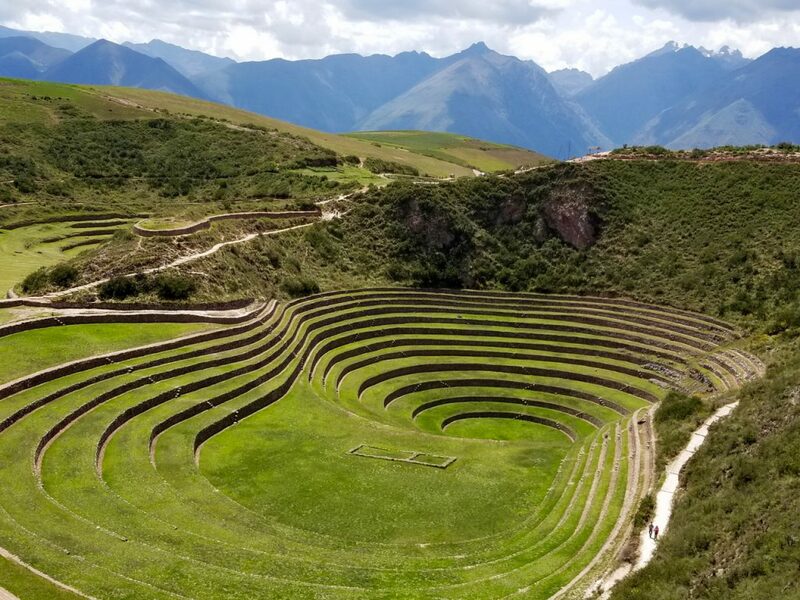 The temperature drops 15 degrees Celsius from the top ring to the bottom allowing a variation in the types of crops that would grow at different levels of the site. 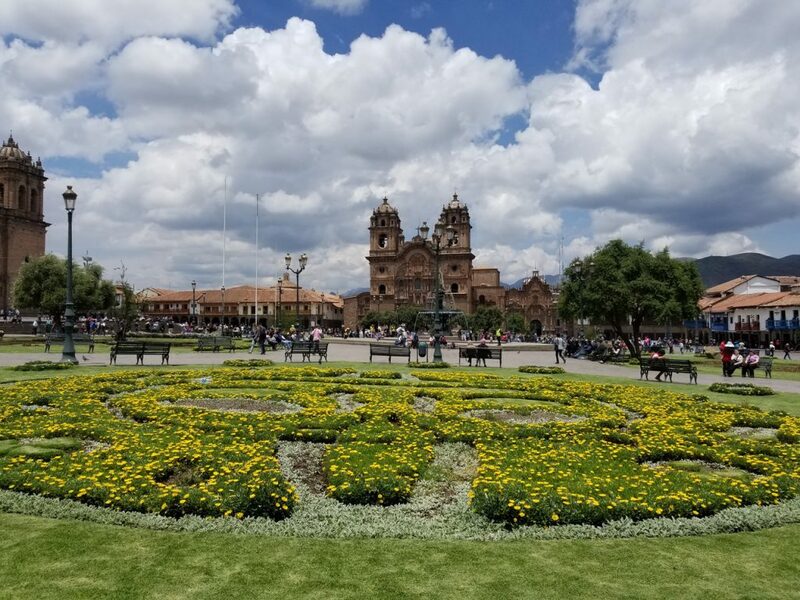 We do eventually drag ourselves away from Cusco and the Sacred Valley and head towards another colonial town, Arequipa. 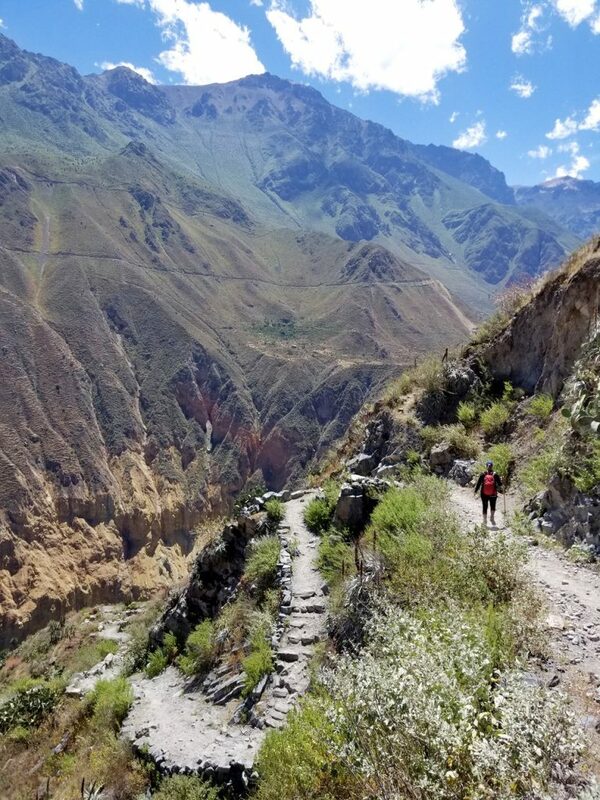 On the way, we spent a few days exploring the Colca Canyon and its giant condors. 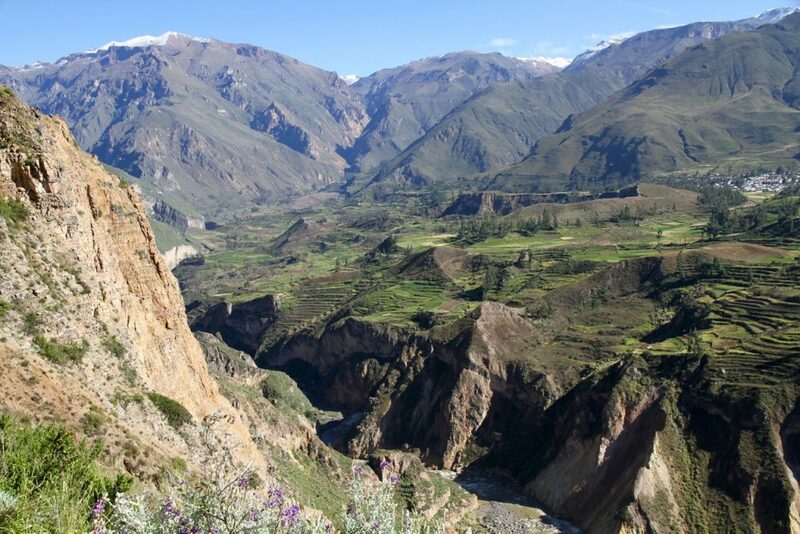 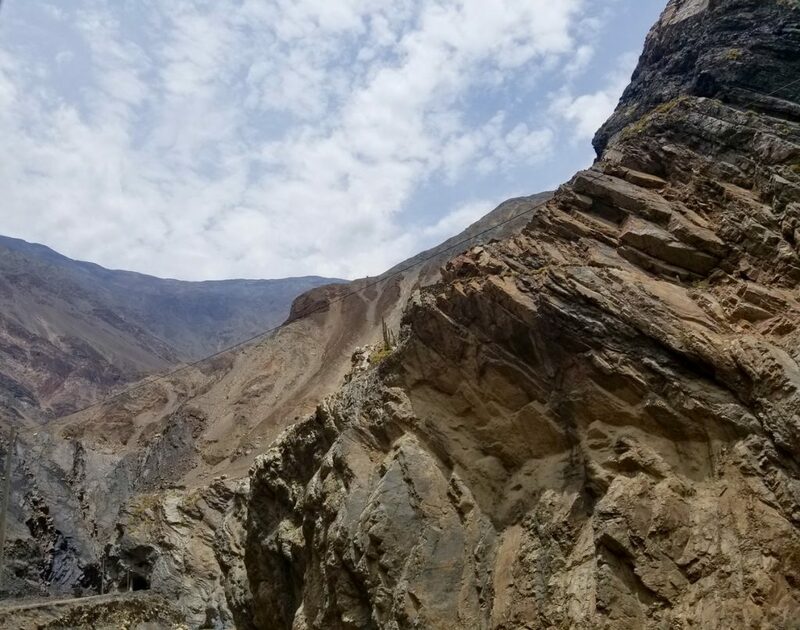 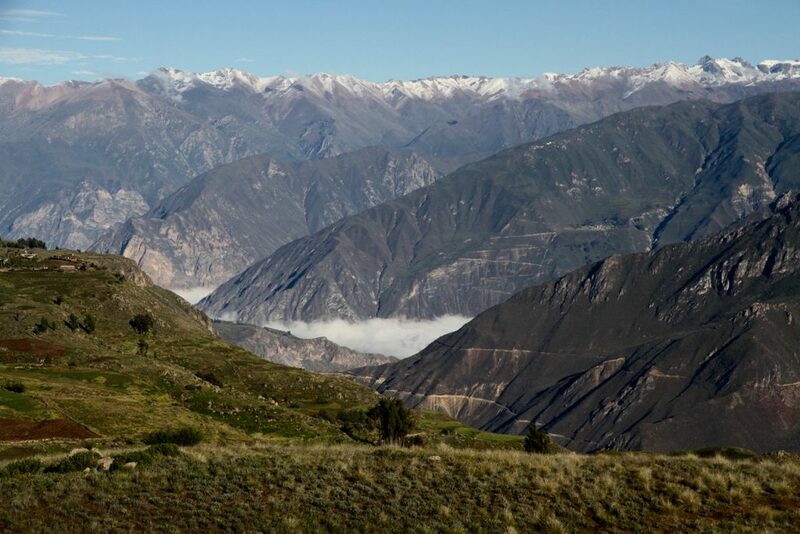 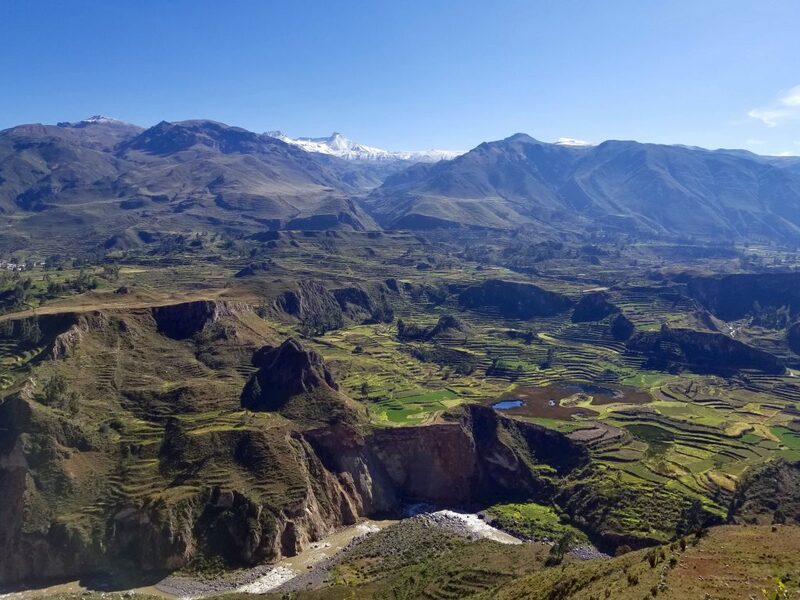 The Colca Canyon, deeper than the Grand Canyon, is a stunningly beautiful part of Peru. 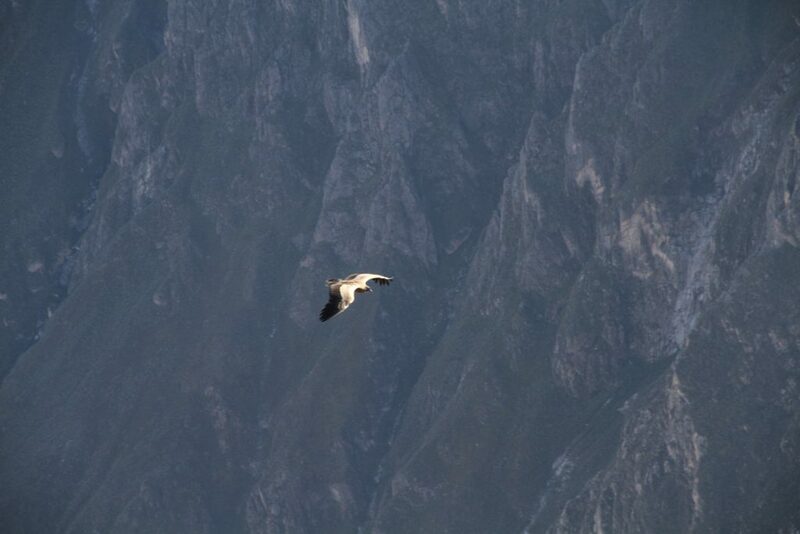 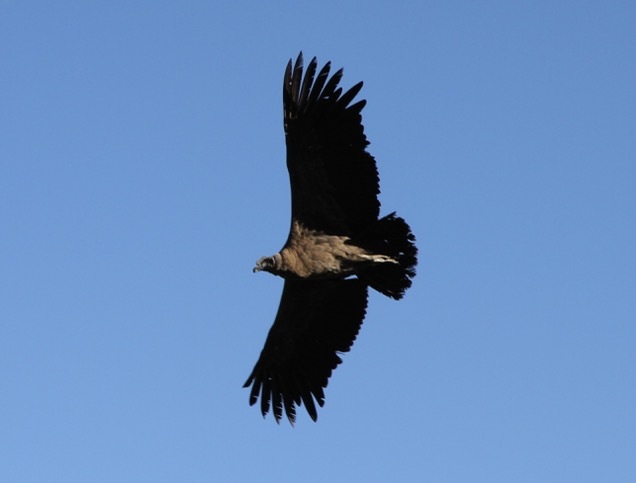 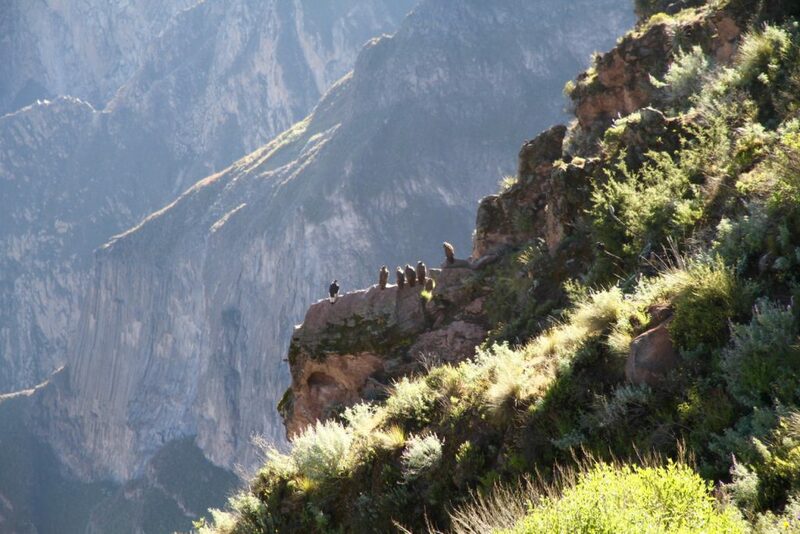 Colca Canyon is home to the Andean Condor, a huge majestic bird with a 7-9 foot wingspan. 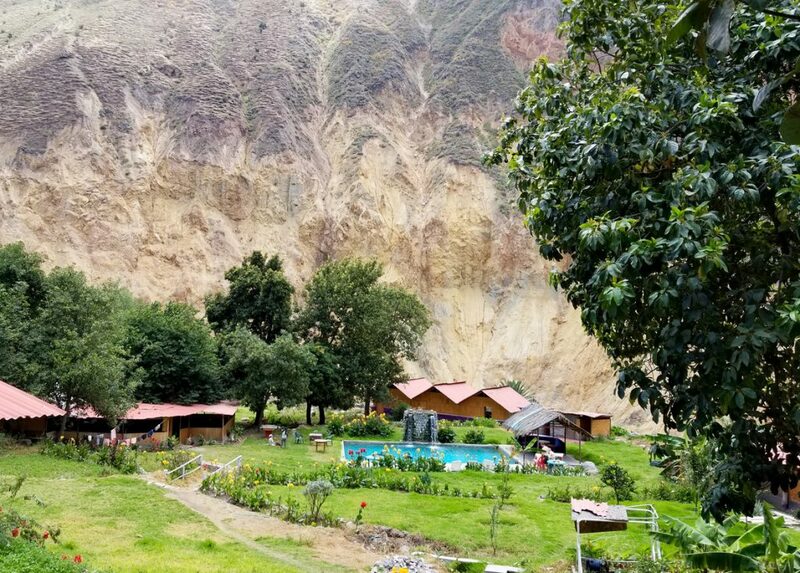 Our camp on the river at the bottom of the canyon. 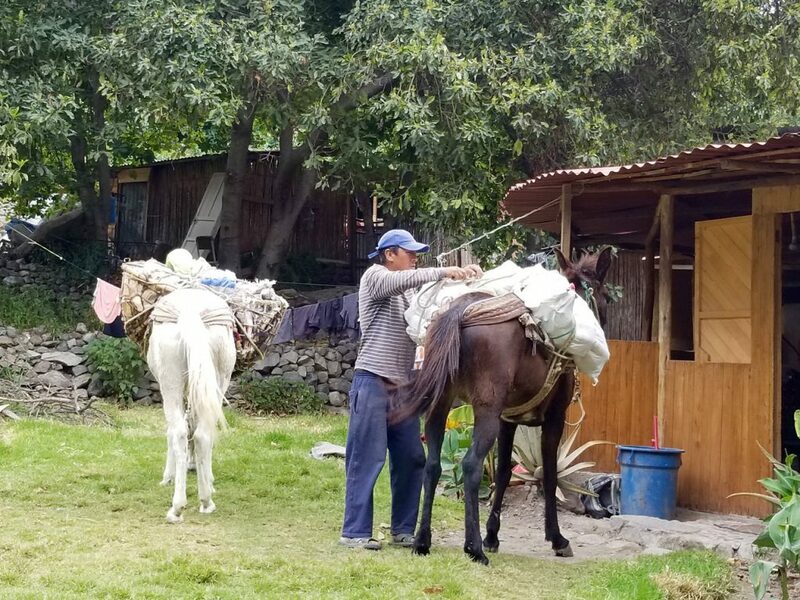 Food and beer arrive via horse. 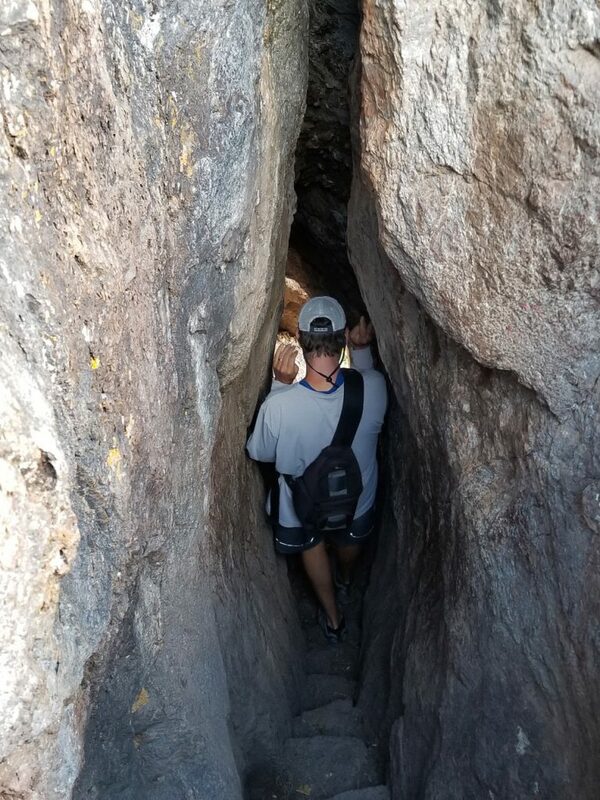 The climb back out of the canyon was a tough grind. 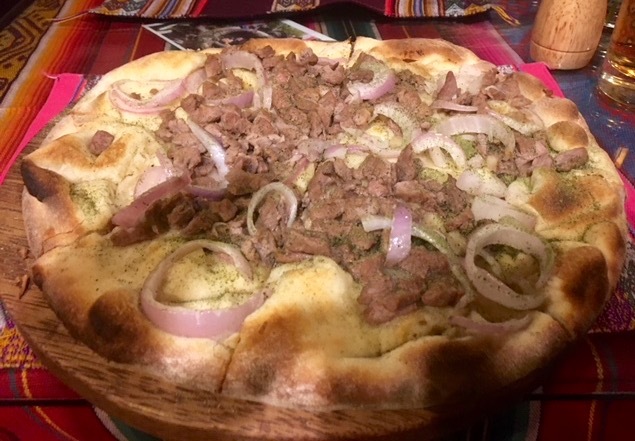 At the the top, back in the town of Cabanaconde we were more than ready to dig into this delicious Alpaca pizza. 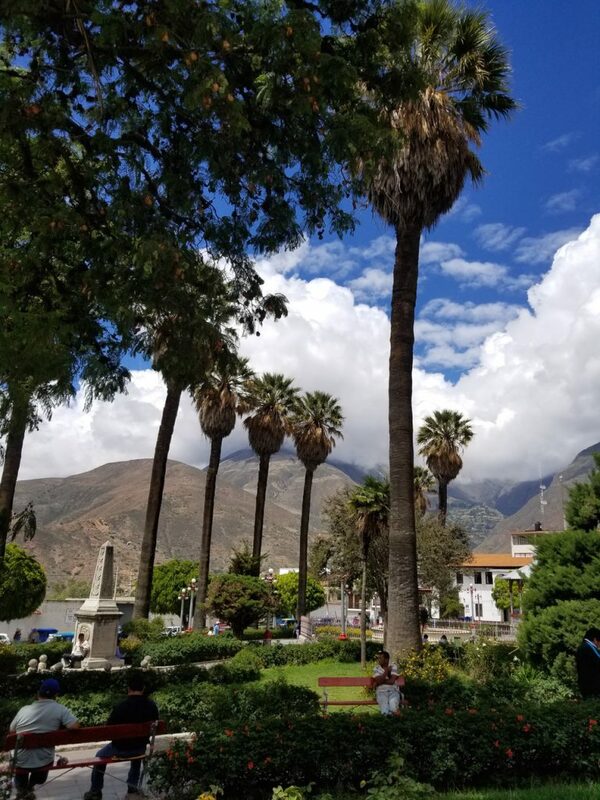 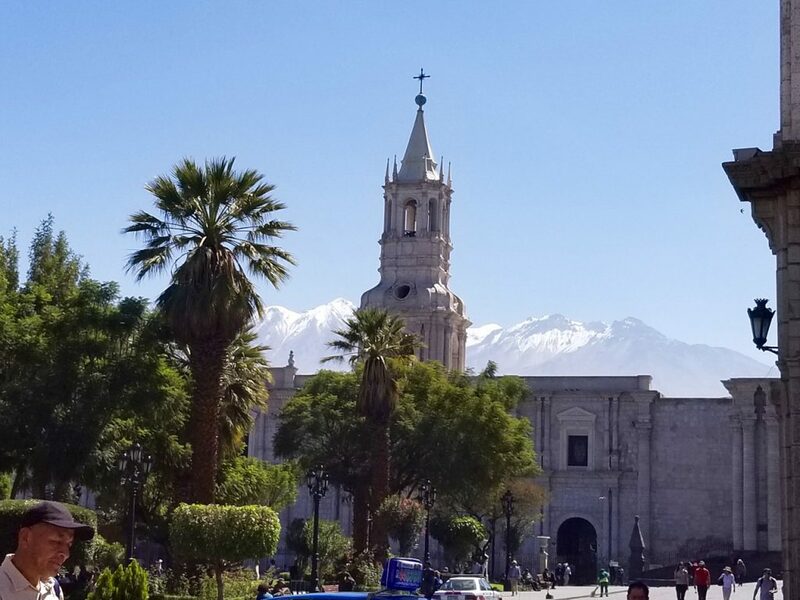 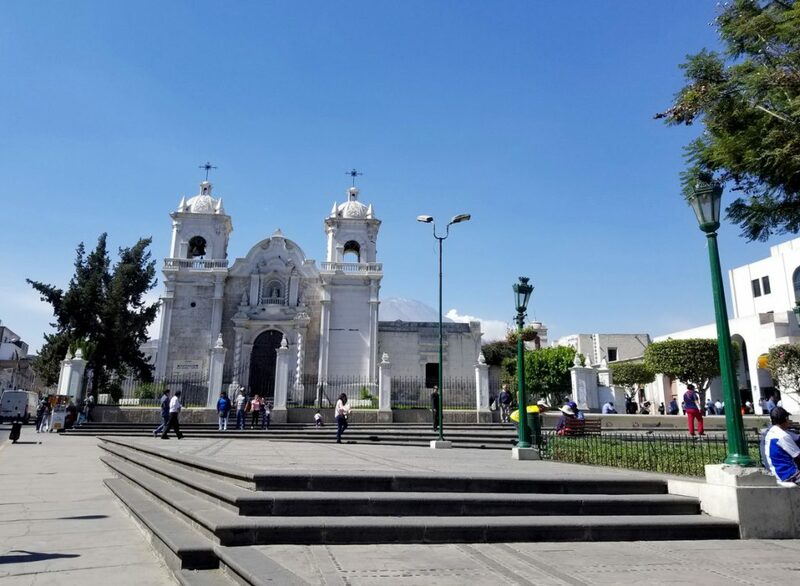 More great food and scenery was to be had in Arequipa and after a little work on the truck we would be ready for our crossing into Bolivia. 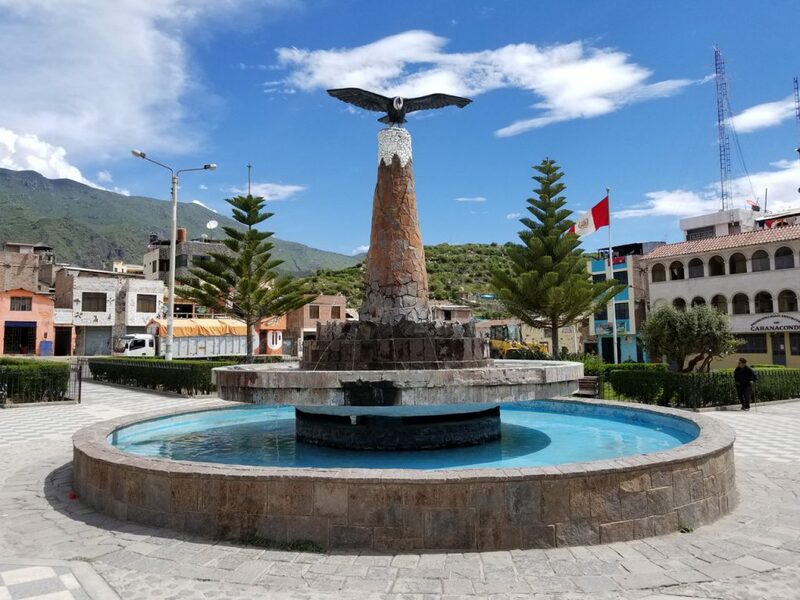 Next stop Lake Titicaca, Bolivia!